02.09.2015 I am not letting go of Polyporaceae. Here is one Fomitopsis pinicola in the rain today. PS did you know that some butterfly larvae live inside some polyporaceae? 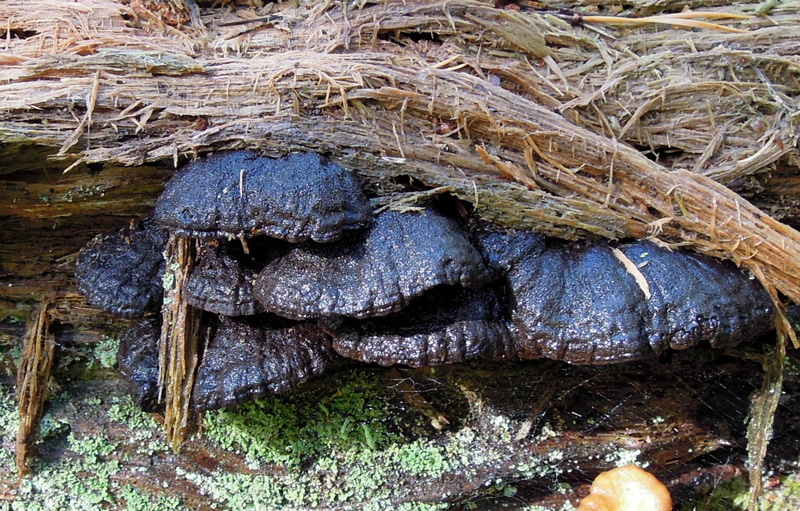 This Fomitopsis pinicola is old and almost completely black. This particular one is in the stage of starting to rot. 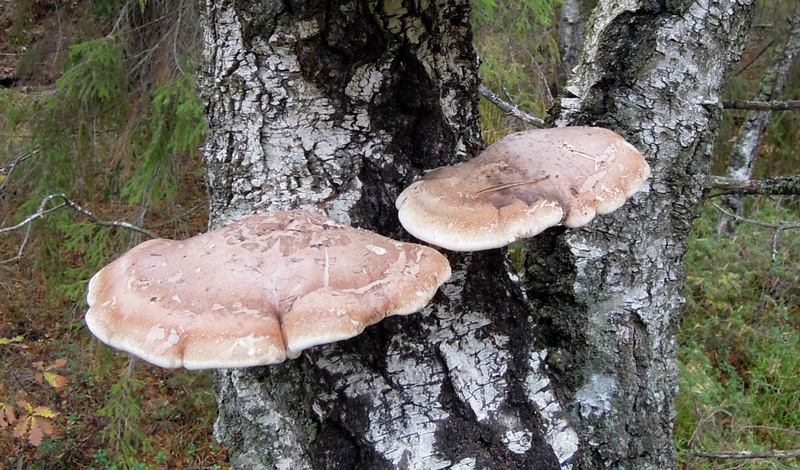 We call it rødrandkjuke (Fomitopsis pinicola) English name is Red-Belt Conk. I have shown that it can be in many colors and red is not always there. Sometimes not at all. 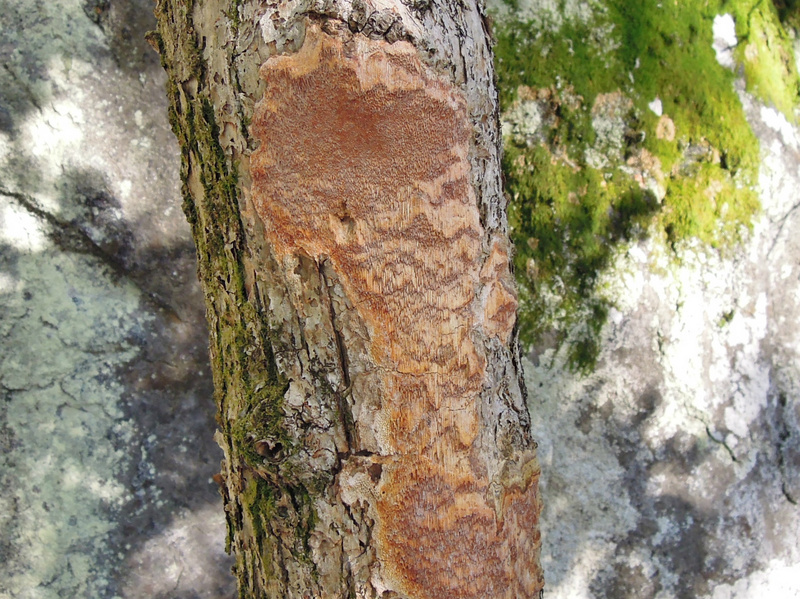 I also found this on a pine today.Tyromyces chioneus? 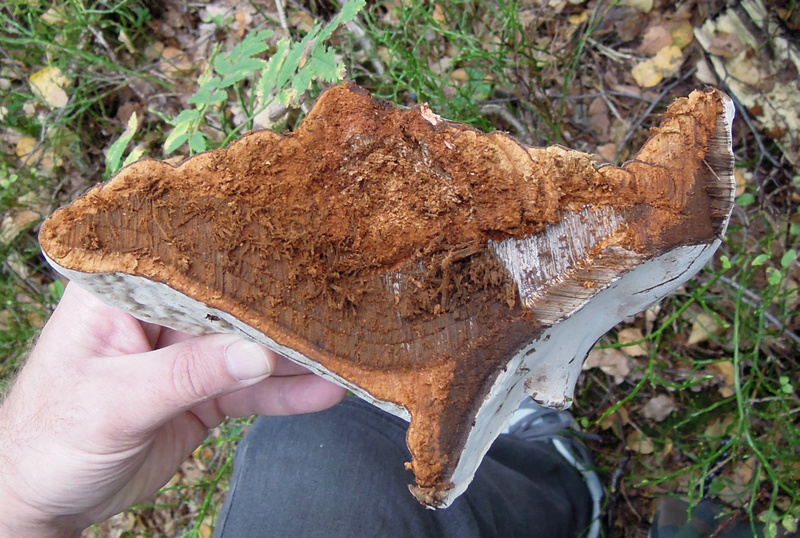 03.09.2015 did you know that some of the remains from the dry rot caused by Piptoporus betulinus are used in the watch industry as a polishing agent? 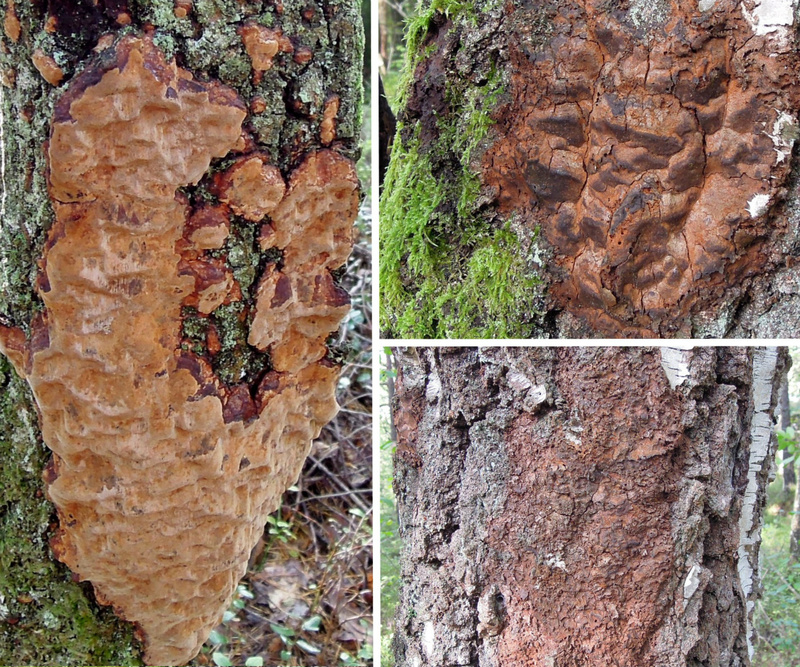 info from Cappelen and Halvor Solheim + various sources: The Ganoderma applanatum produce the spores over months and with an incredible number. It drops the spores from the pores. These spores are spread by all the factors i have mentioned in pictures page 14 + by the rise and fall of temperature factors. 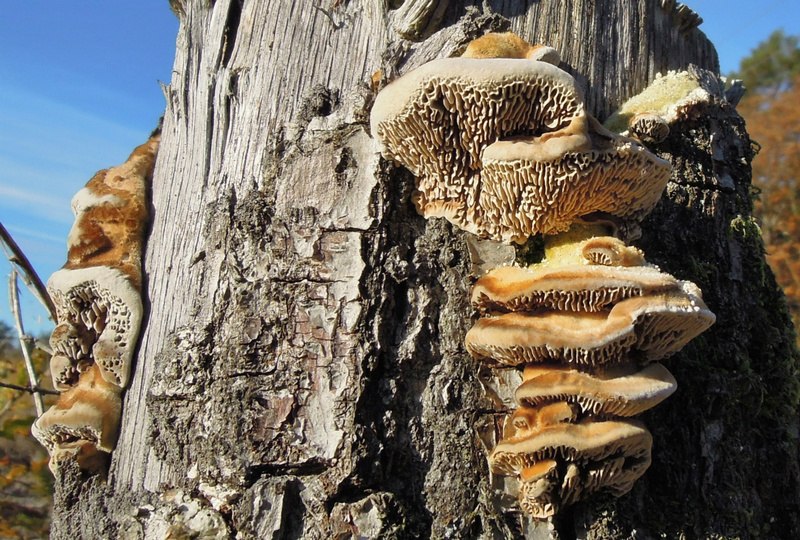 The reason why so many spores land on top is because they fall down again from wind, temperature and because of the shape of the polyporaceae. 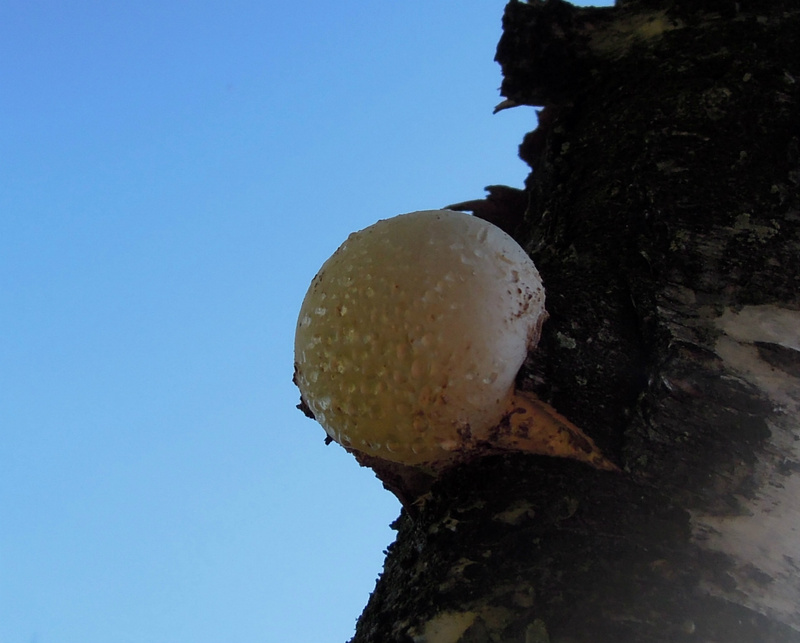 Because it produces so extremely many spores it can be fully covered on top and around it. another important factor that i took notice of is after the rain. The rain washed away the spores. This should mean that the spores will travel by water, streams, rivers and moist. 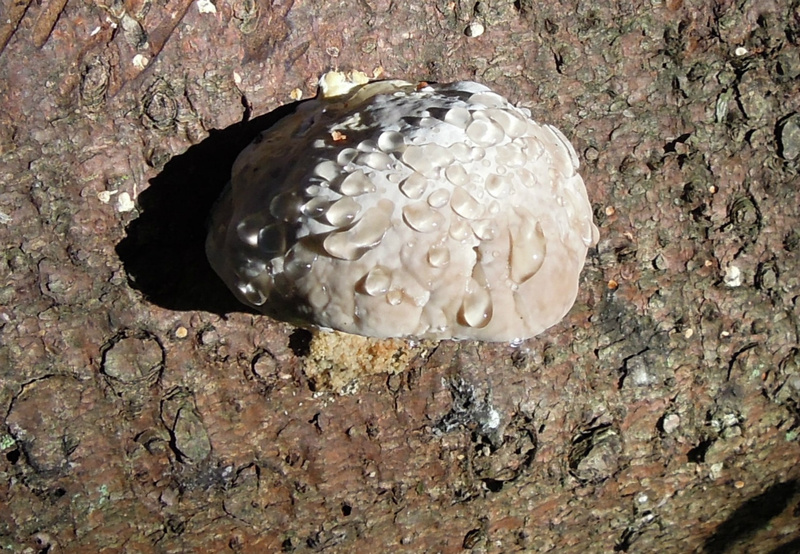 underside picture with flash...Spruce log if i remember correct..
Piptoporus betulinus usually starts up as a ball that comes/bursts out of the Birch bark or from an opening. Sometimes it forms from a abnormal shape. 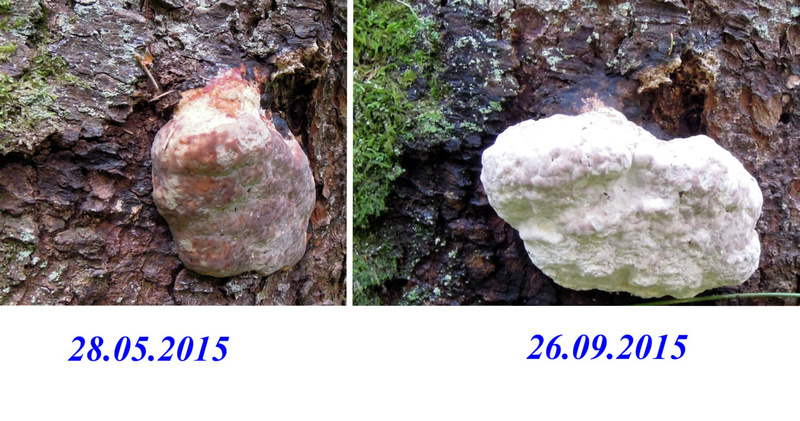 05.09.2015 Piptoporus betulinus cause brown-rot in living tree`s. 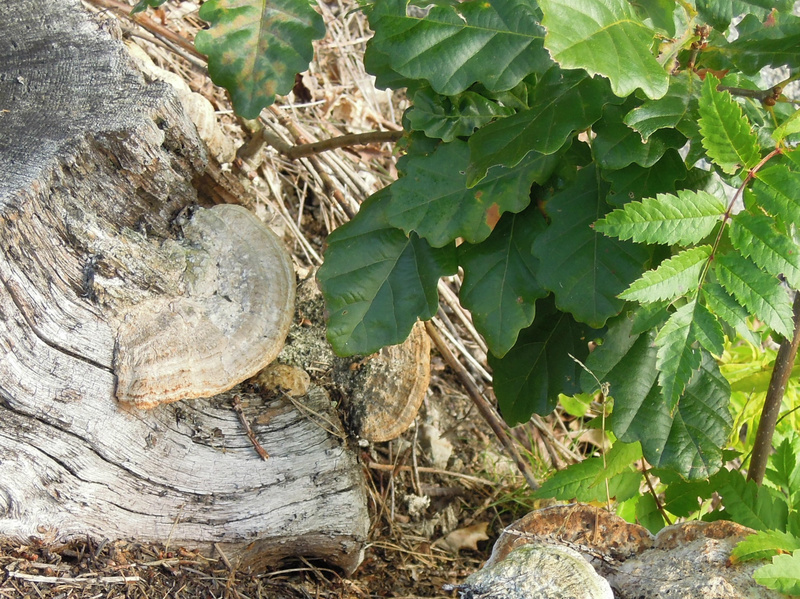 It continue to live on broken branches or fallen tree`s and develops. The ball does sometimes stop in the development and remains in this shape. 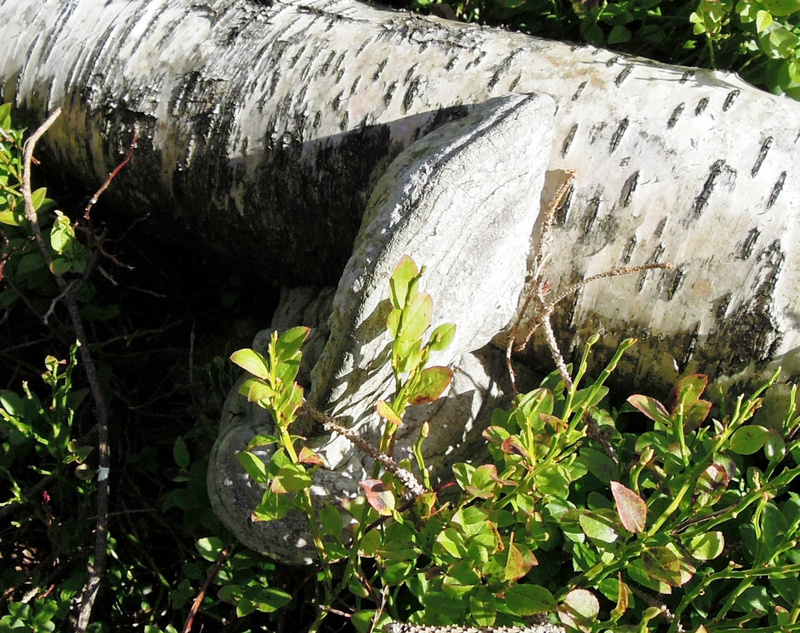 This i have seen on standing remains of a tree and fallen pieces. 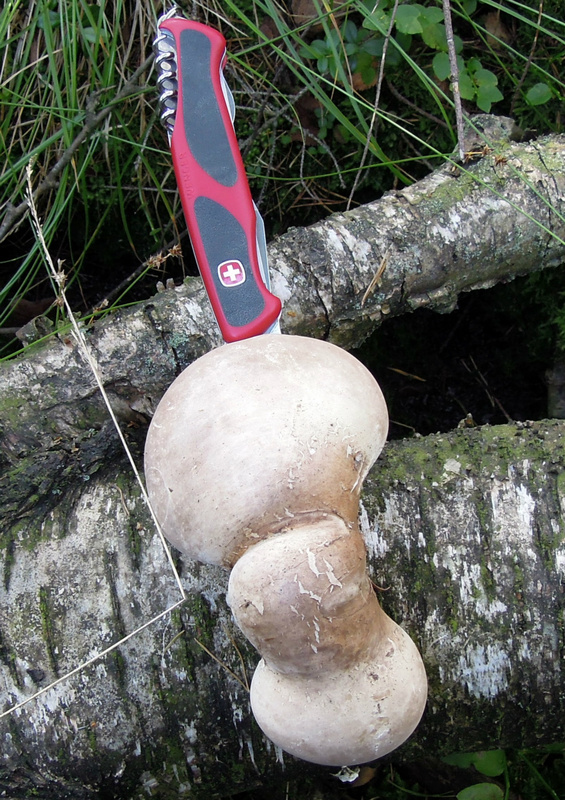 Piptoporus betulinus "knivkjuke" got an Incredible history in tradition. 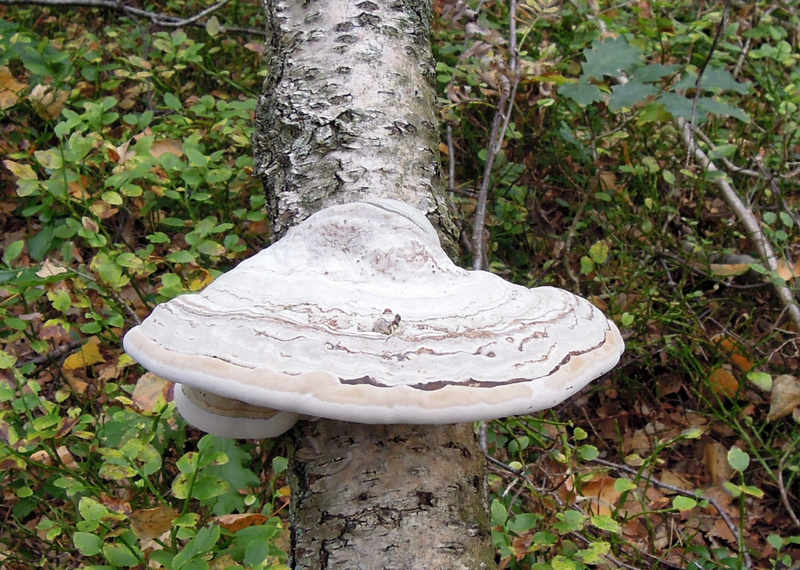 Piptoporus betulinus is on Birch and a one year Polyporaceae. I do however see that the ability to last in a form can vary. It can remain with the developed shape for two years. It likes areas with shade and wet ground. 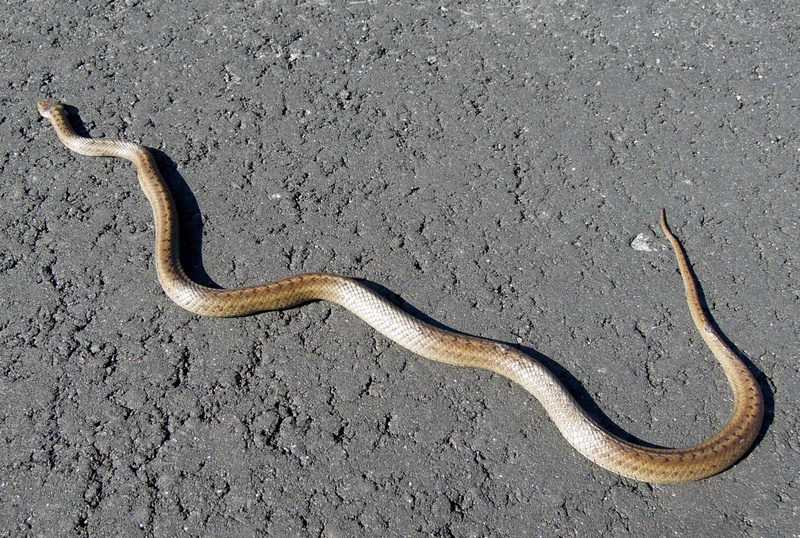 You can also find it in more open spaces with some sun. 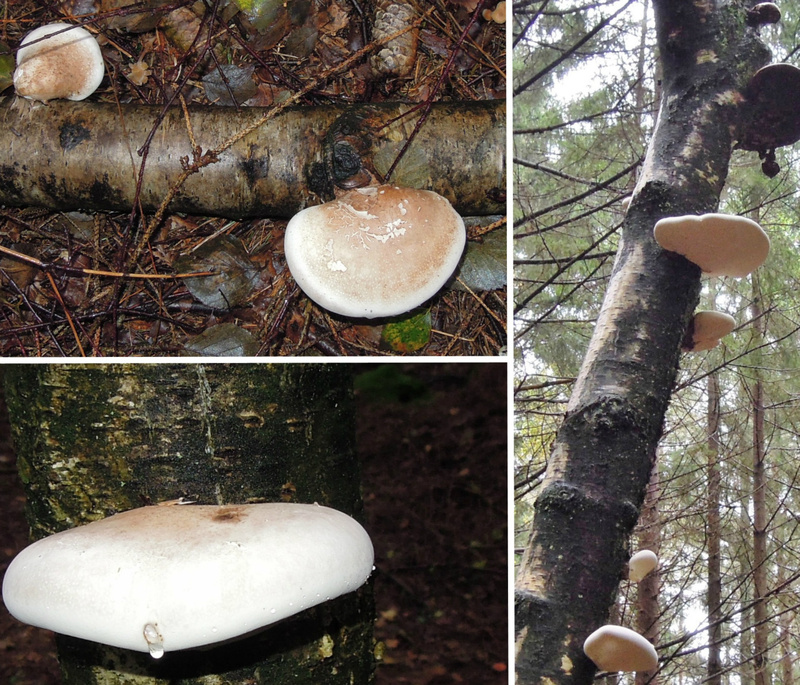 In wet areas in the forrest that got shade it can grow very well and you can find a small broken branch with many fruits shown..
06.09.15 hot dogs and burgers but first a nice fire..
07.09.2015 Used my bike today to find some more Polyporaceae and to do some reconnaissance for such..Had with me a Victorinox and Wenger tools for my bike.. 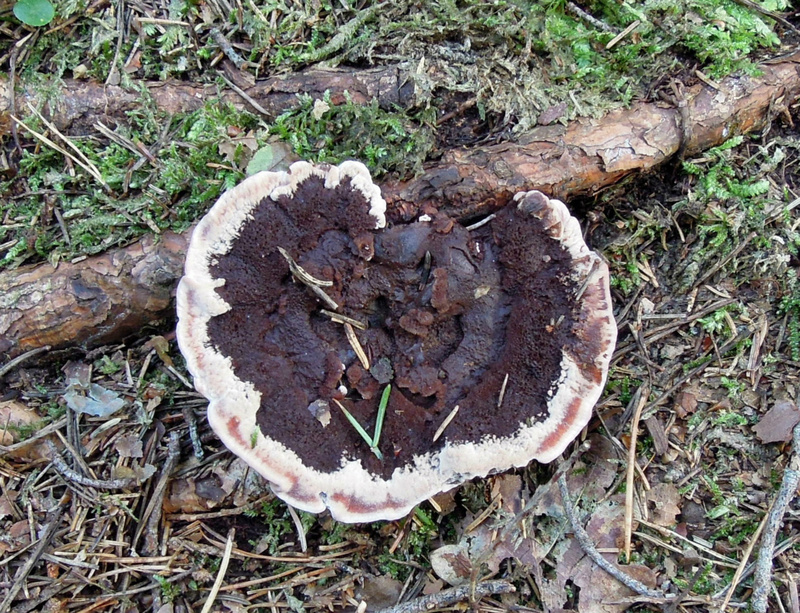 Remember this picture and that i was not completely sure what Polyporaceae?, it was not developed yet. 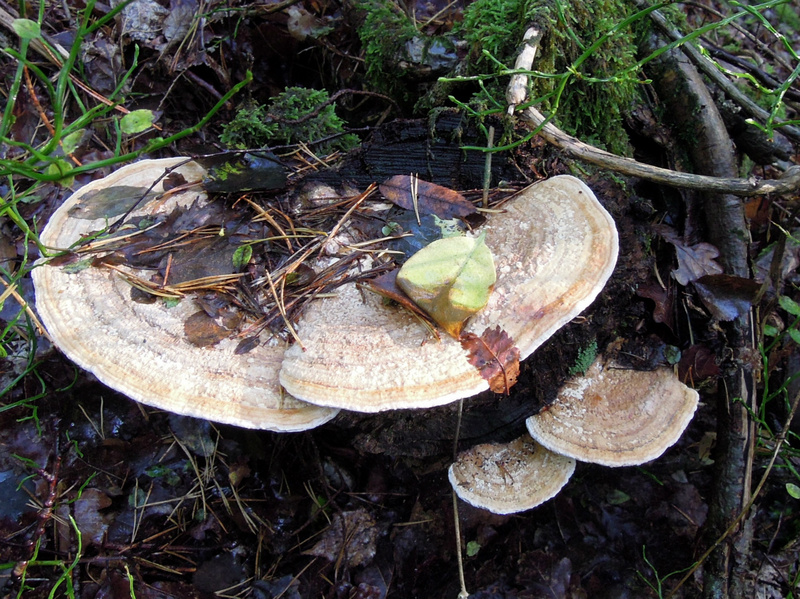 I had in mind then Fomitopsis pinicola, see next picture.. Very little doubt now. Fomitopsis pinicola! 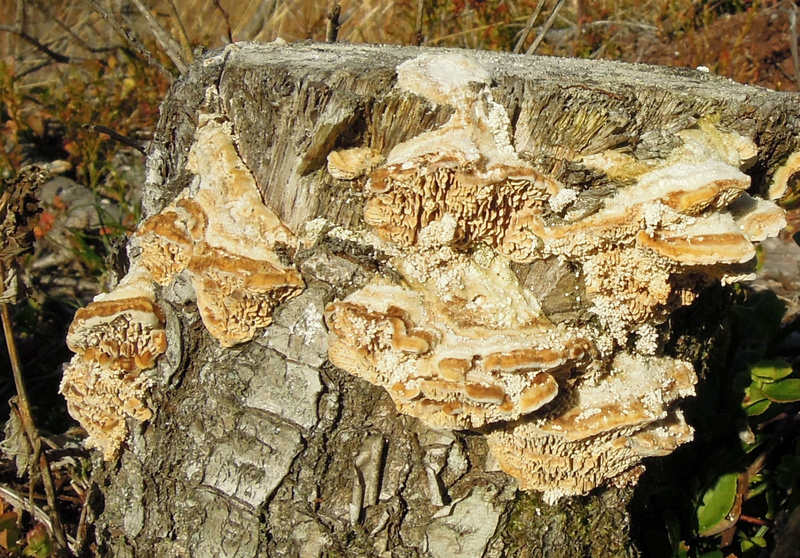 This Fomitopsis pinicola is getting old and it is located in an open area with much light and rather much sun during the day. 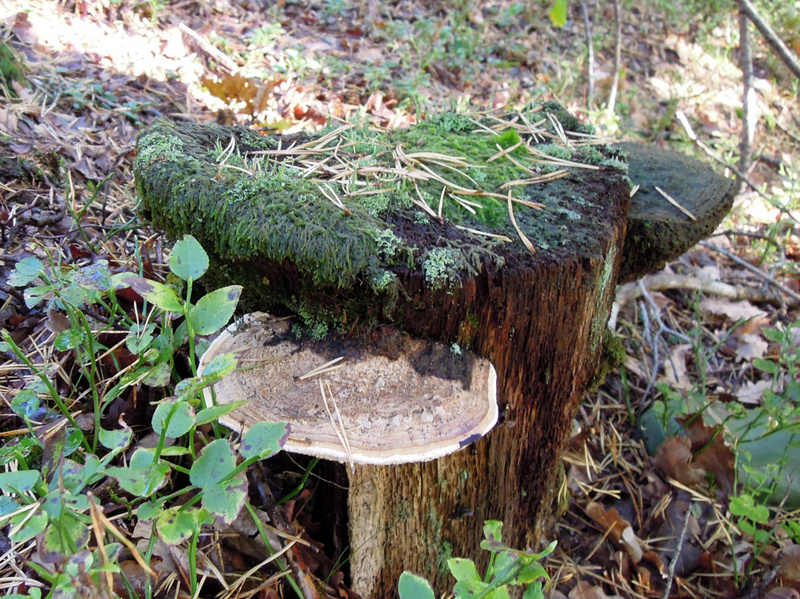 The remains of the log is standing on a wet area because of a close to a brook/marsh. 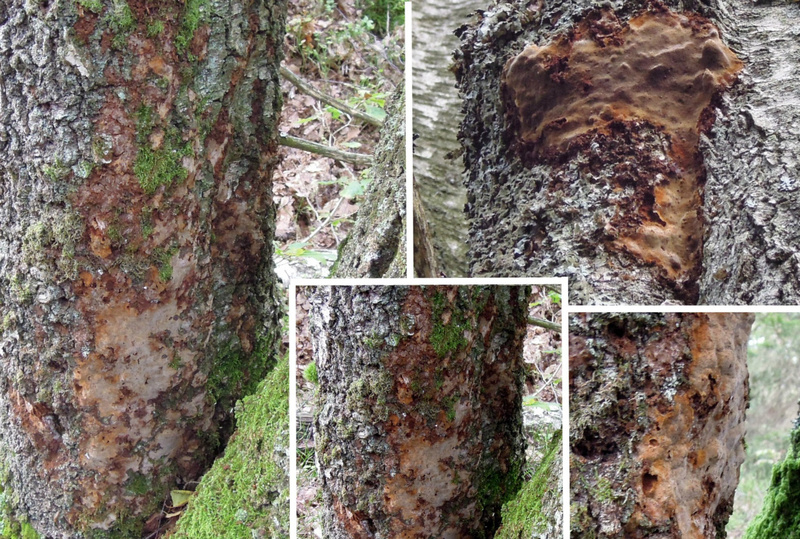 It is still active and the pores got moist..
Fomes fomentarius that is altering the level. It is a nice example on the process. It was horizontal, fell down and became vertical. Now it is horizontal again.. 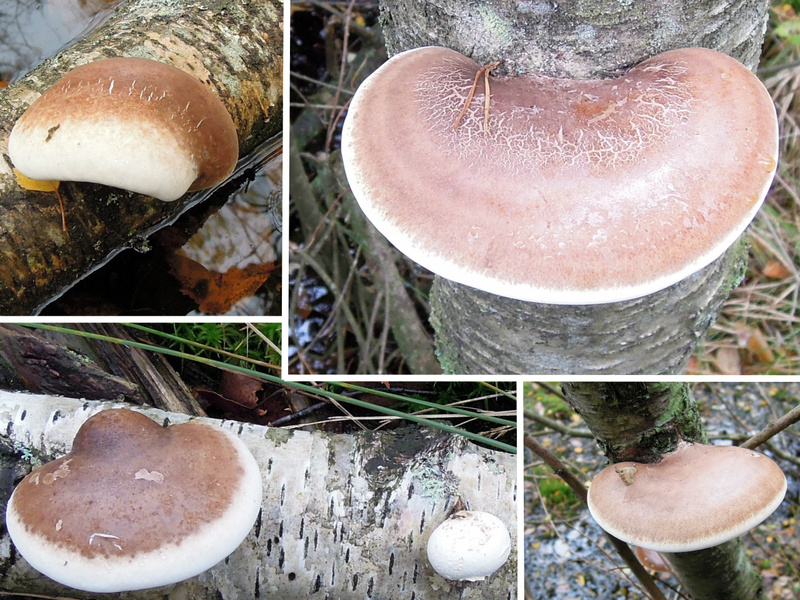 I have taken some pictures of Polyporaceae that i am not sure about for later research. Color of the day! walked around for two hours in the woods and i sank to the middle of my thighs in a marsh. 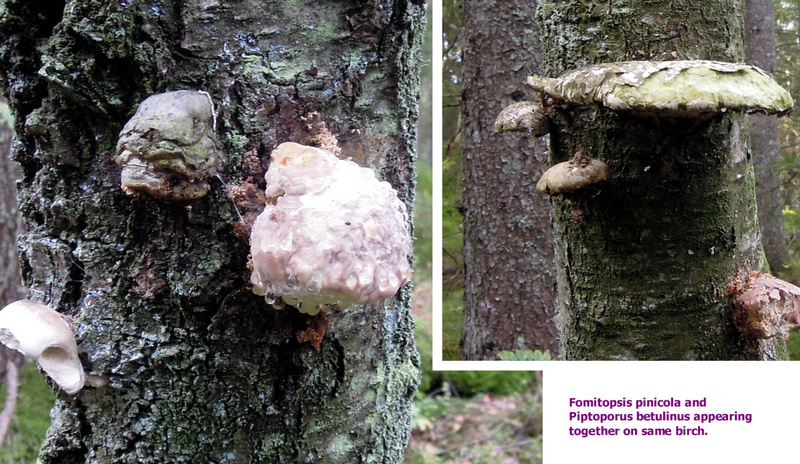 It looked safe but not :) It was a nice experience too..
Fomitopsis pinicola in special development. Here it is leaving. 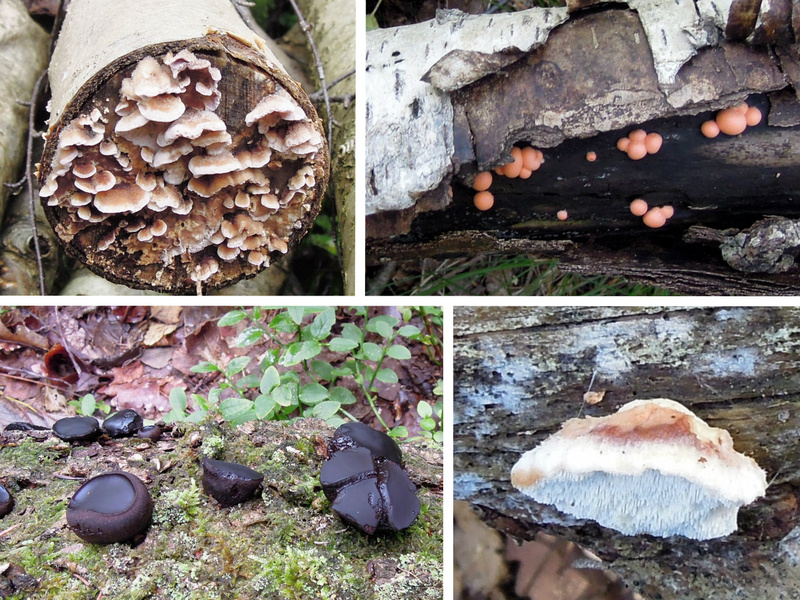 Hunting for Polyporaceae i noticed how everything in the nature got its place. I do wonder if everything that can move helps spread pollen and spores too. This Slettsnok got a good size but i have seen far longer/bigger ones..
09.09.2015 usually never do this. 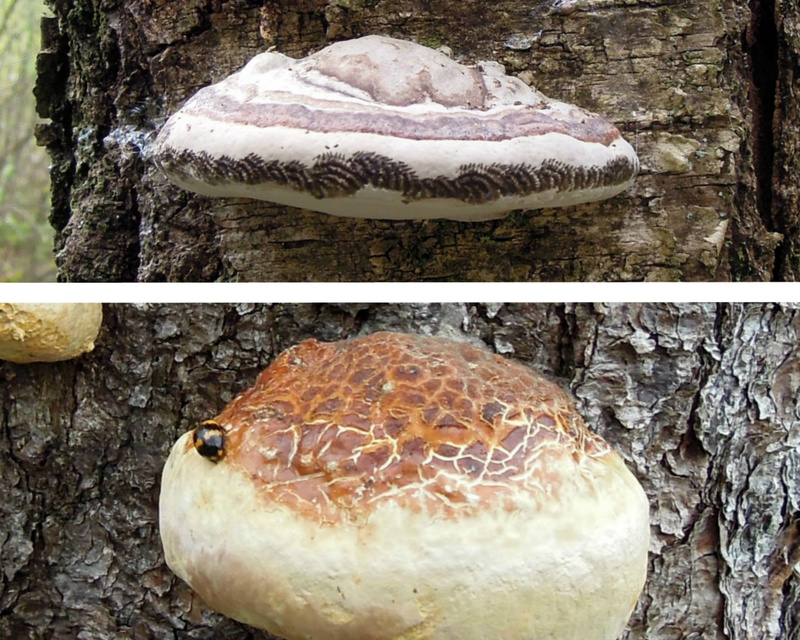 It is to show about Fomes fomentarius. 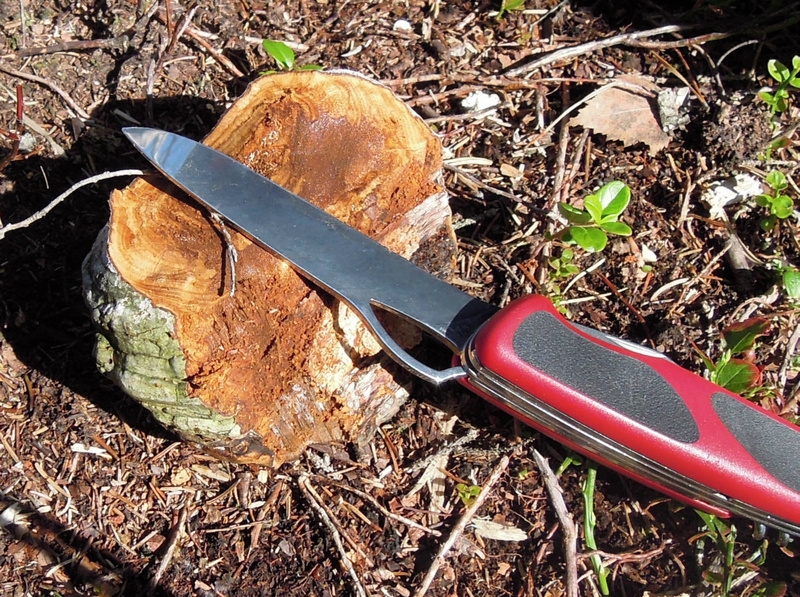 The Ranger saw and blade works very well for Polyporaceae tasks. The tinder part is under the skin, there are different methods for preparing it. Slice of pieces and dry it in the sun or with heat. Or soak it in water and hammer it flat then dry. 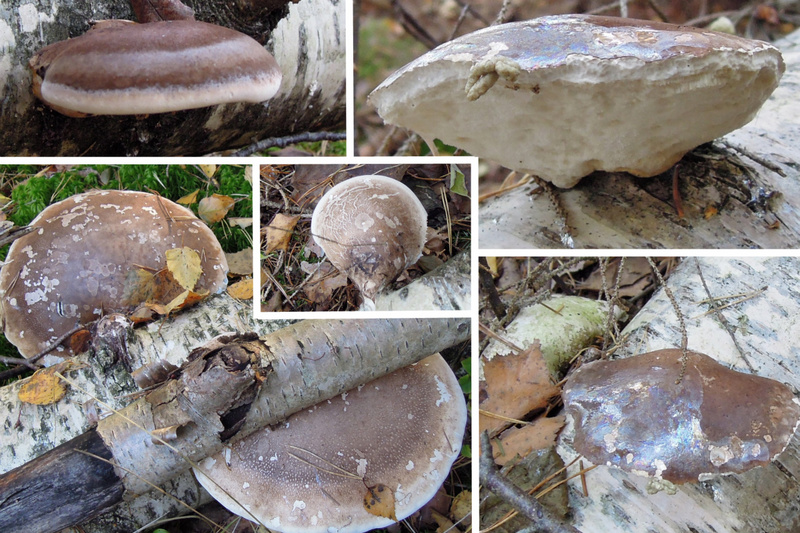 my canteen, used my bike and walked into the woods..
Close to the birch the Piptoporus betulinus contain together with the wood a color substance that is Purple/blue and really color the hand.. 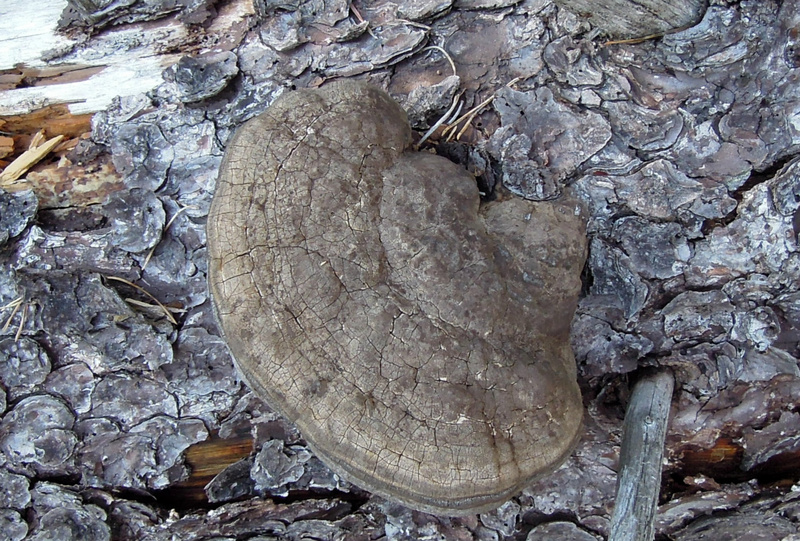 Most of the Fomes fomentarius contain the tubes with the pores under. There is not always so much tinder material on them. It is loced under the crust/skin and stops at the top of the tubes. 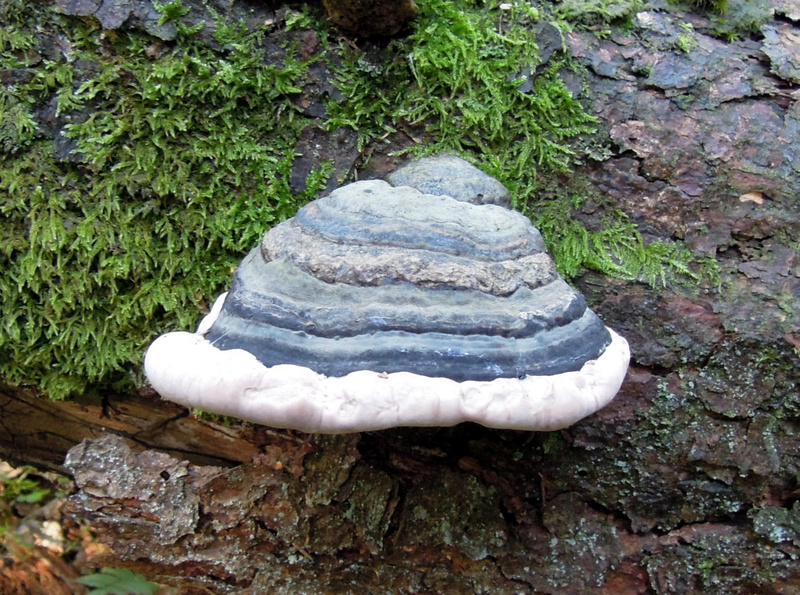 use your imagination and look on the Polyporaceae, what do you see? See next picture and i will show what i see! I am aware of the different families. 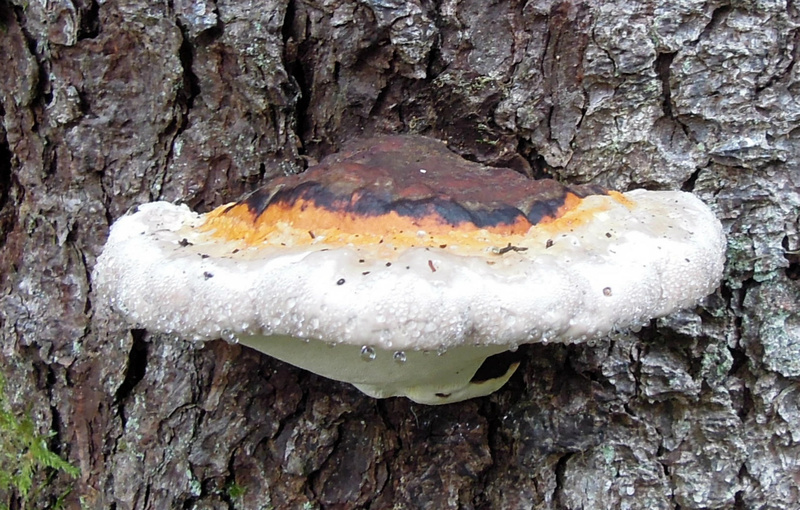 I call the ones with pores like you know Polyporaceae. 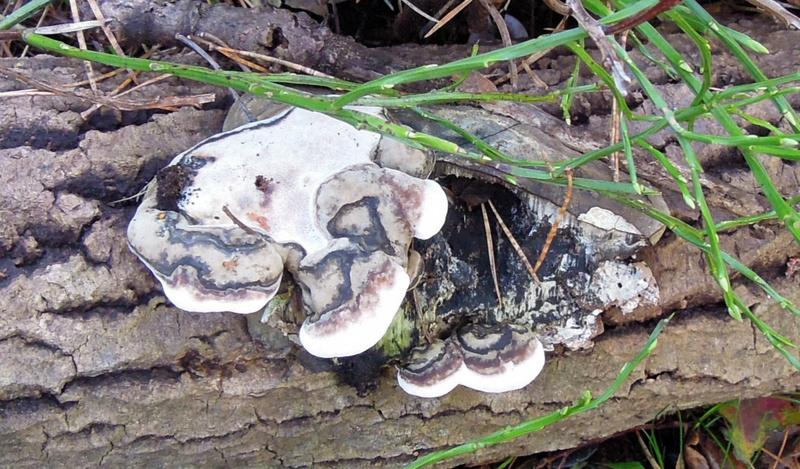 Piptoporus betulinus also got pores. 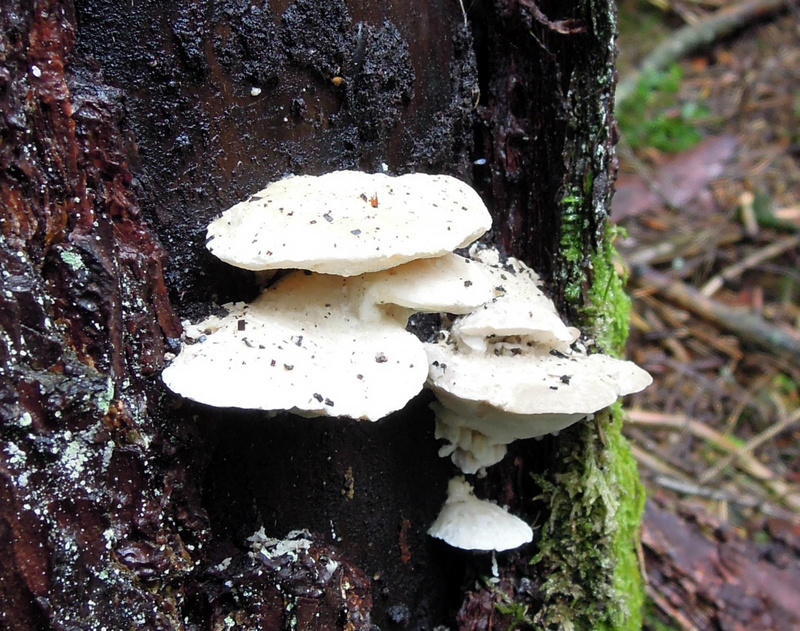 Polyporaceae is what most say. Am i correct? : an evolution on them and there are a possible shift sometimes. I would really like to learn more. 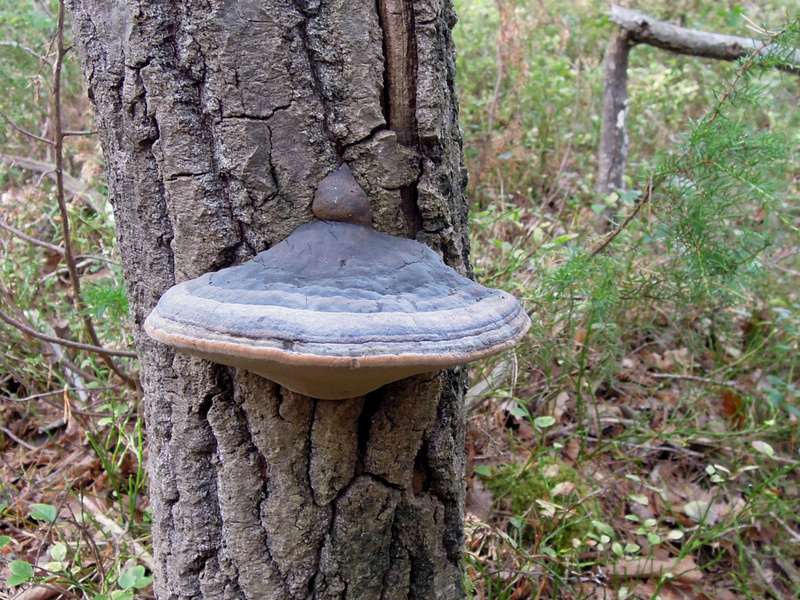 On the picture is an Fomes fomentarius Polyporaceae. 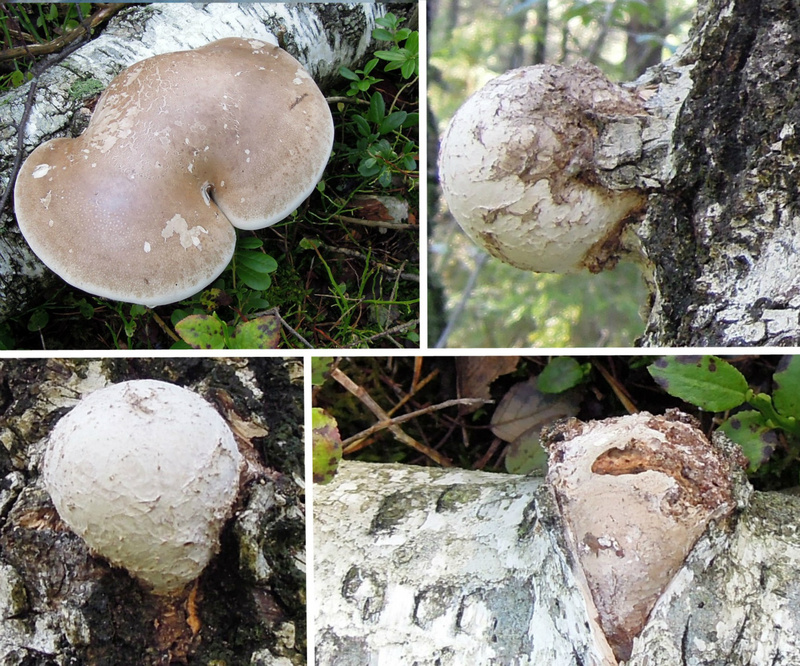 10.09.2015 Piptoporus betulinus comes with many shapes. Under it is the pore layer. On the right bottom is one example on the pores. 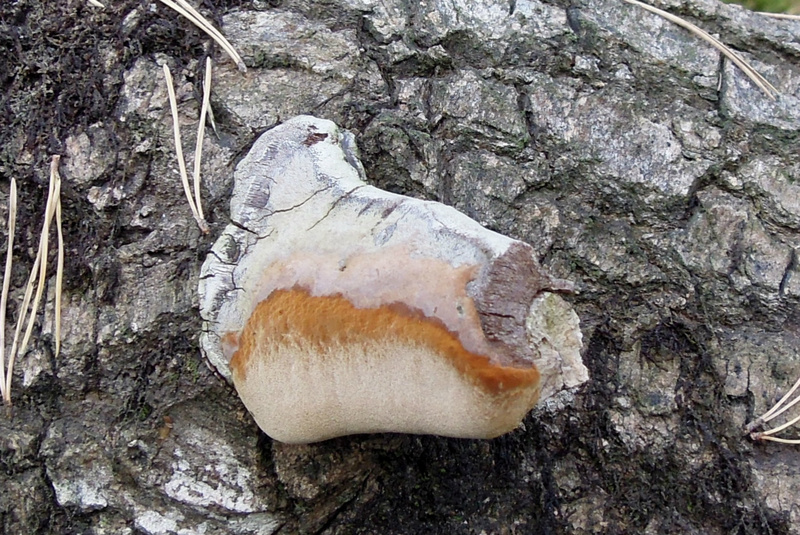 Piptoporus betulinus can grow under, over and straight out. On standing tree or fallen log/pieces. 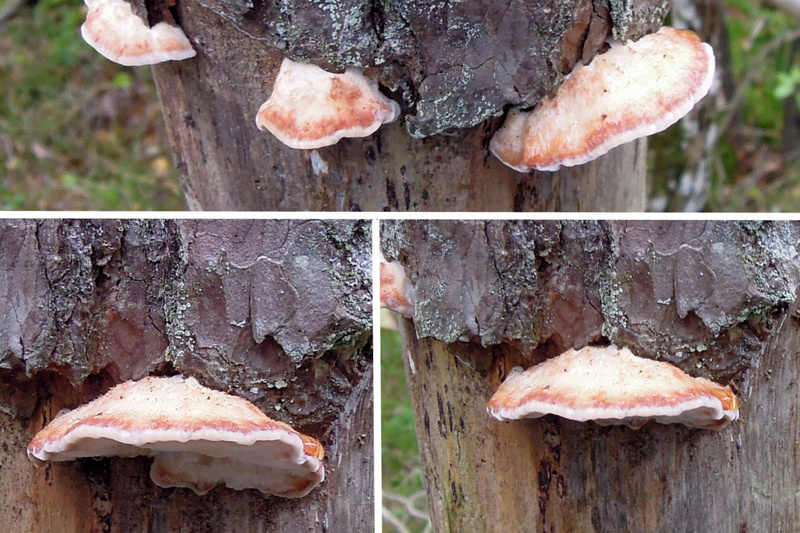 Piptoporus betulinus break the tree or branches into pieces. 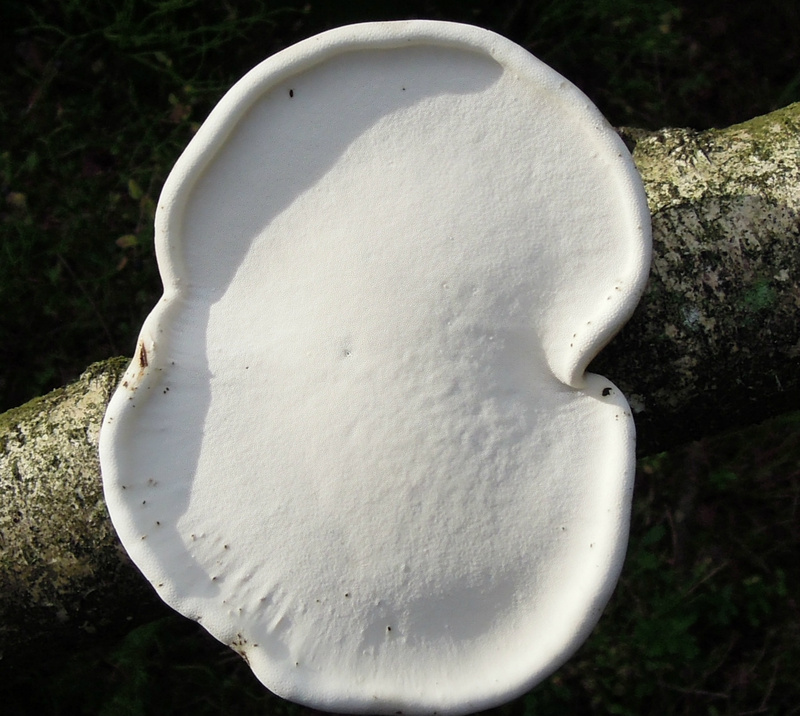 The rim or edge on Piptoporus betulinus can vary. 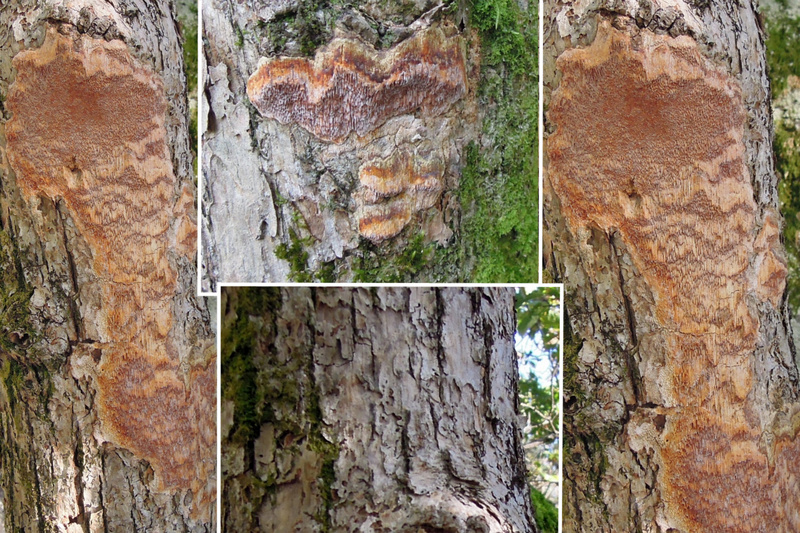 Under it was many tiny insects..
Piptoporus betulinus infects living tree`s on openings in the bark. In the different pictures on Sakhome.com i have hinted some information. It is a one year fruit. 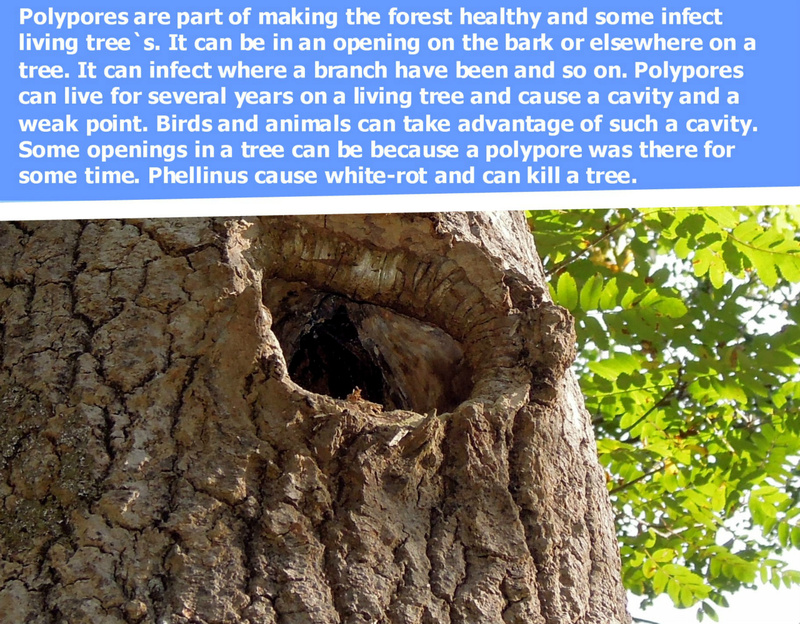 However because the wood is infected it will kill the tree. 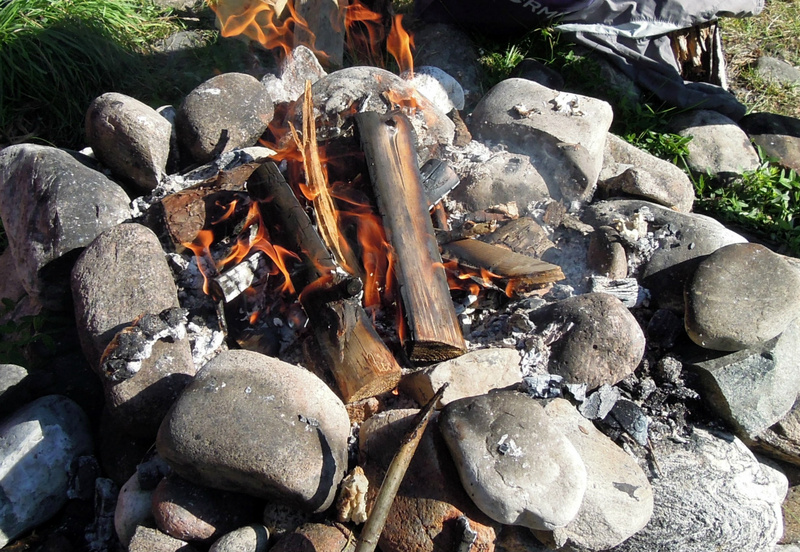 It will return or erupt out until there is nothing but small pieces left of the wood. 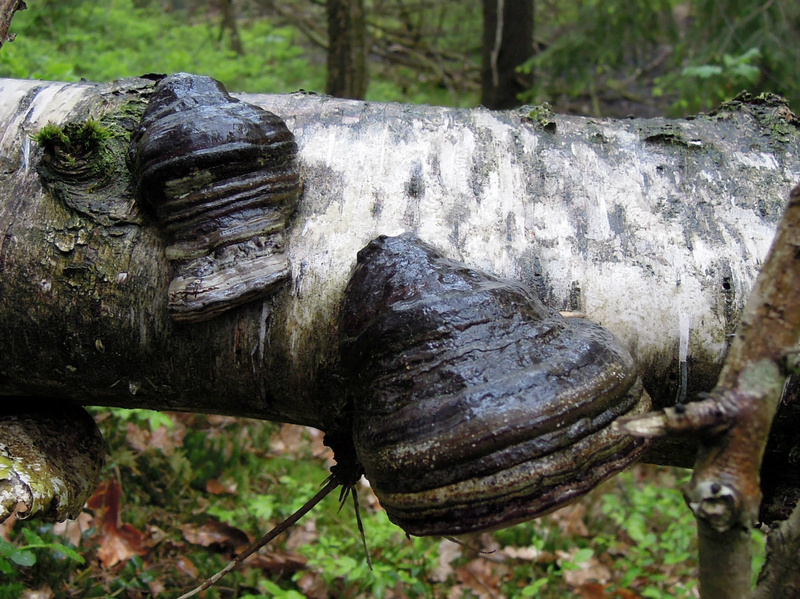 It is called "saprophyte" when the tree is dead and it continues to live on the remains. It is a one year fruit but it will continue to live in the wood and erupt year after year on any part. 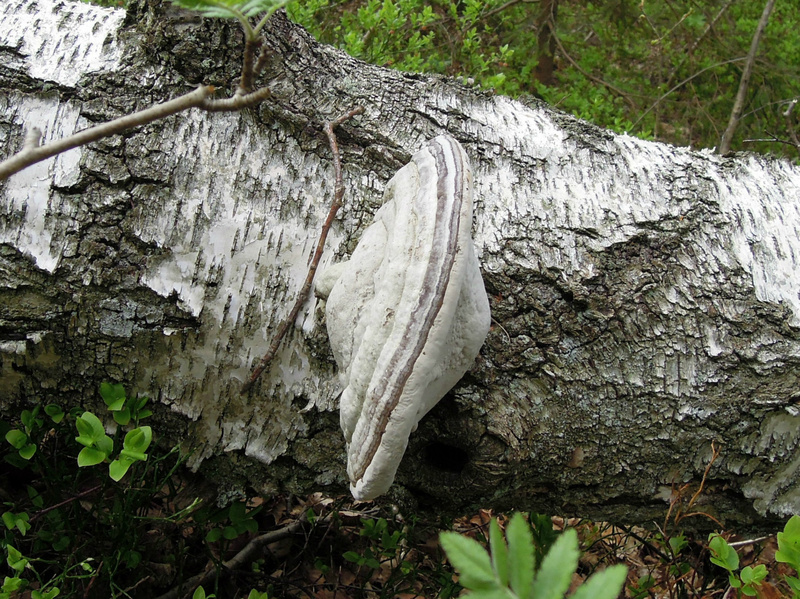 It can infect in openings on living tree`s and it can also erupt from easy openings in the dead limbs or erupt through the Birch bark as well. I noticed that when it erupts from an opening it will have better possibility for continuation from the ball shape. At this part of the year it seems more active. I recommend for Norwegian readers Halvor Solheim Råtesopper i levende trær og Rolv.no. They are experts! 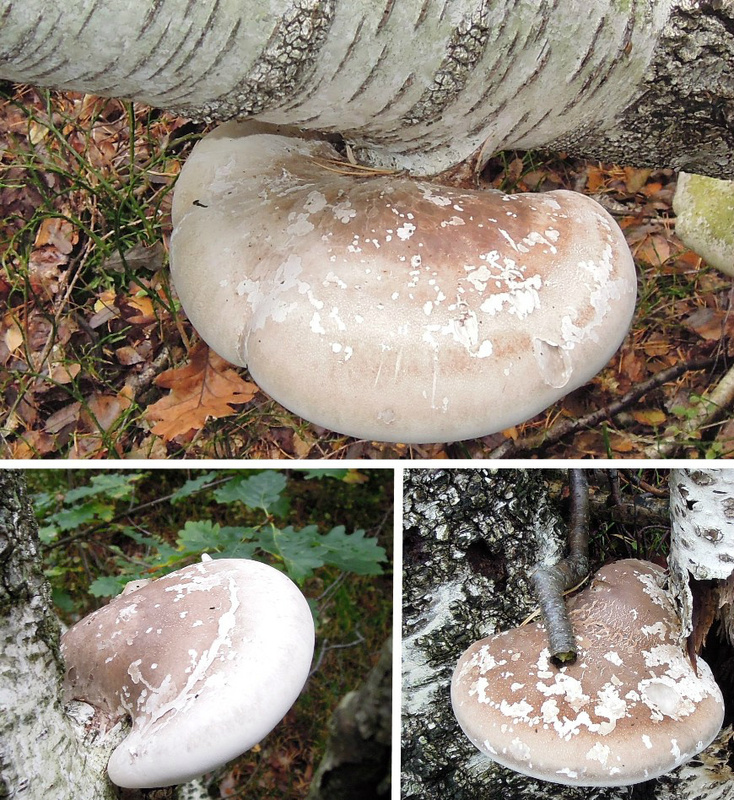 Piptoporus betulinus not so far from where i live. They do not erupt from deep within the wood. I did cut the bark at the place it was attached. See the arrows. 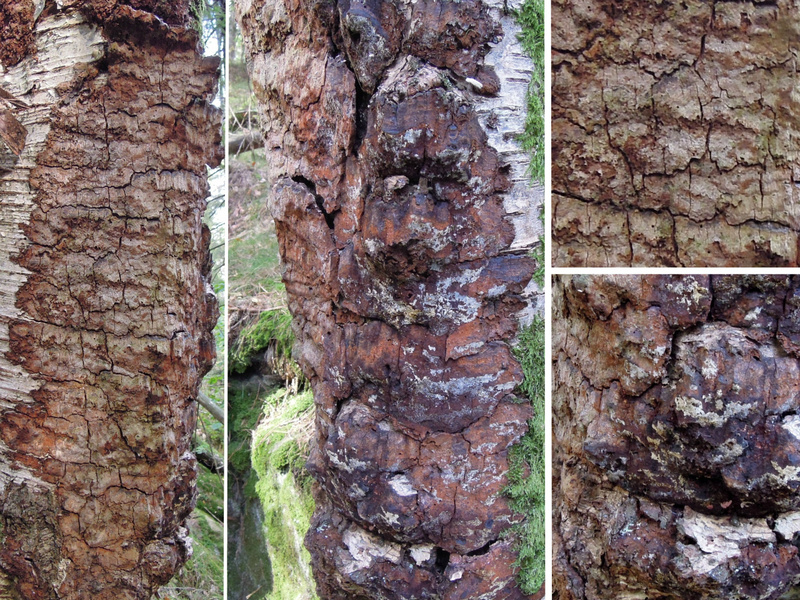 On this example it is even more clear, the wood under eruption is flat..It erupts from under the bark from the outer section of the wood at first. 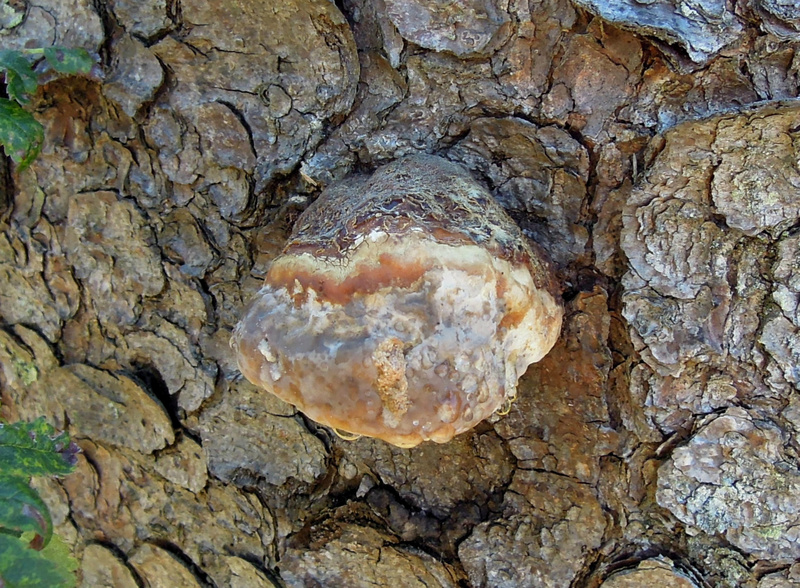 It erupts through the bark into a ball shape that forms into the well known shapes. 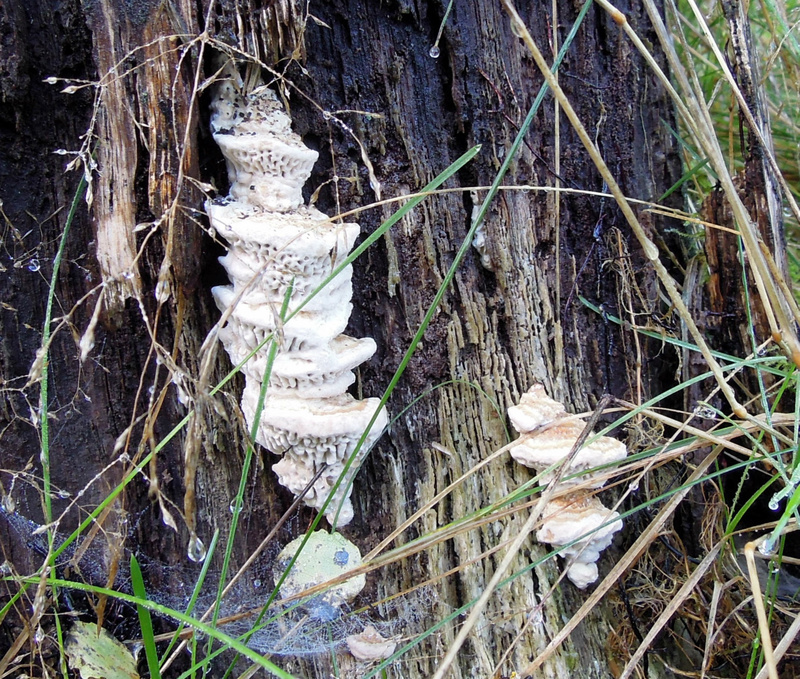 It will fall of or hang until it becomes a lump that eventually rot away..
found this Fomitopsis pinicola on my bike ride yesterday up country from the island, it is full of holes that can be in and out holes from Ciidae beetles. It is ok when it is for a reason, only small parts left of the tree anyway. If a fruit is on a living tree then it is not living for long because it is infected badly. 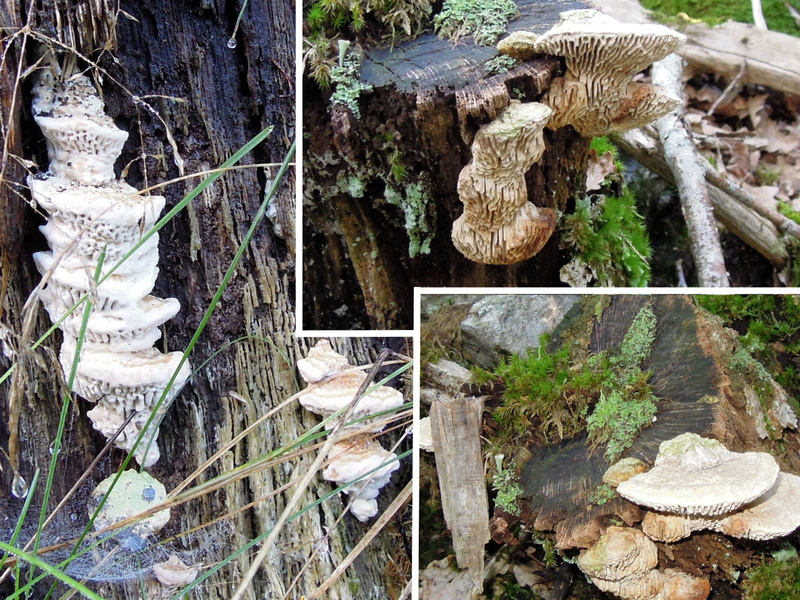 It is ok to harvest from nature and Polyporaceae are not used much anymore. 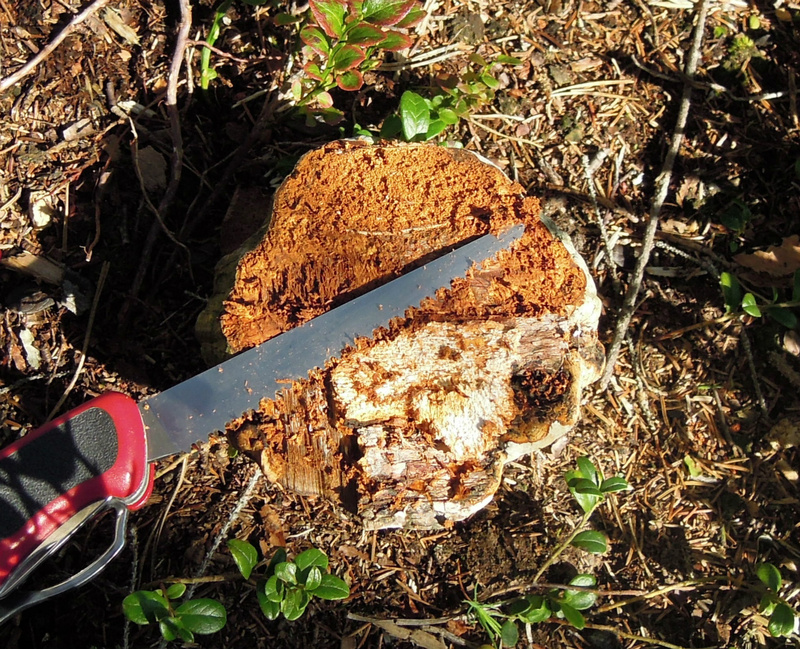 A saw is needed if you want the Polyporaceae intact. It is possible to use strength and break it of. 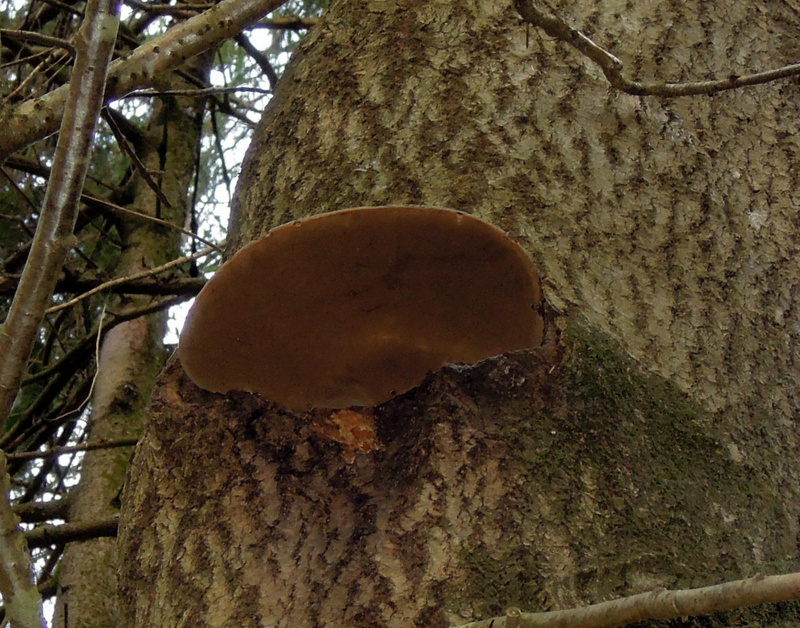 This Fomes fomentarius has grown weird and there are two holes on its right that it seems something is inside on its way out, i just noticed this on the picture i took yesterday. Here is an interesting detail i mentioned with moist drops. Could be Flekk-kjuke. On the very small one a drop came out, also on another small one. 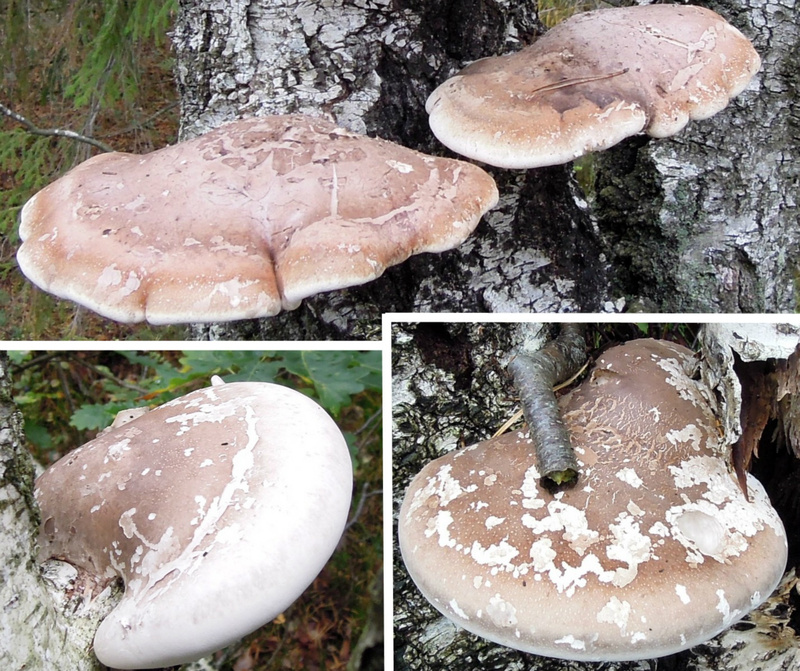 Then on the large one to the left there are the brown spots but also holes that are made from drops i wonder? I found no moist drops on this larger one. 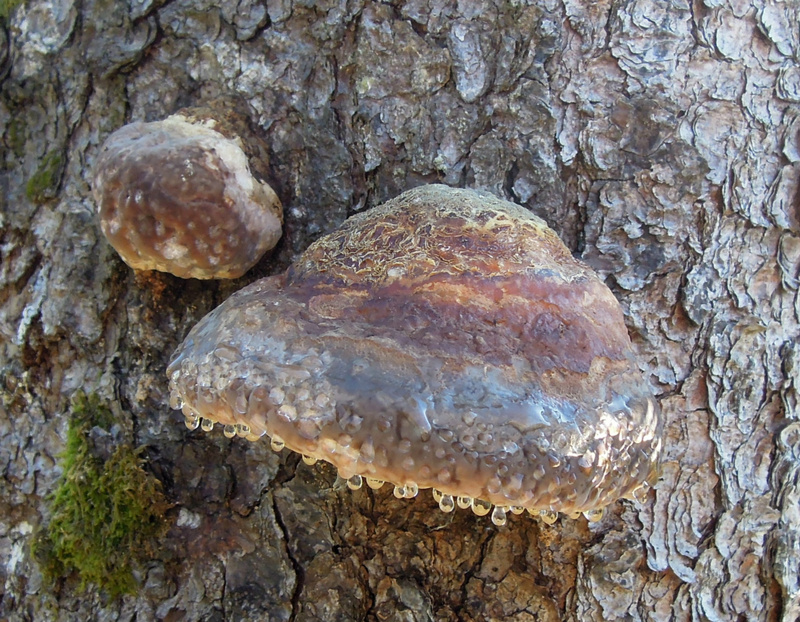 The one on the right does not resemble early Fomitopsis pinicola. 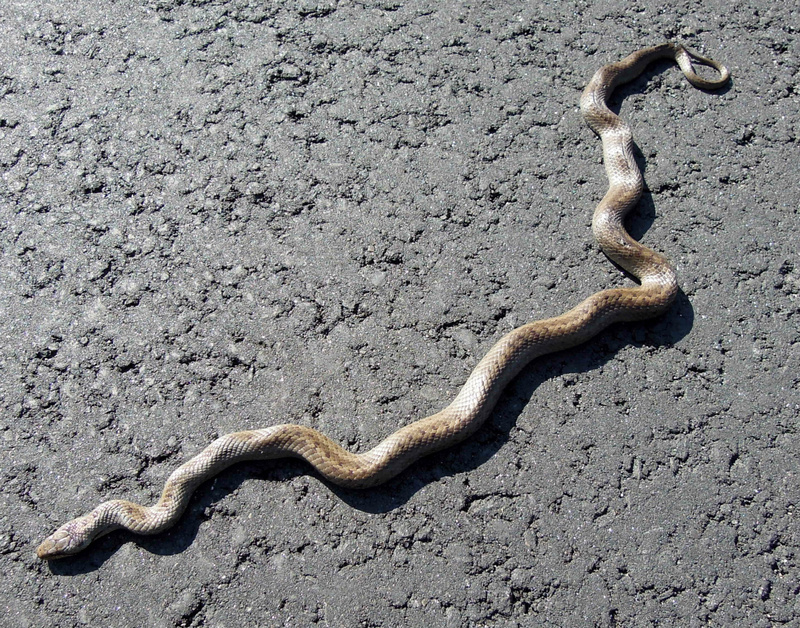 12.09.2015 Did you know that Postia fragilis will get spots/brown by touch. Hapalopilus nidulans turn purple by soap. 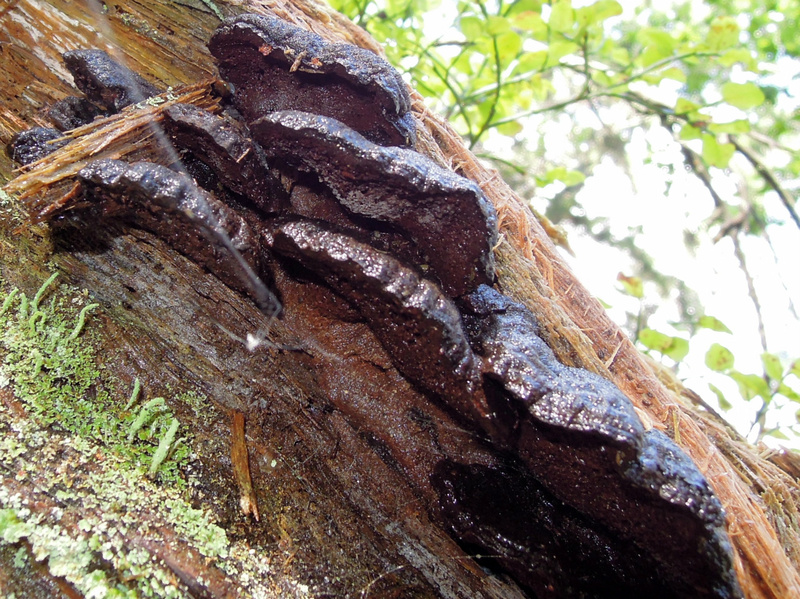 Ganoderma applanatum scratches by nail get darker. 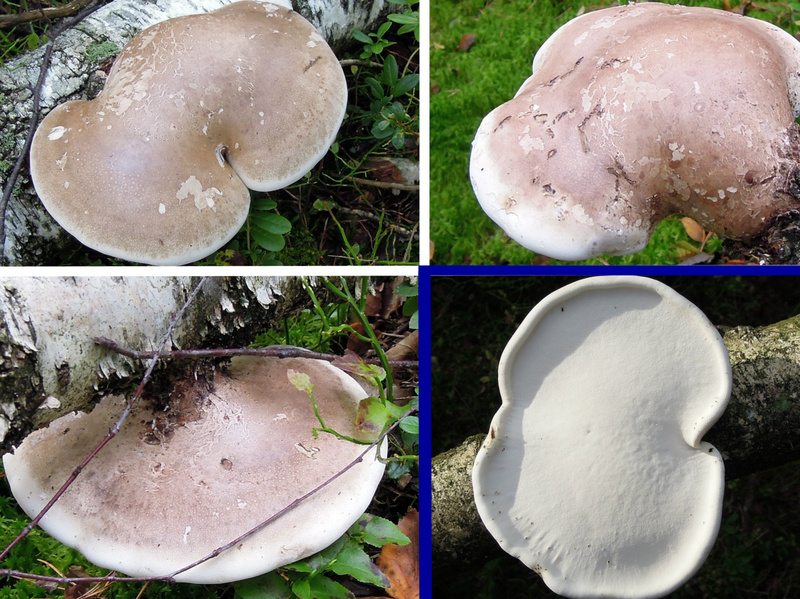 The size and shapes of pores on Polyporaceae determin type. 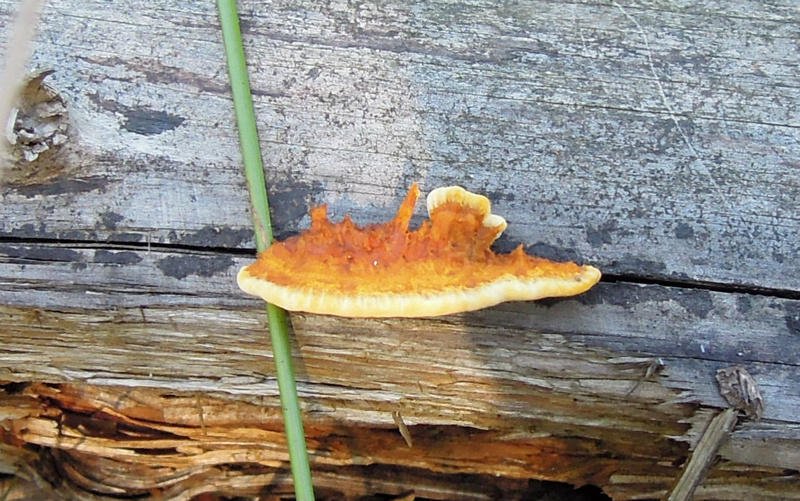 Fomitopsis pinicola get yellow lines by scratching... The list goes on. Information found on various sources on the internet + information learned and told. 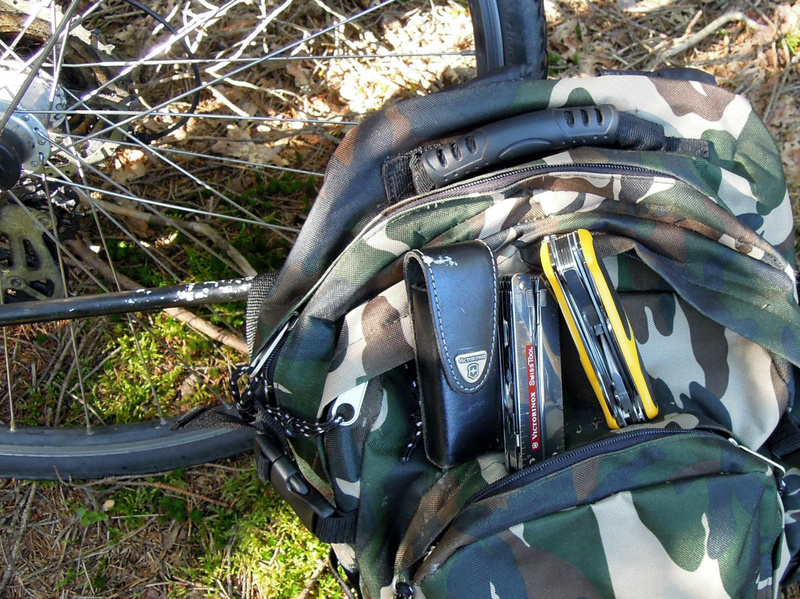 For Norwegian readers see " spør en biolog"
It is good training and you will learn scanning. To scan over a larger area when you are in the nature. Everything moving inside this field of scanning will also be detected like birds, animals and more. It is important to learn what areas to look for. Sometimes you can see them from a distance. 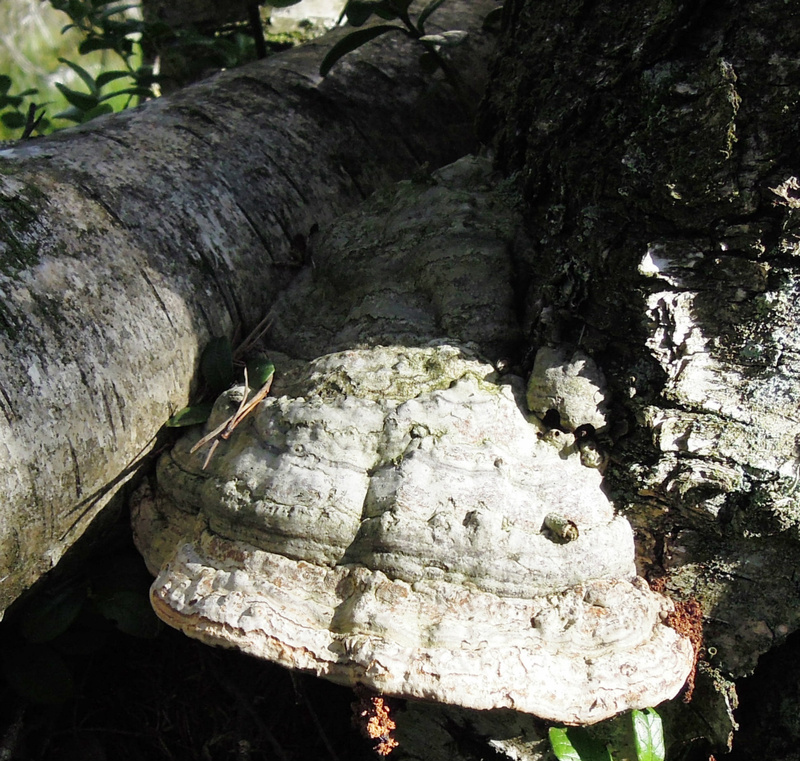 Sometimes you only see them up close.... Fomes fomentarius on the picture..
remember these two Fomes fomentarius? See the next picture. 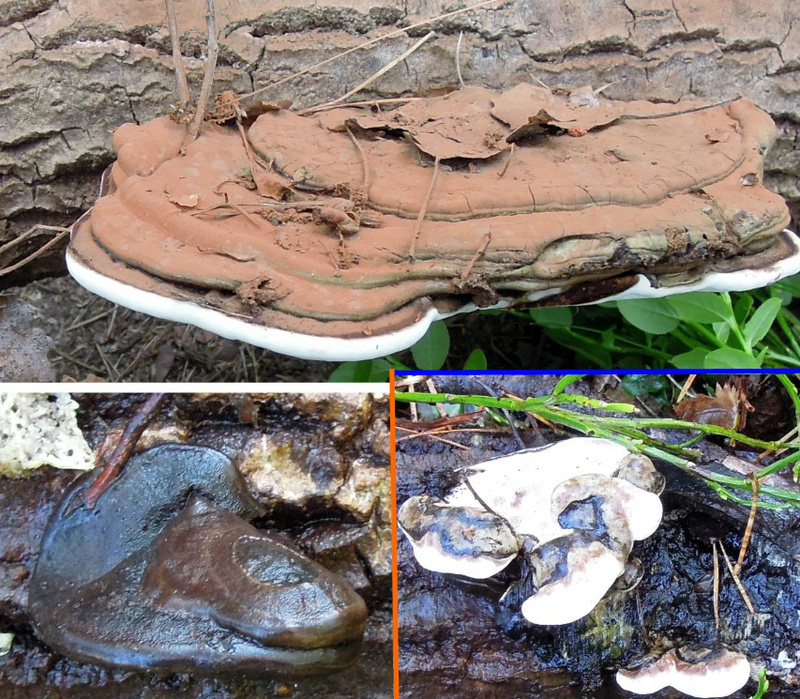 Fomes fomentarius or tinder fungus is often called hoof shaped and this hoof shape is used for identification, together with pores, color, shape, tree, scent and growth you can make an identification. 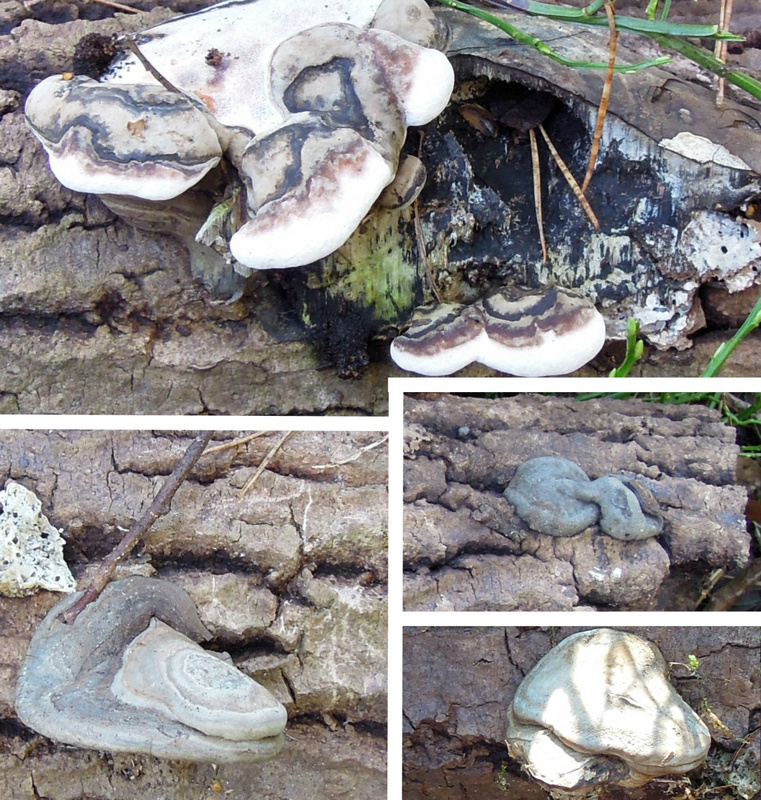 It very normal or common as i see it to find Fomes fomentarius with an incredible number of forms/shapes. 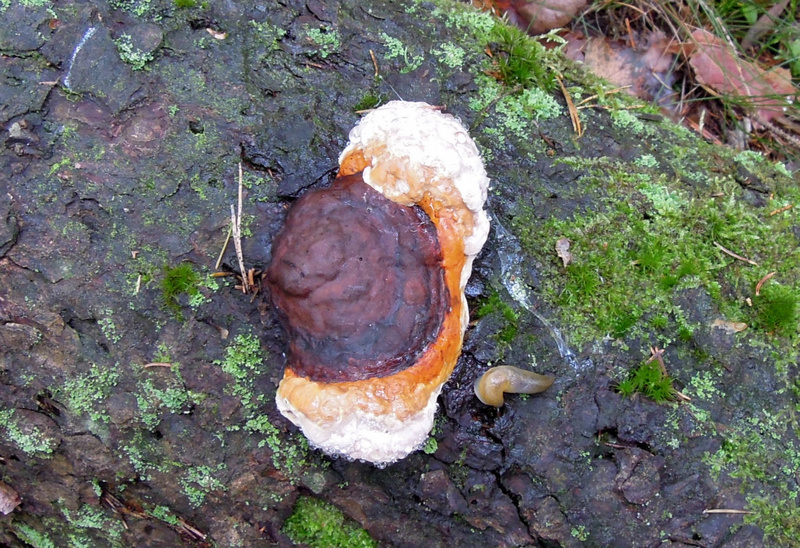 Two appearing together....the left one is probably Fomes fomentarius. 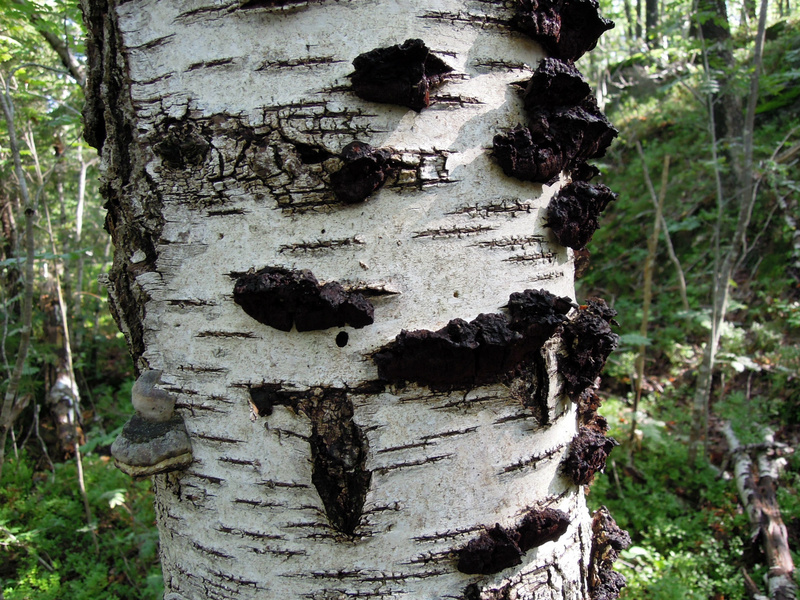 The black ones are not Chaga i believe? 14.09.2015 In the rain today. 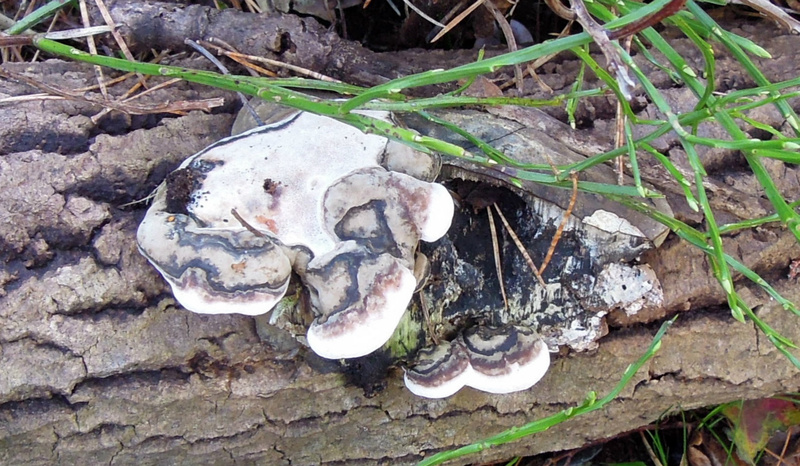 Fomitopsis pinicola. The picture should have had a bit more orange. What i am happy about is the red shining through the hat, very close to my eyes. It is Pine and i feel it is a nice example. 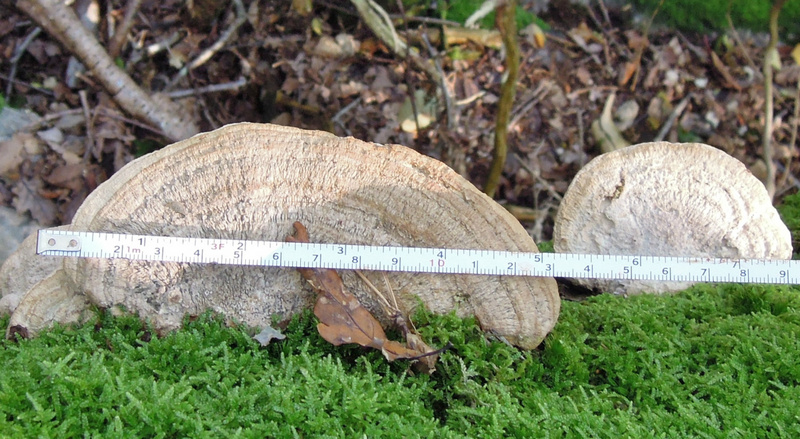 The largest Fomitopsis pinicola i have seen was on a standing root of spruce. 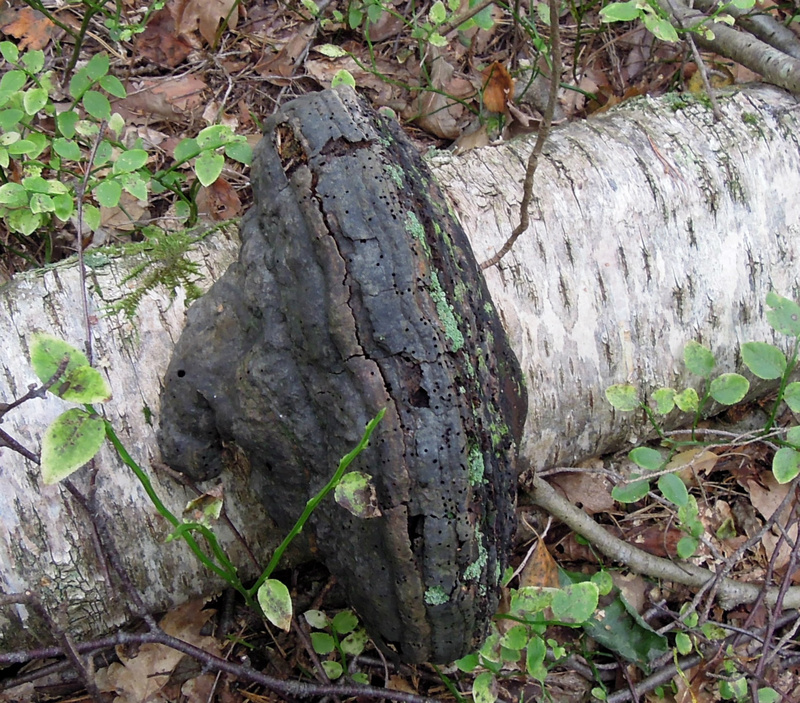 The largest Fomes fomentarius i have ever seen was on a extra thick standing Birch that was dead. 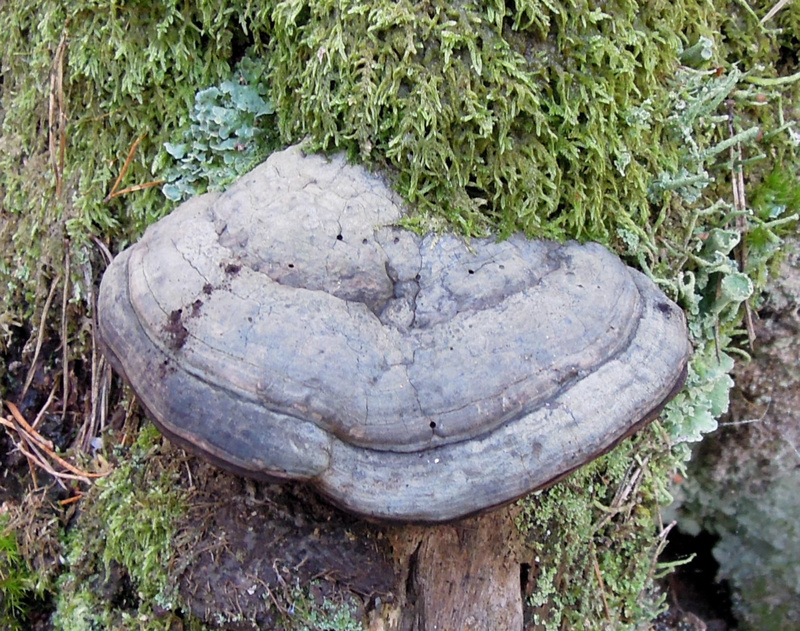 Fomes fomentarius can appear in great numbers on a log, standing or fallen. 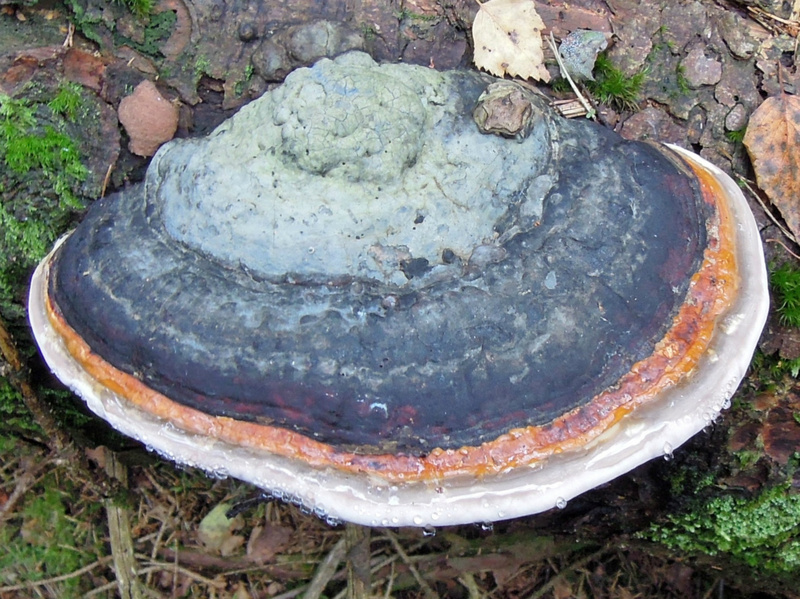 Fomitiopsis pinicola can also appear in great numbers on a standing or fallen tree. 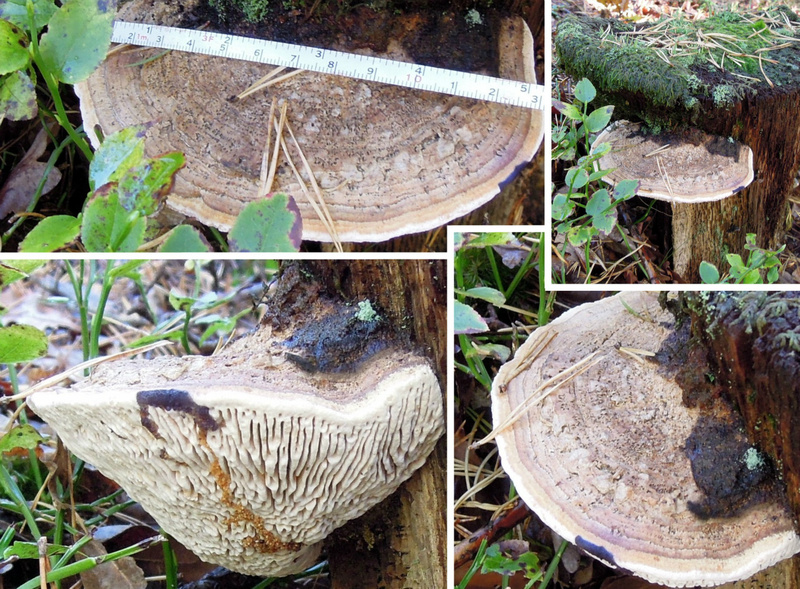 It seems to me that a thicker tree can make larger Polyporaceae or Polyporales...With Fomitopsis pinicola they will appear in greater numbers in wet land or marshes. 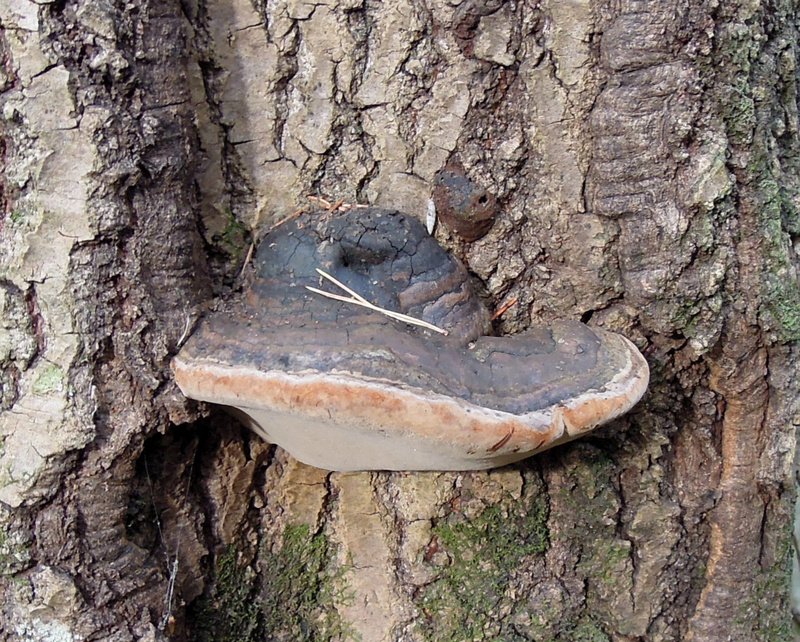 if i remember correct this was Fomes fomentarius as well. 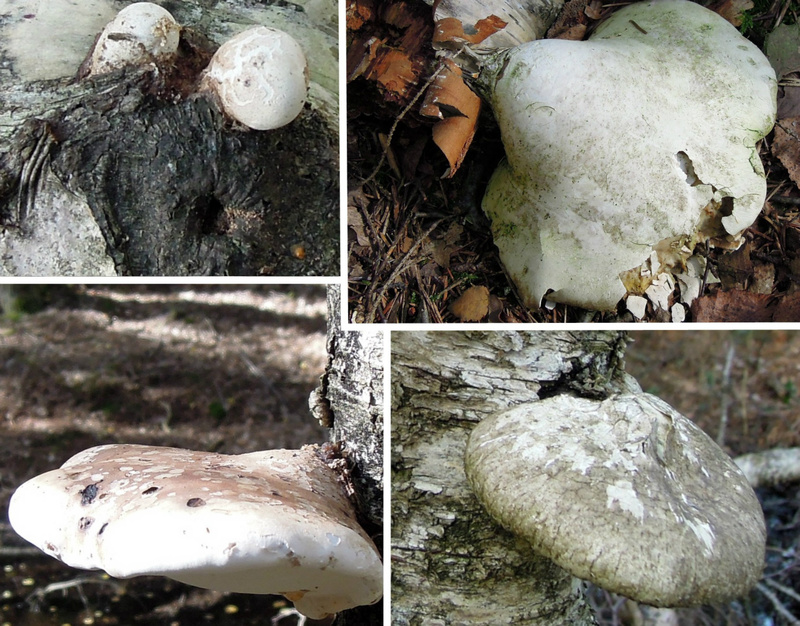 Here the transformation ended with abnormal shapes if one can all any shape by Fomes fomentarius abnormal, not hoof shaped. 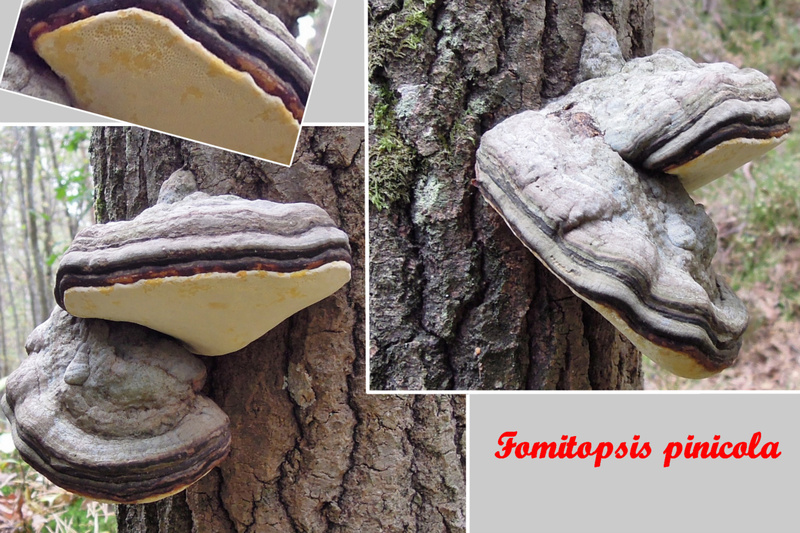 Looking on Fomitopsis pinicola and Fomes fomentarius you can sometimes see them in floating shape on the bark. 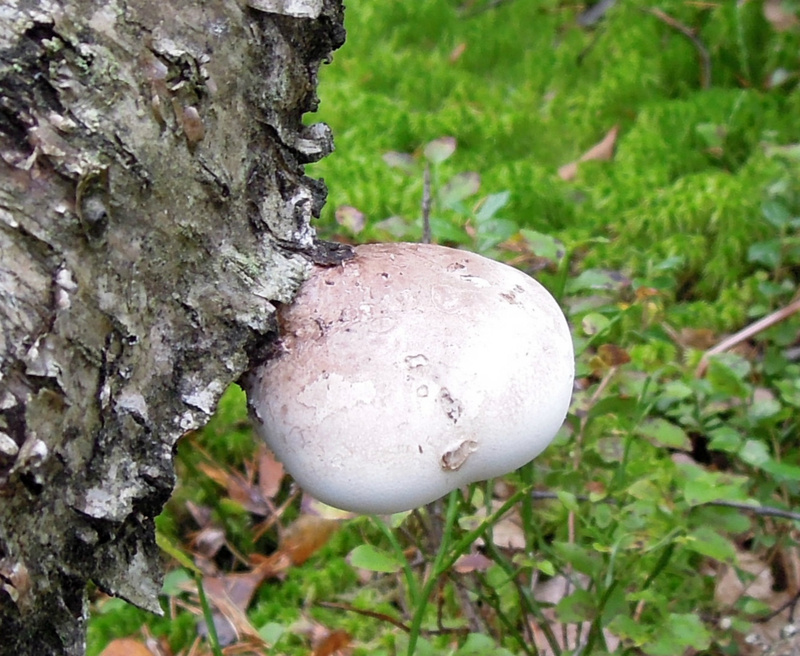 It is really a challenge for the so called IQ because i have found them changing the level diectly out of the Polyporaceae itself or under like this, connected both in the tree and Polyporaceae. Or atleast so it seems:) Since that in some cases it grows a completely new shape on an old after fall down suggest to me gravity and a mechanism is involved. Let me know! In my research i did discover that when changing the level from the original a completely new develops. 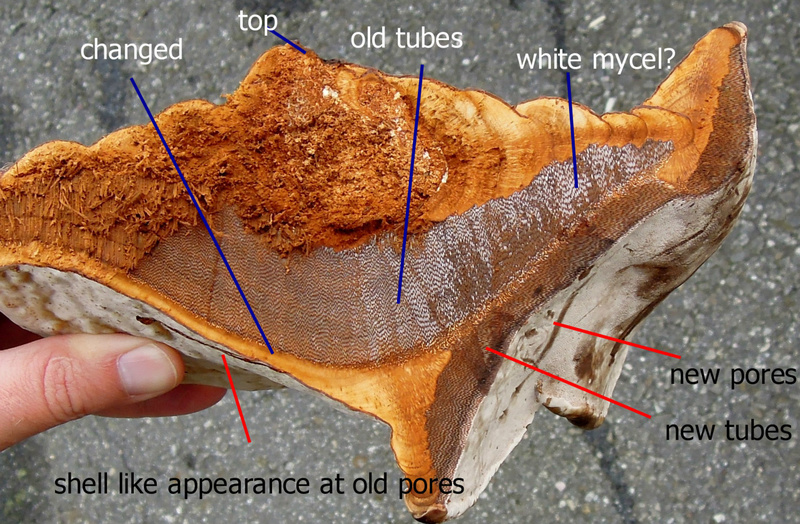 The original one develops a "Shell like" appearance over the where the pores usually are. 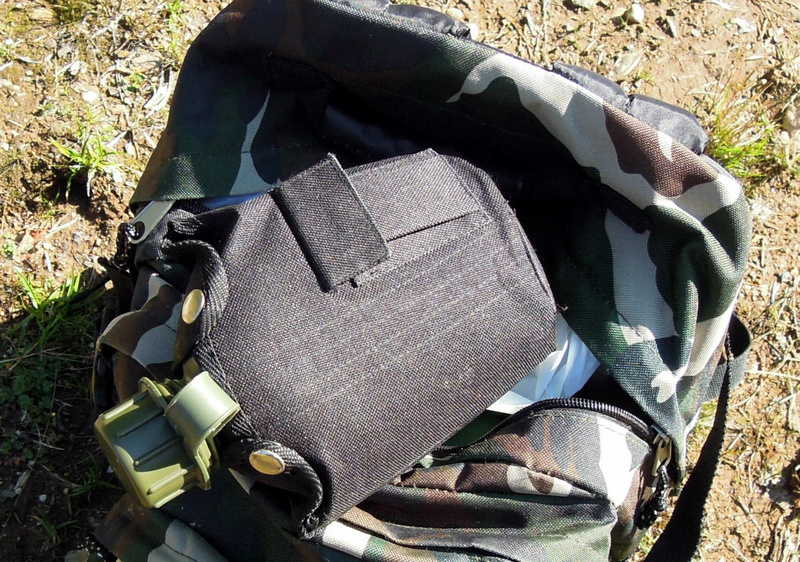 The Shell are either a protective mechanism or ? 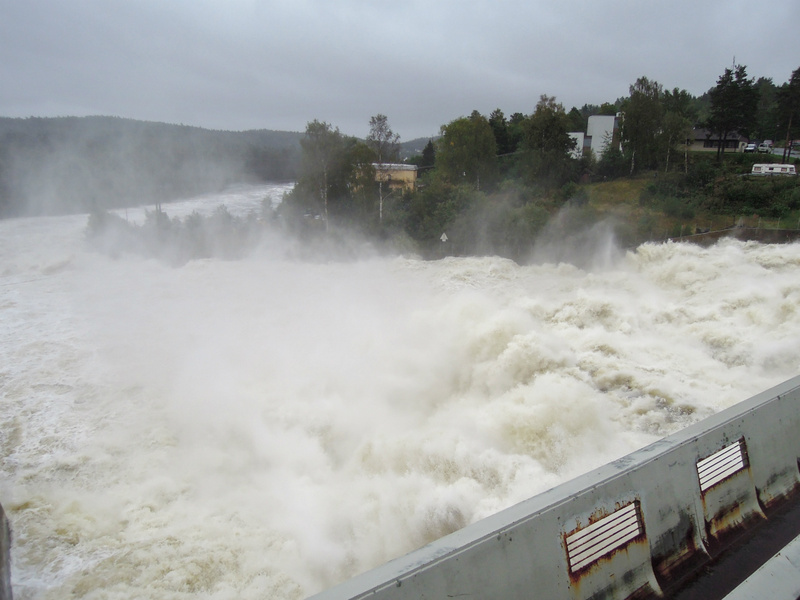 The river is flooded downwards causing damage on houses, boats and buildings....The power plant must be open for safety or the dam would get damages...I live by the river and could see it rising, my appartment is safe. standing right over/behind, the noise is loud! 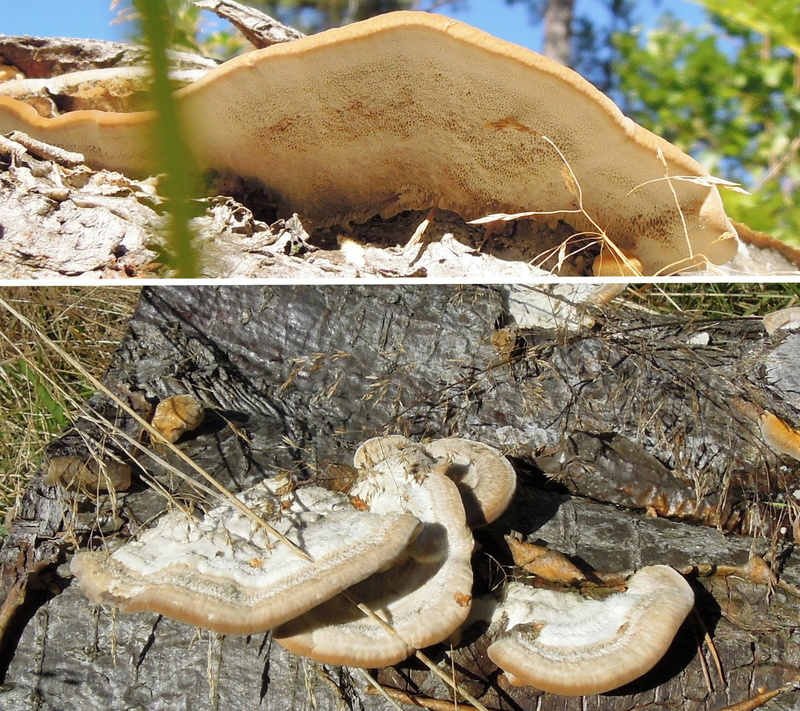 20.09.2015 Fomitopsis pinicola today in the sun. 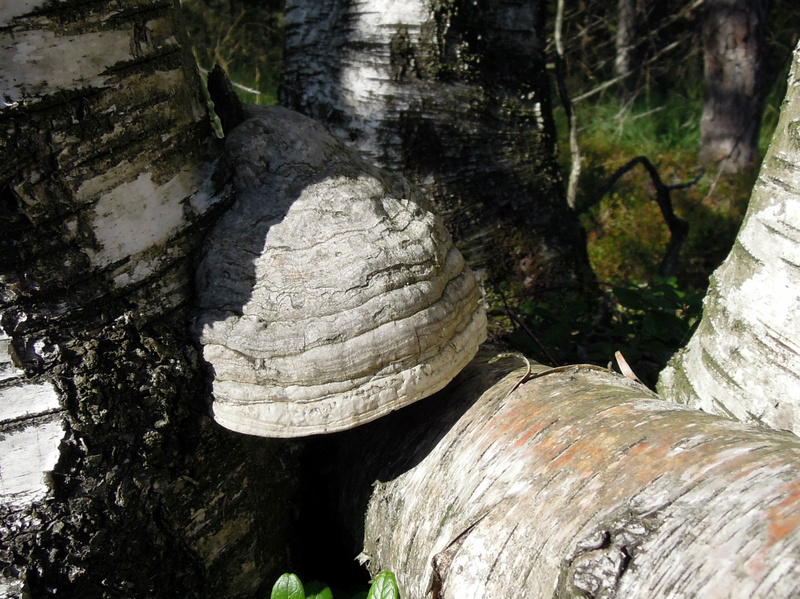 It is on a birch and in the sun only for a short time. During winter time the leaves are down and opens more light. 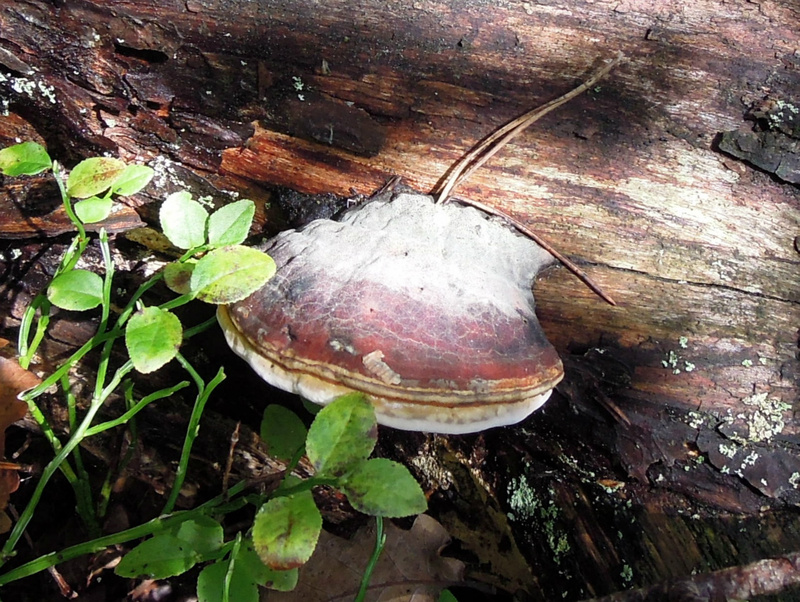 On the other side the Polyporaceae is not active after fall. During winter i will research how it survives the winter. 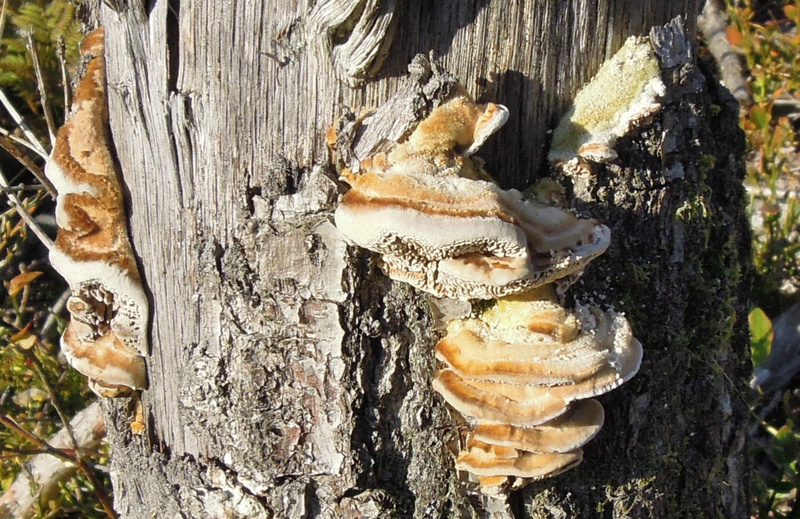 Living cells in a tree produce antifreeze. What when the tree is dead. It is mentioned that when a tree is dead it is actually 30 procent more life going on in it! How cool is that! 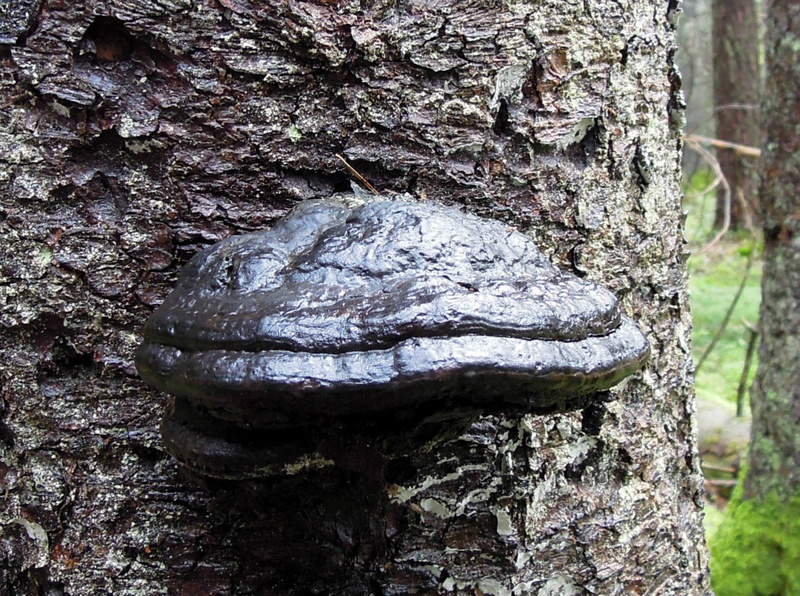 This i believe is Valkkjuke Phellinus laevigatus. 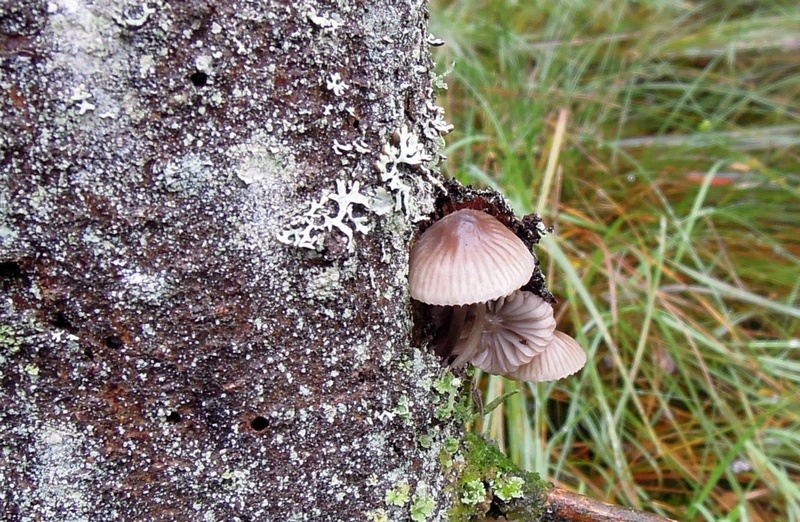 22.09.2015 Piptoporus betulinus today in the rain. I have seen from time to time a large hole that could be mistaken for a guttation. 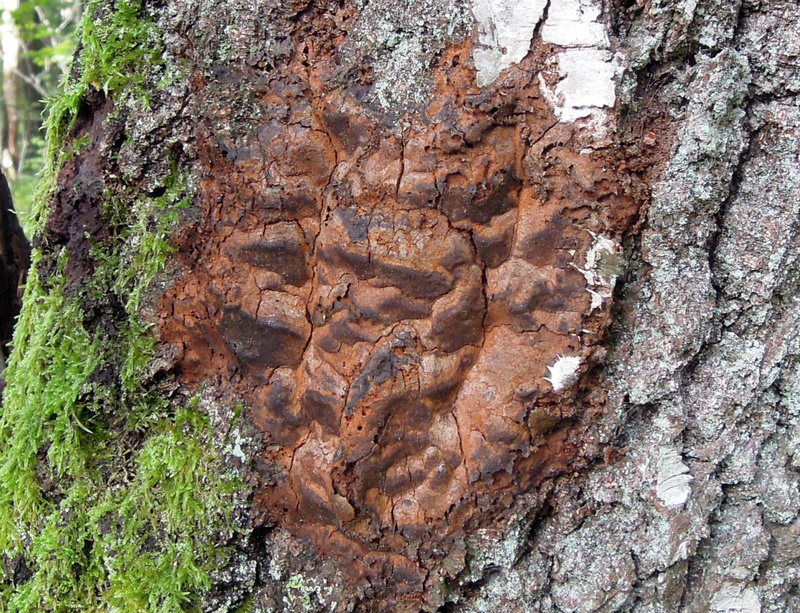 I am interested in learning about insects and in this case it could be a beetle hole. There can be different reasons for it as well. 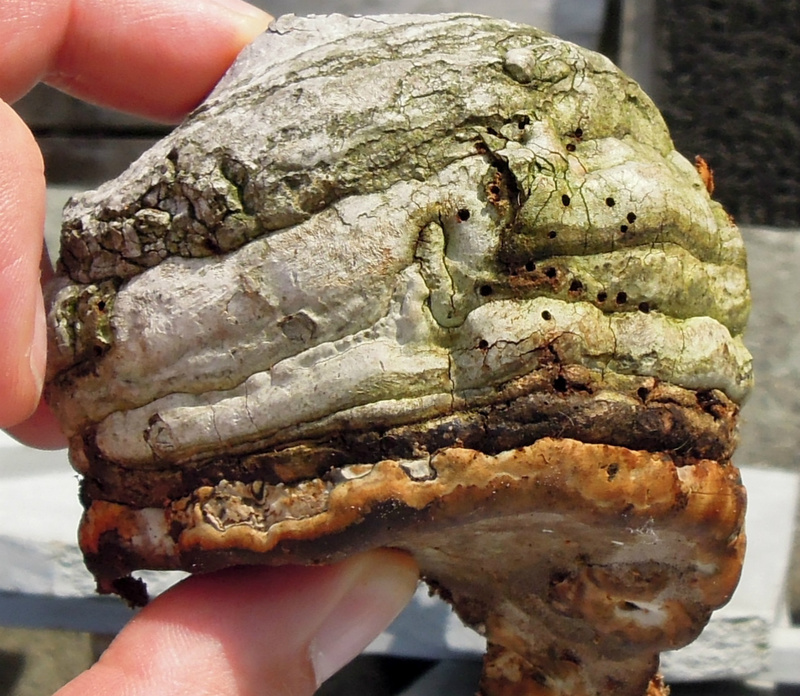 This i got yesterday and it show and speak about some Polyporaceae or Polypores. 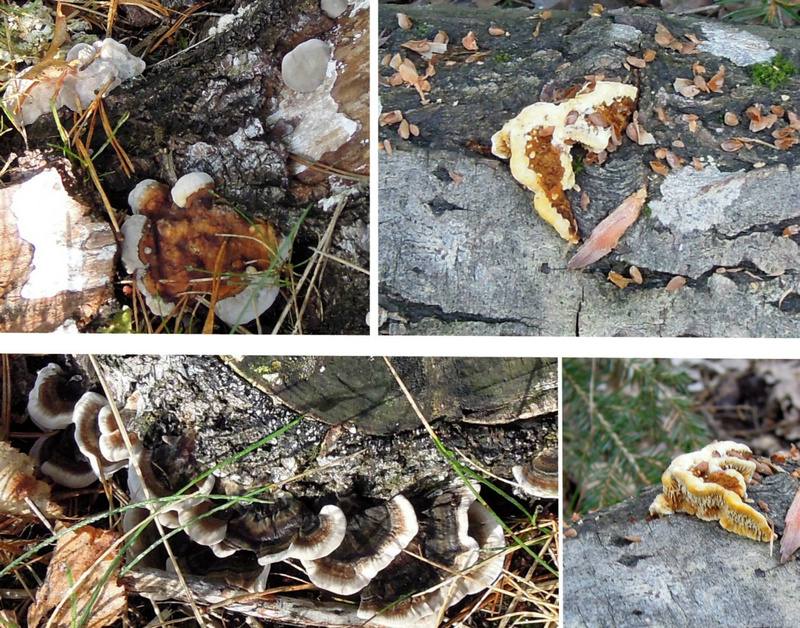 It was easy to discover on my own that insects live on Polyporaceae or Polypores and fungus. Beetles are common. 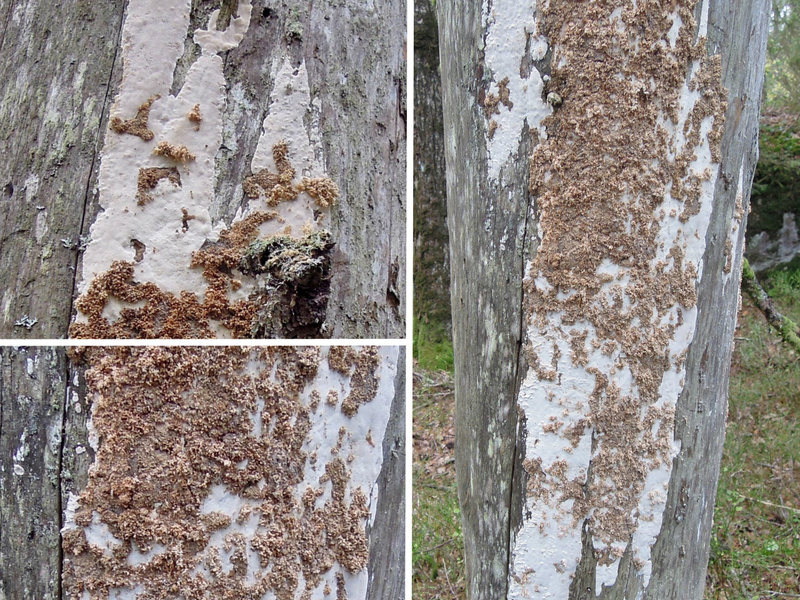 The insects are also part of shaping fungus and also destroy them. Some live on dead ones and some are actually responsible for appreance sometimes. They eat on them and influence the appearance. 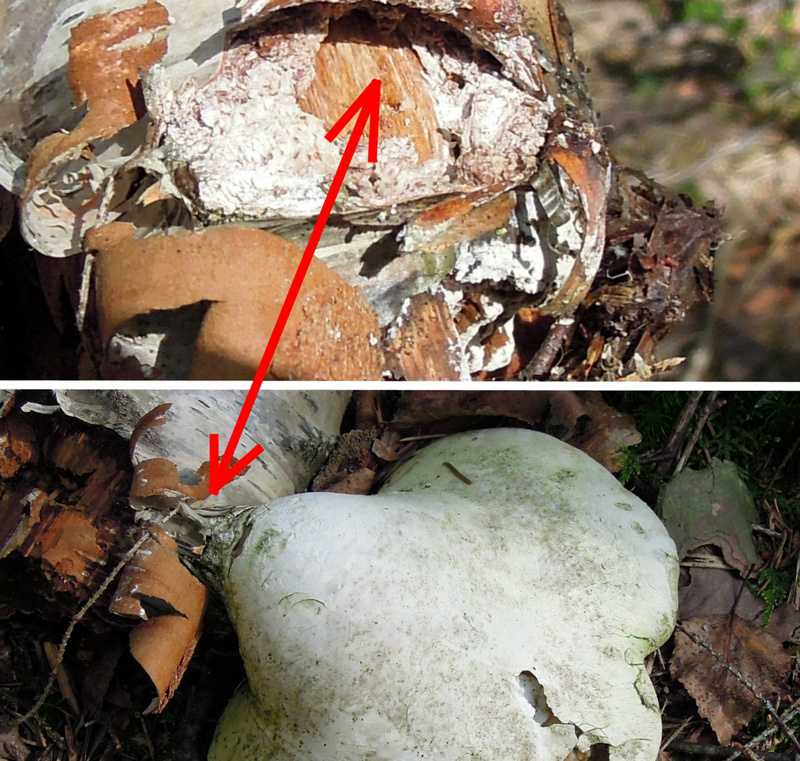 It is not only because the Polyporaceae grow that the surface changes, insects are also responsible. 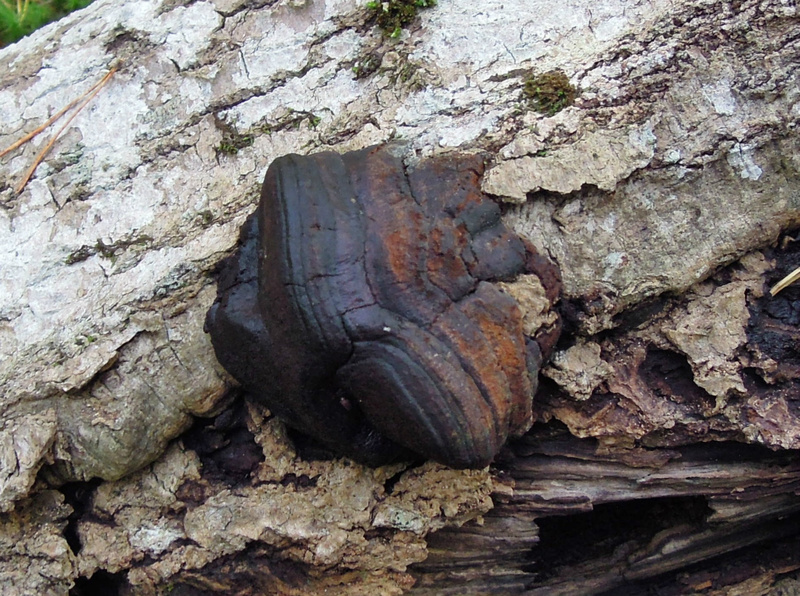 I believe this to be Phellinus laevigatus, it got a darker color. Let me know. There are holes in the Ph. laevigatus Beetles and larvea live on and in Ph. laevigatus. 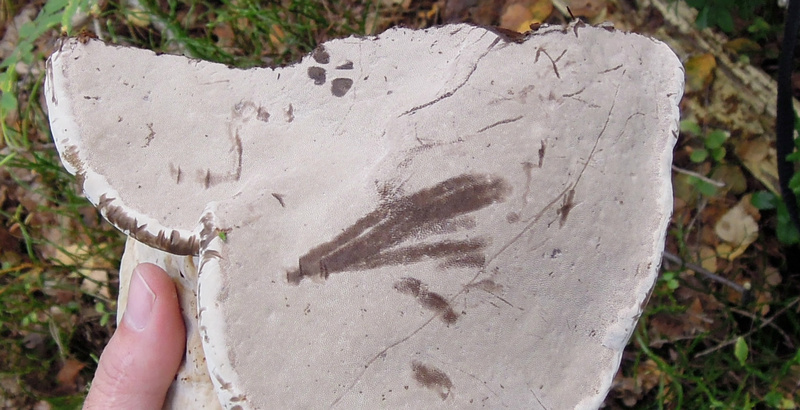 24.09.2015 This is for sure not Phaeolus schweinitzii or Bjerkandera adusta :) I found it today and looked under it, can you believe i forgot last time! It got spikes it seems under it :) I do not know what it is? Do you remember this Fomitopsis pinicola? Yes it`s been very active and growing. This i have an idea:) will have it for later research, it is fun! 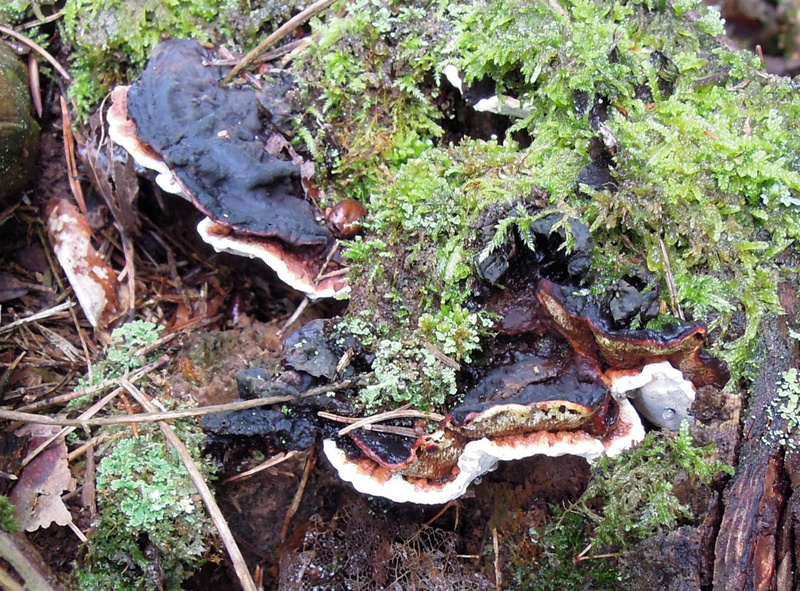 Phellinus today in the rain, did you know some Phellinus can reach 50 years old age? 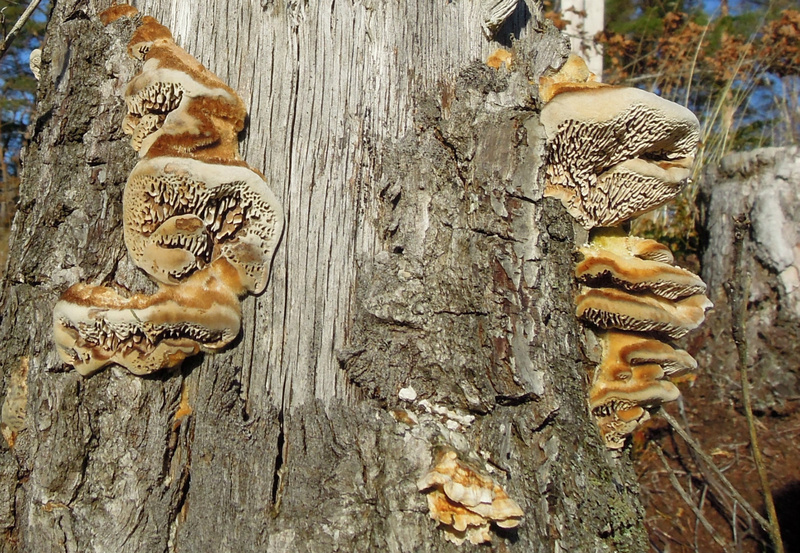 i have already shown this that i believe is Valkkjuke Phellinus laevigatus, this is on a dead birch and it was growing on different places on this tree, from low and up to some meters. Some in spots and other in the lager flakes. 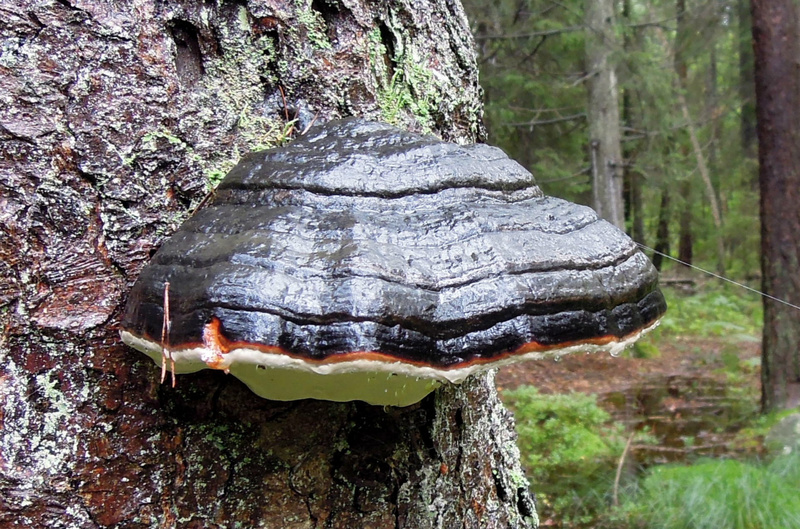 There is also a third possible one and that is Phellinus ferreus (kystrustkjuke) This i do not know much about yet. I found it mentioned in "spør en biolog" and Kristvi.com. Both are excellent if you are interested. By the way you can comment any picture in Norsk or English here. 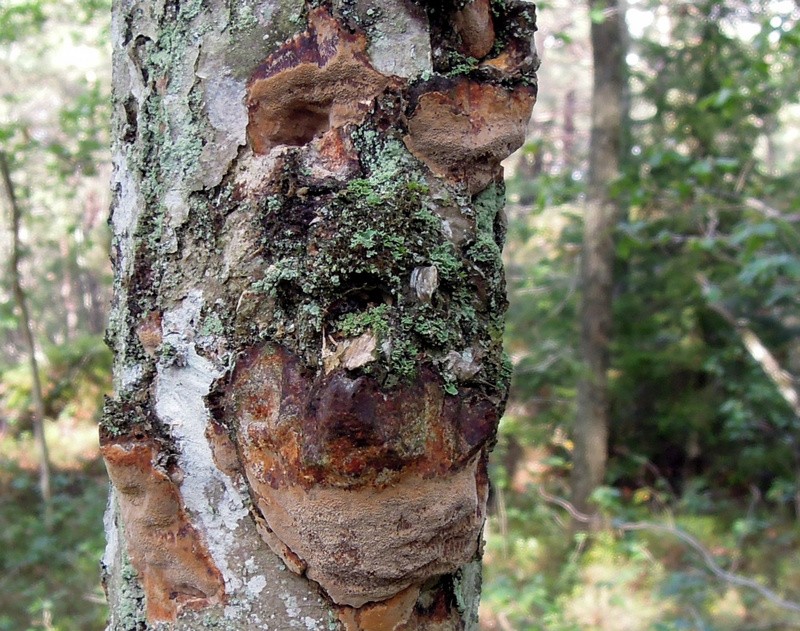 I do not know if Kystrustkjuke are on Birch? I should have gotten a better Picture of this "labyrintkjuke" in such dark areas one must use the flash on the camera anyhow. It is the kind of light with or without the flash that the camera starts to struggle. Here it is again, today i used the flash and i knew that at this time of day the sun gives enough light through the tree`s so i could get a good result. Remember that a mental note of the location, a Compass? Yes absolutely it can be used, Your location and the locations of the sun. 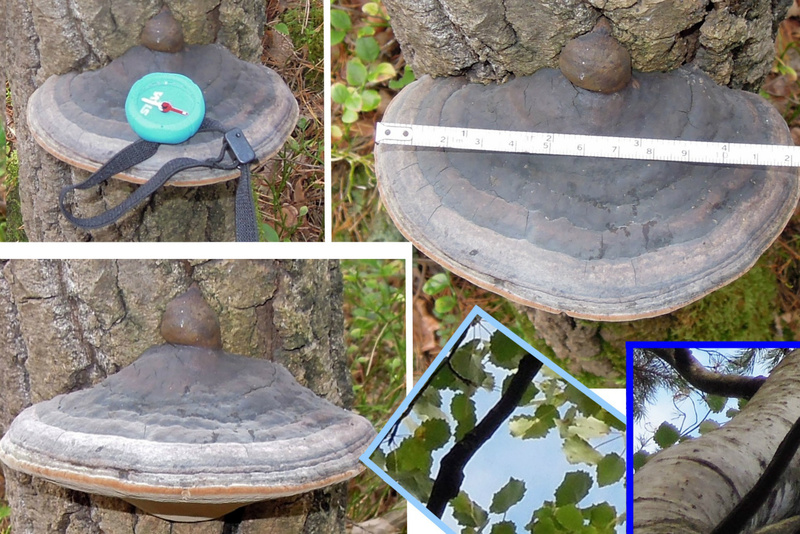 On the top you see the Flatkjuke Ganoderma applanatum that i did show some time ago. On the bottom to the right i found today on the same piece of wood what is probably a jung example or one that is strange developed. To the left on the bottom i also found today on the same piece this strange develped something. 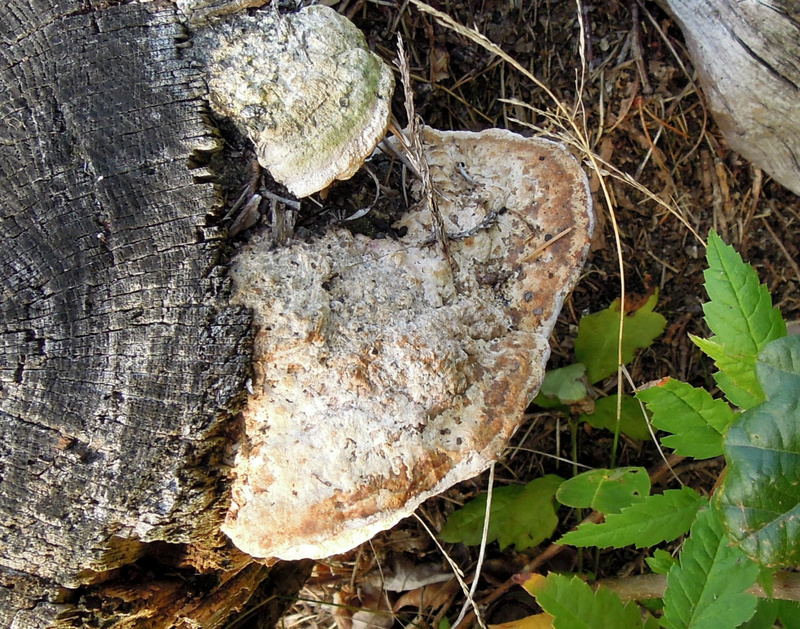 I know that some polypores or fungus can live together or after eachother. I do not know what the left one is yet? 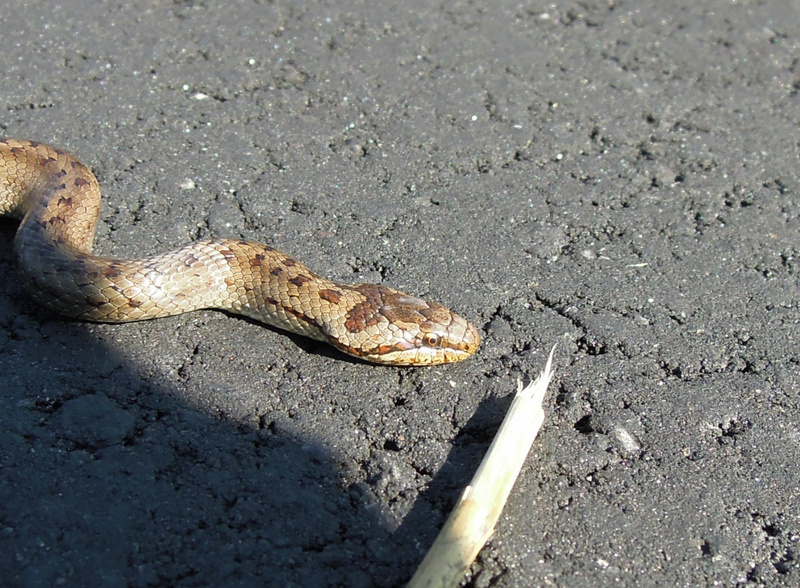 Here is another one that i found again today at a different location. Here it got just a bit more daylight during the summer. The blue color must be from a Blueberry. 13 cm wide and it is thick/deep. 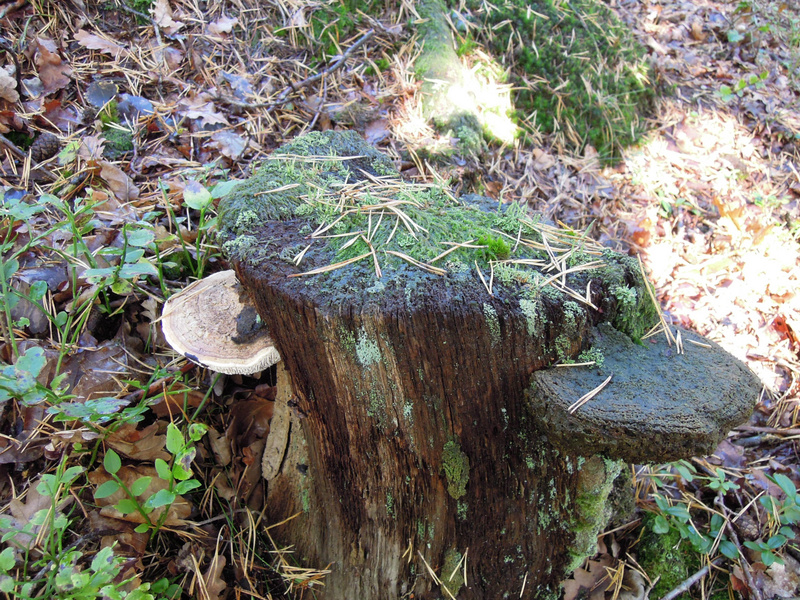 It is not much left of the wood in a mixed forrest. It should be what we call Musling type and could be a Daedalina quercina Eikemusling. On the other side is a rotten one and a small new one. Hope you like the picture. One more picture of this i found earlier today. It was brown/dark all over, flat under. Do you remember this pudding from Pictures page 14? Maybe this has been a little slow in development. It is bigger and it is a Fomitopsis pinicola. Here are these again today 26.09.2015. The top one is a bit older than 01.08.2015 (was when i last discussed it) On the right is how it has developed. I have not used the melt test on any yet on purpose. 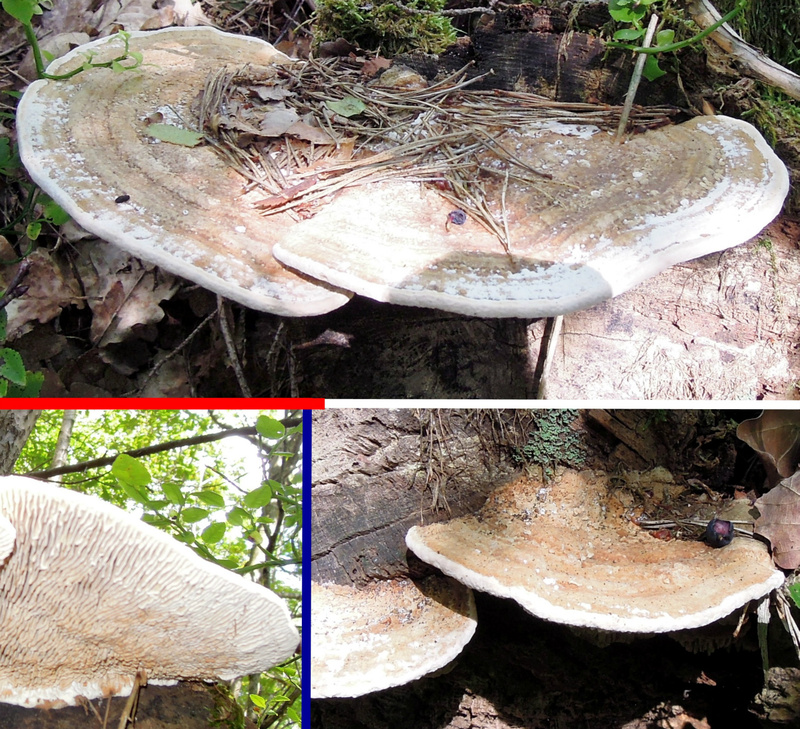 It is to Discover other ways of identification Fomitopsis pinicola or Fomes fomentarius. On the bottom you see how one of them altered the level with correct date completely. The scent has changed. Should one believe it is Fomitopsis pinicola only because of drops? I do not think so. It is very interesting! 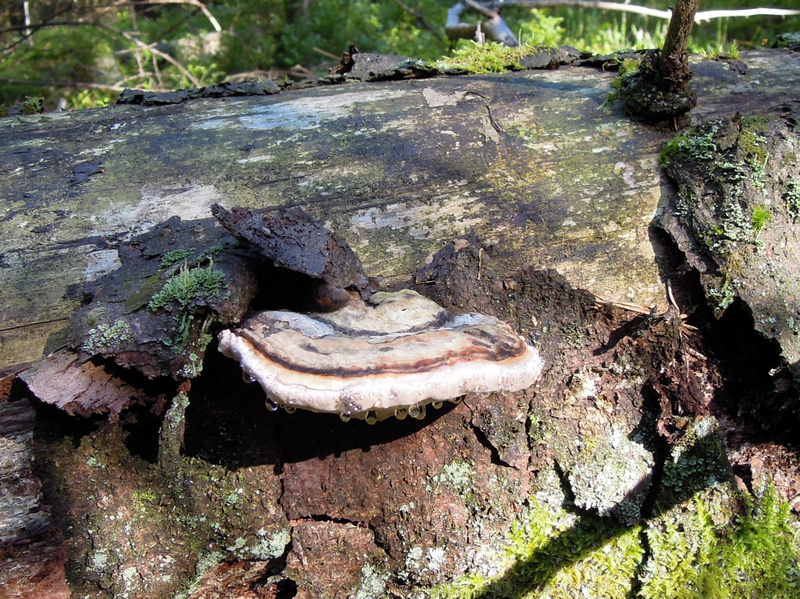 Because this tree is on the ground the Polypore that once was horizontal had to alter the Level to become horozontal again. 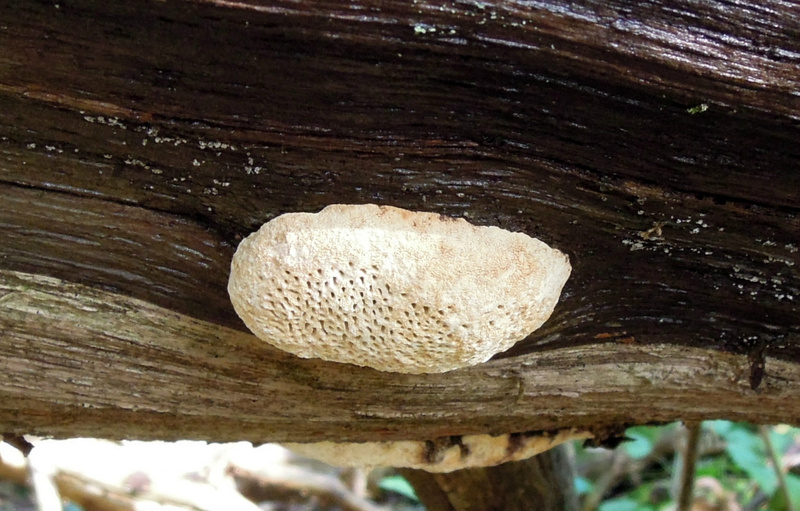 It developed a Shell like appearance on the old pore layer and developed new discs. It got resin that i can see without doing a melt tests. 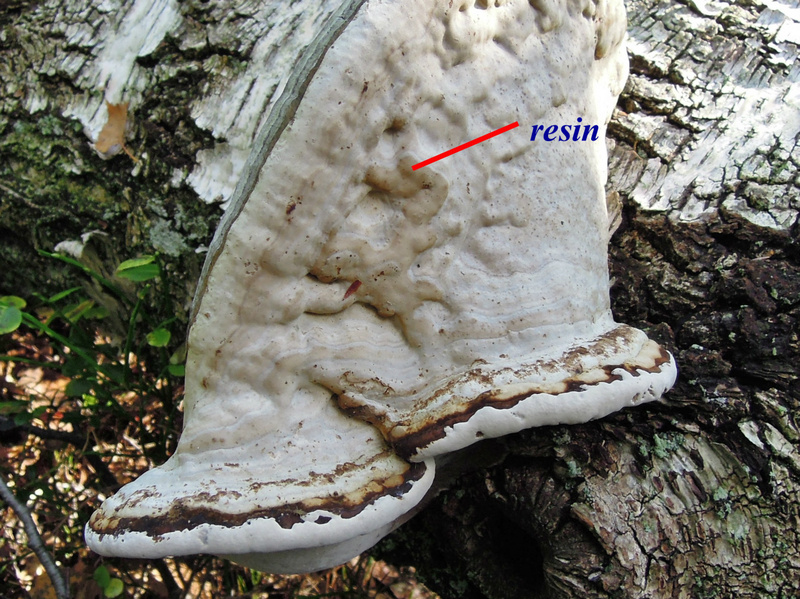 Is this because of the altering or is it not possible for Fomes Fomentarius to develop resin? 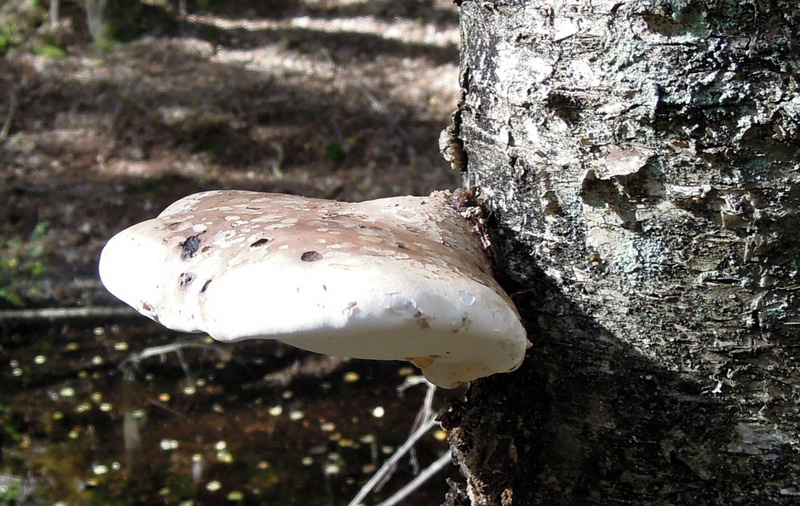 The scent is also more Fomitopsis pinicola now. Because of all the factors these must be Fomitopsis pinicola. 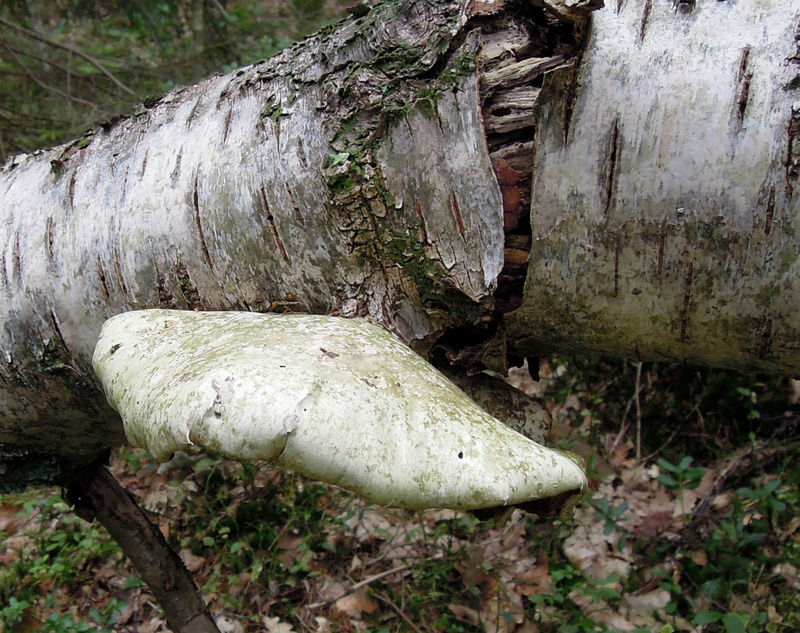 This Birch fell down because of white rot. Here this again, went back for the same reason. Bluing is usually not an issue with a camera today. Moist, substances and processes may create a film that changes the appearance that is blue. 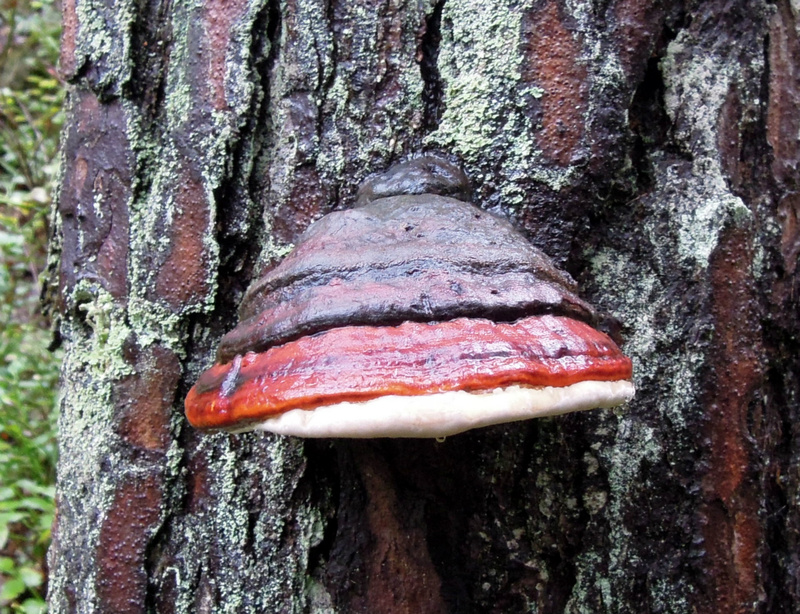 I believe this is a Ganoderma applanatum. 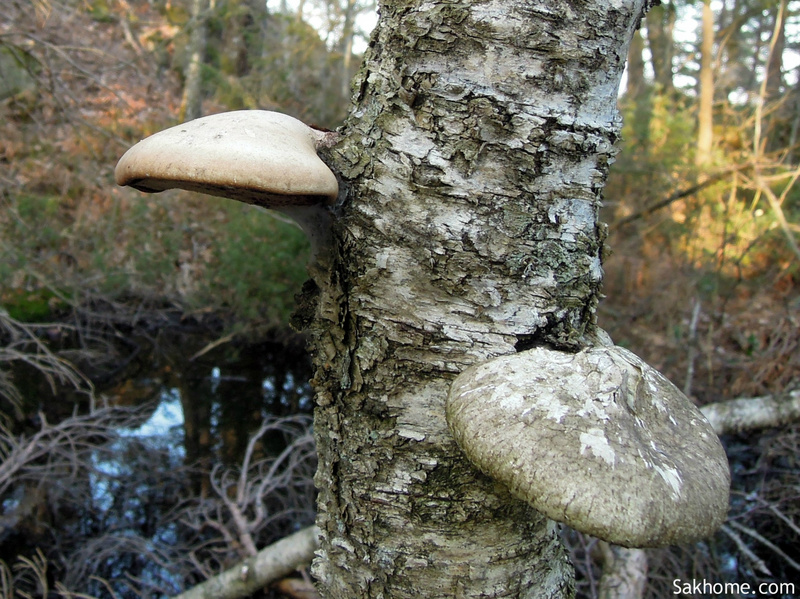 Living as a Saprophyte. 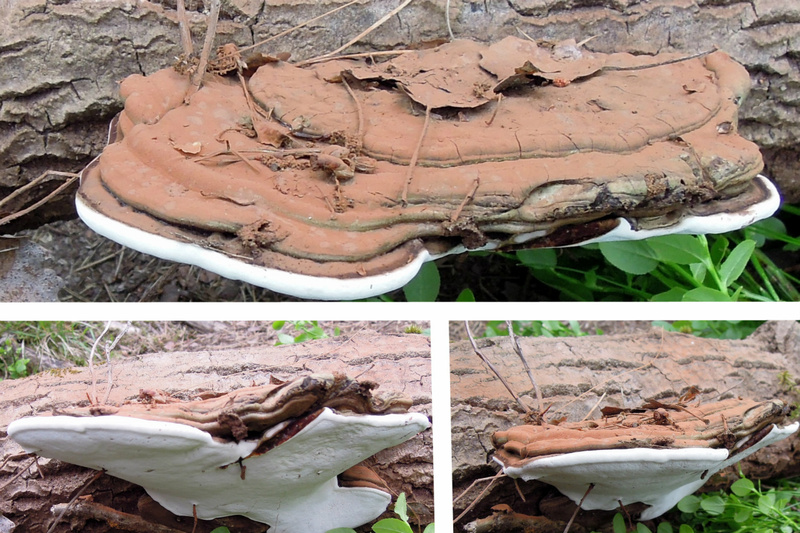 Found some more and interesting Things on this Ganoderma applanatum infected piece of wood (leaf tree). 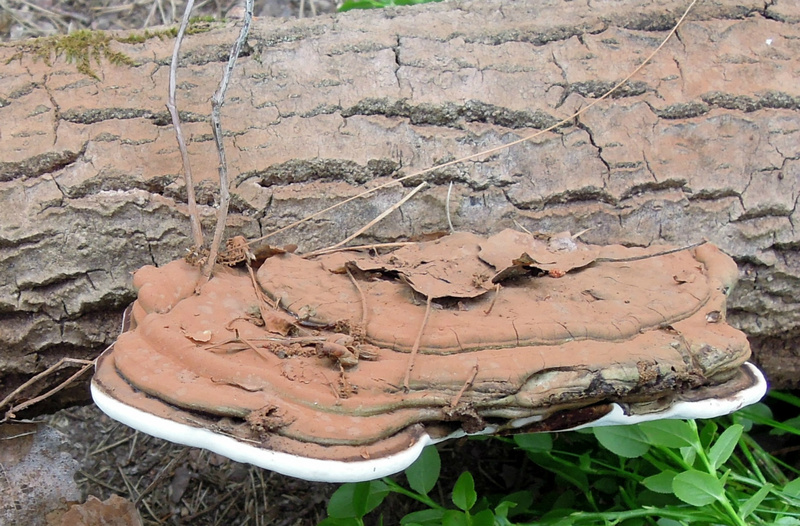 Ganoderma applanatum can get several years old. 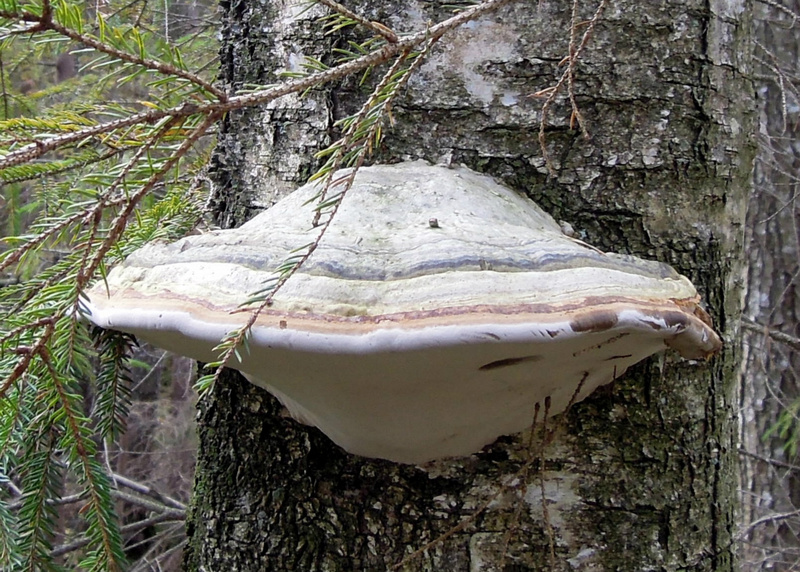 It can live on a living tree too or as a continuation as a saprophyte. 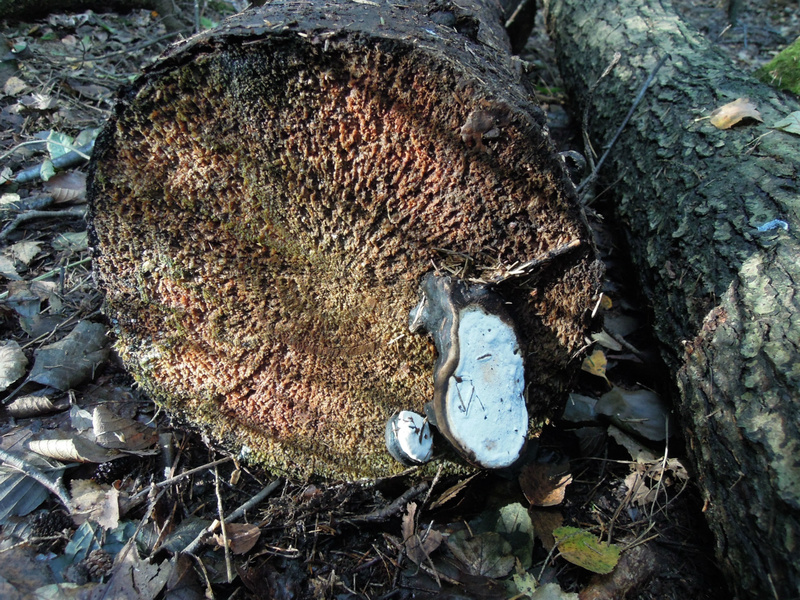 Because this log has been turned around by others it is not easy to tell up or down. 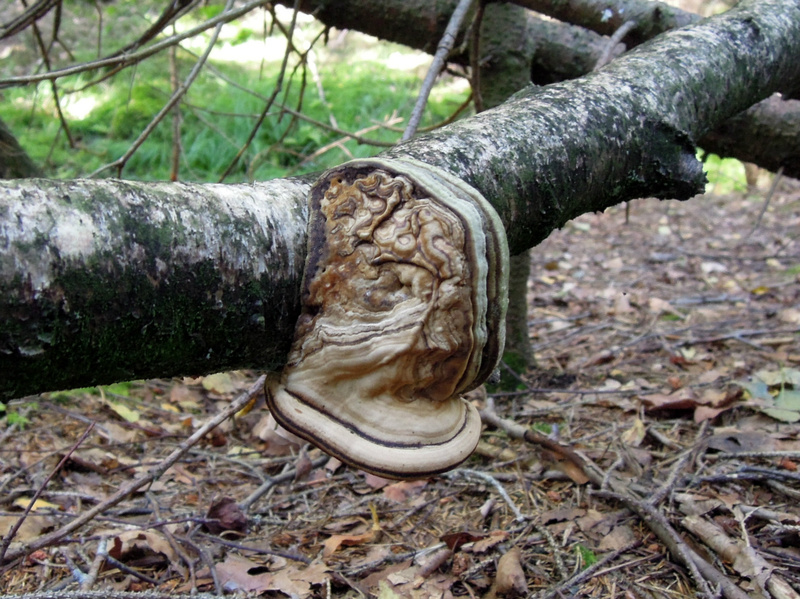 i belive the piece of wood is upside down from before, this what i believe is jung Ganoderma applanatum is growing out where the old beautiful one was located. North, South, West and East. Wet, dry, low, high, slope, steap, flat. 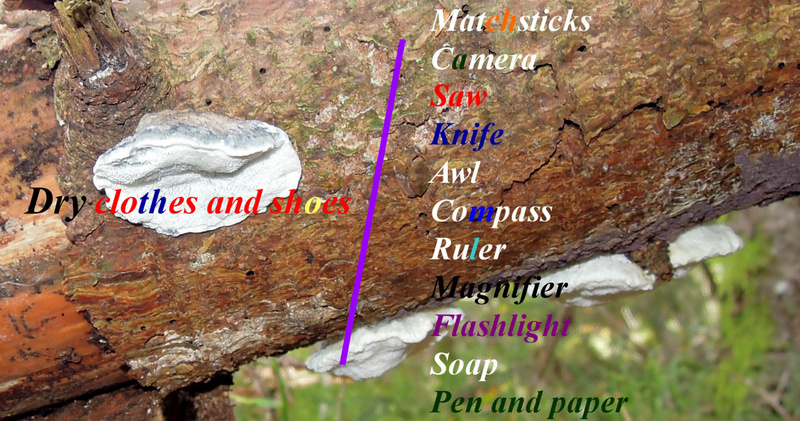 These are things to have in mind when hunting for Polypores. Remember the angle of the sun and location of the sun. Streams, brooks and lakes. The age and type of forrest. 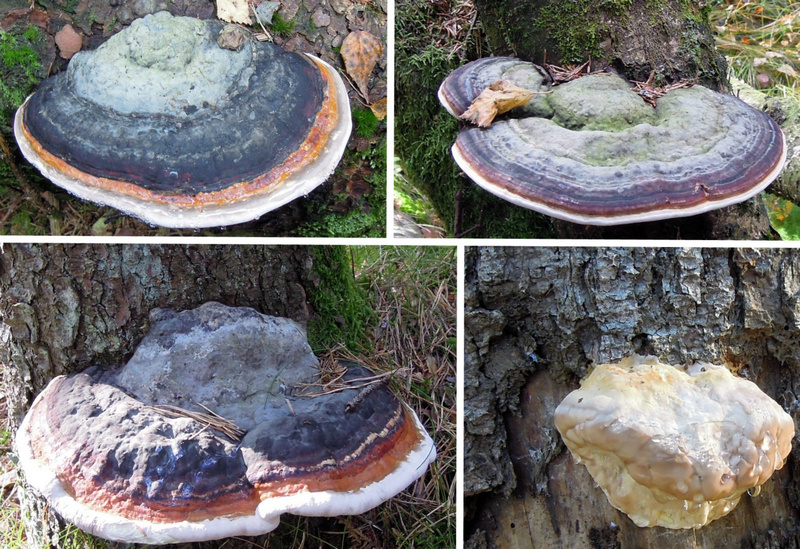 Have in mind that Ganoderma applanatum spores can color other polypores and the nature around it. The spores may mix with water and other and confuse the appearances as well. It can be found with Agathomyia wankowicki flies, i do also suspect this fly or similar can go on other Polypores too. 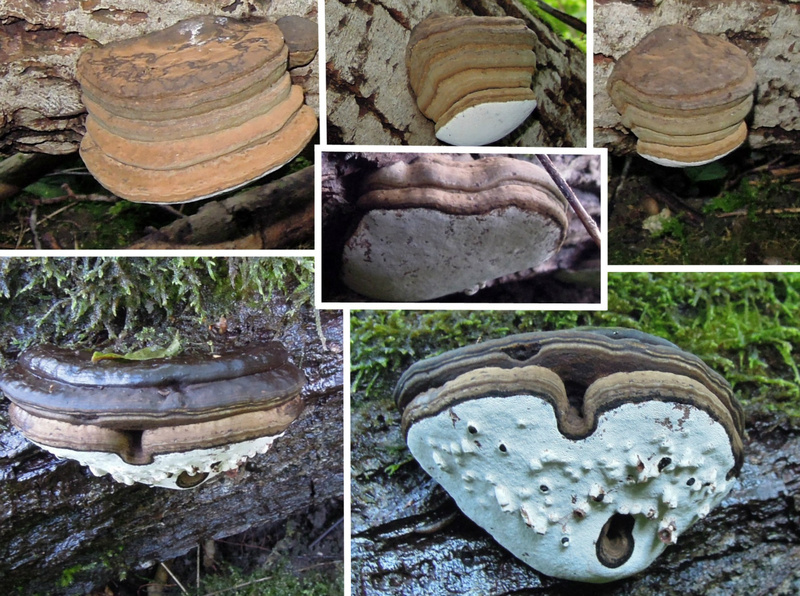 here this is again with some older pictures of the ones around this Polypore, they are still there. I have discovered that one more of them got holes that are not made by grass or other but by insect. Most likely the fly. Everything is weird about them. 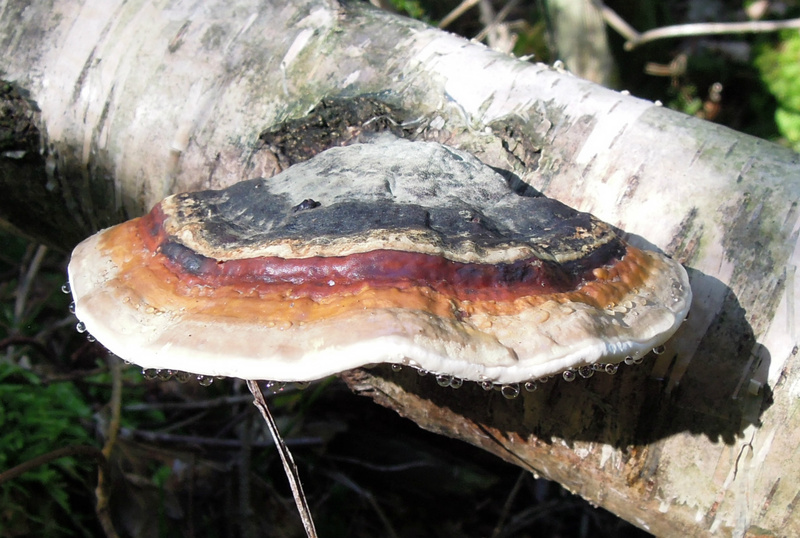 Ganoderma applanatum, G. resinaceum, G. australe....I am not sure what it is. 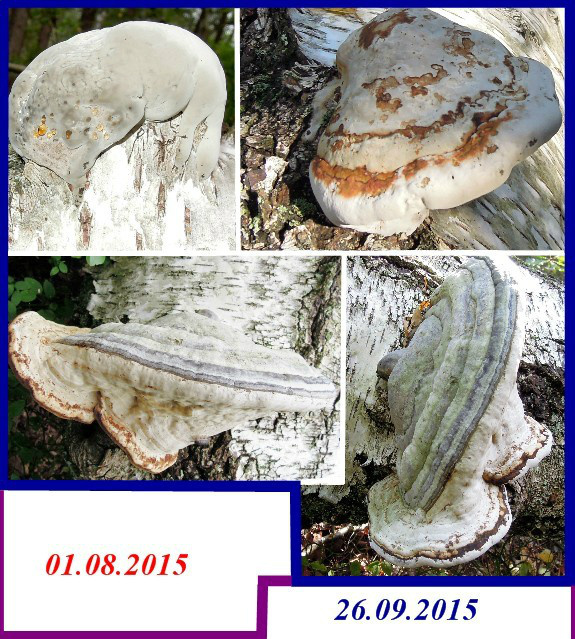 28.09.2015 Today i found these Polypores, the top one is 16cm wide and very thin/flat. I scratched it and you can see it on the picture. The hat is hard. Difficult to distinguish a scent. 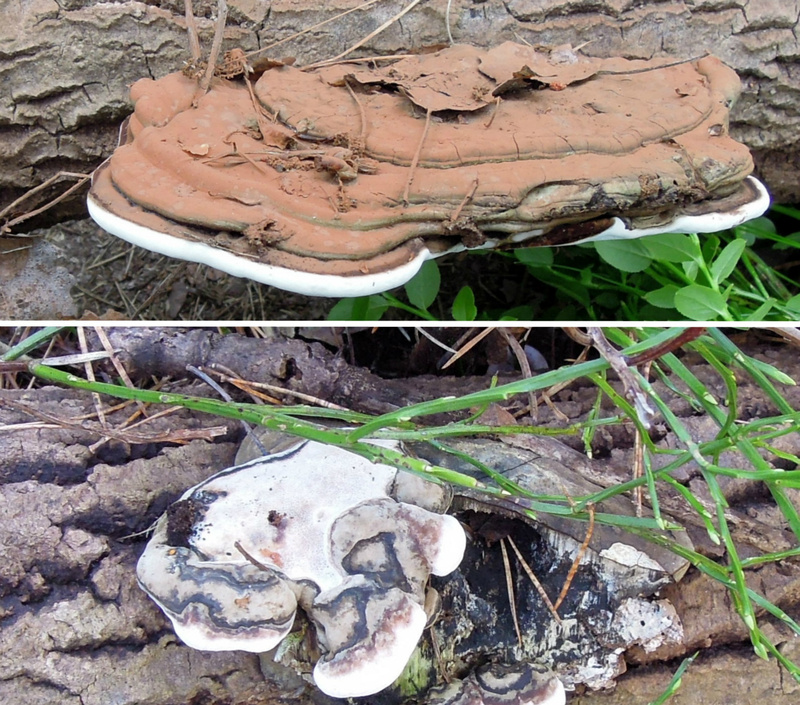 These must be Ganoderma applanatum. Picture with some sunlight and flash. The best combination for my camera is flash and some sunlight. The sun did shine on it for just a few seconds. It made my day. This was hidden under the root and i would believe it does not see any sunlight. 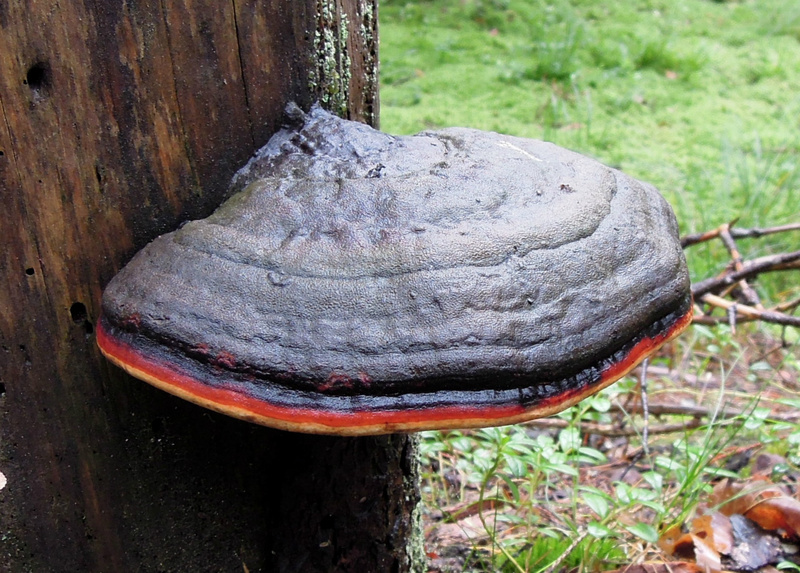 Very flat and i believe it is Ganoderma applanatum. 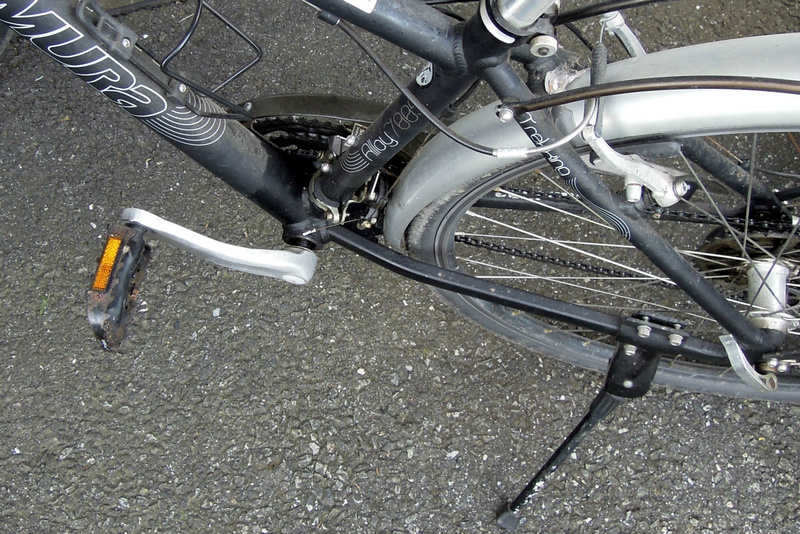 What an incredible invention a bike/bicycle is. 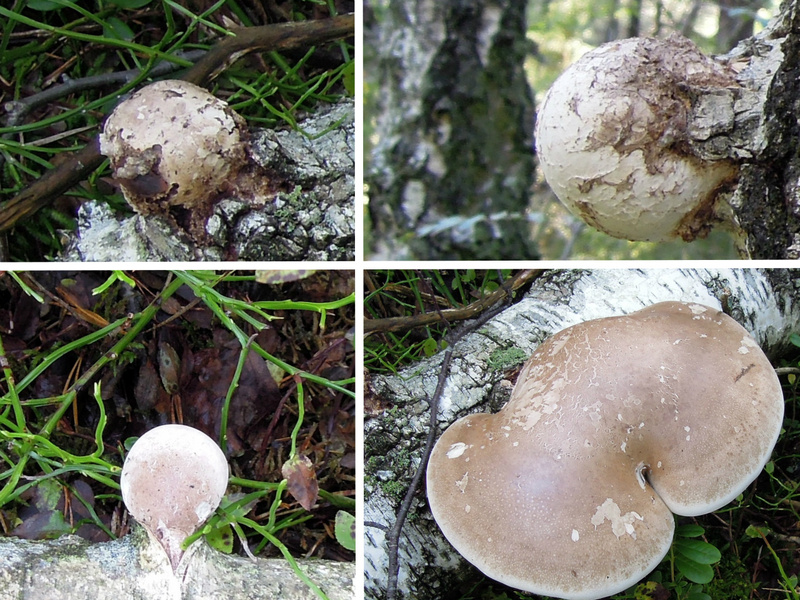 On the picture some Fomitopsis pincola, the right ones with snails. 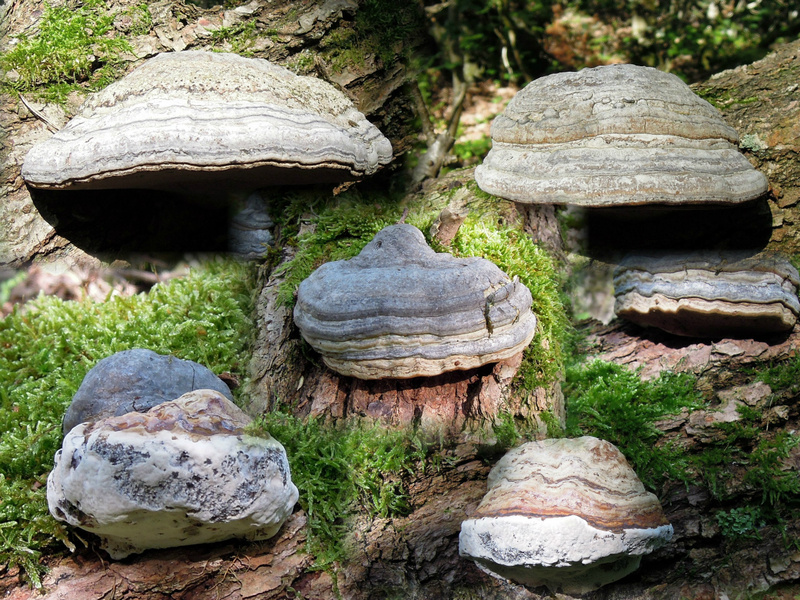 One of the polypores had a weak pink shade that the camera enhanced some. Still it is most likely F.pinicola. 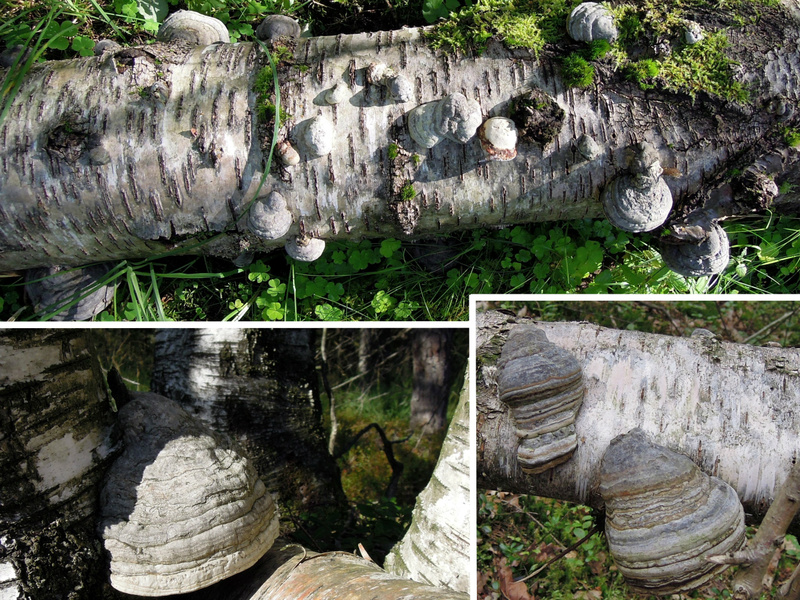 The snails i have seen much on such Polypores. 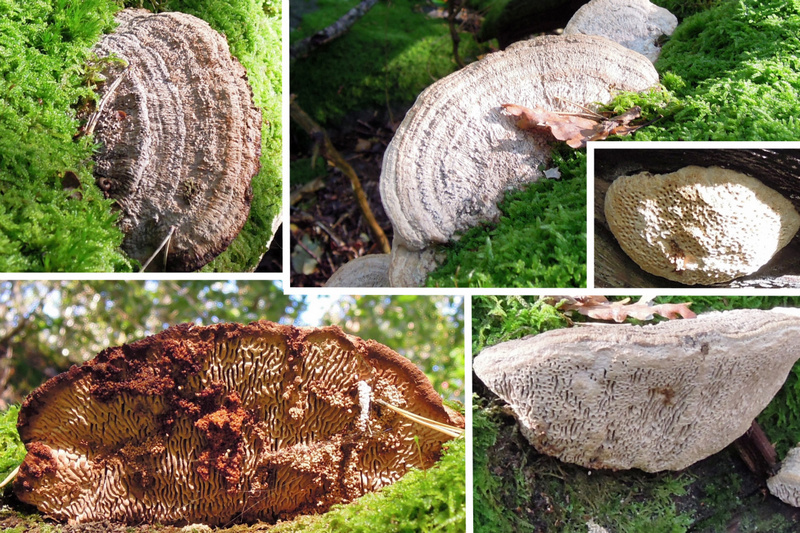 I have an idea what Polypores. The book i bought only show some so i need more literature to be sure. During the winter i will get some more. I like to learn by myself first together with internet. 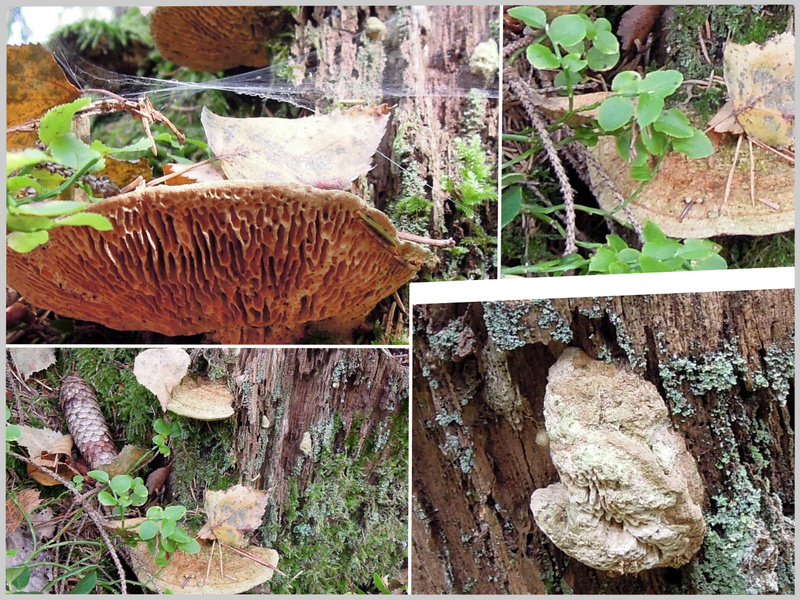 The true importance of Polypores may be much more advanched than many would believe. I am looking forward to learn. The number one advice is to look where you live and around. It is important to search and to be there. Use your own mind first. It is also helpful to understand what tools that would be required. It is personal experience that is best. It gives me great joy! 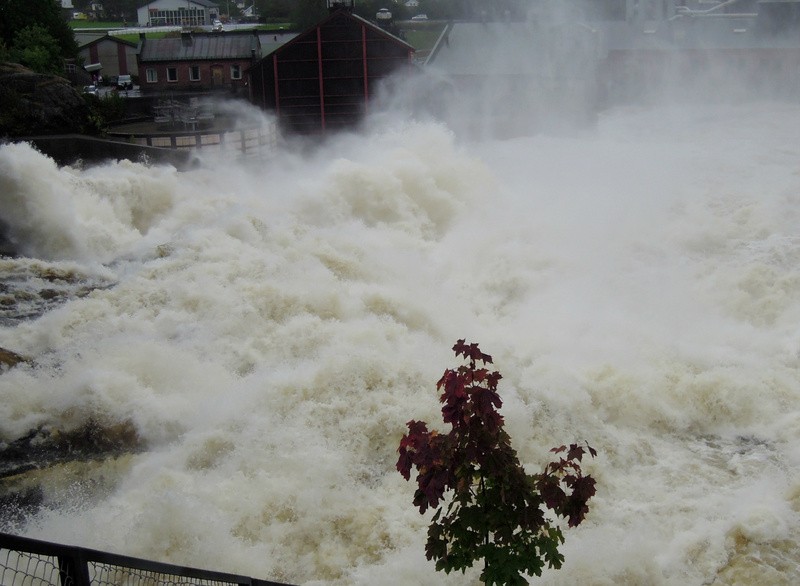 One hint is to follow a river, find out places it stands still. 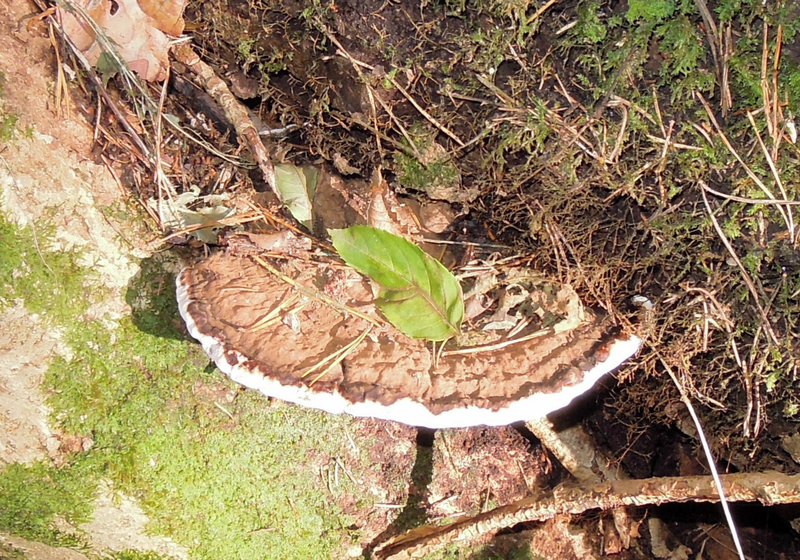 Another hint is that Polypores may also travel from a warmer climate country and settle at places that it should not. 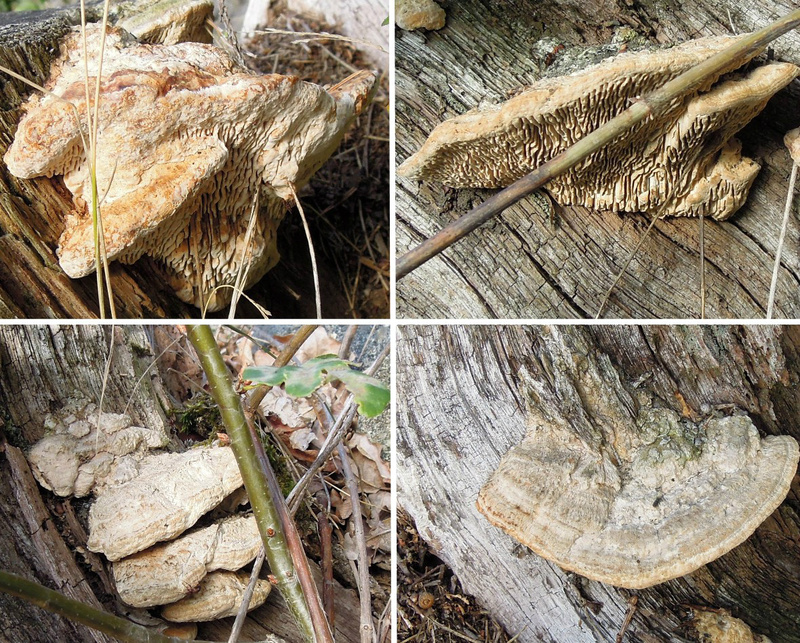 Polypores may have advanched mechanisms. Some countries has done advanched studies on them. They had great importance for culture, history and traditions during human history. 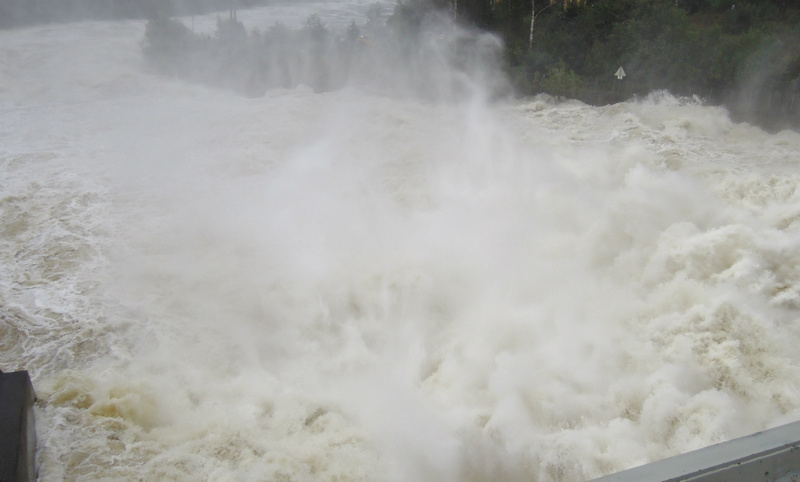 How will climatic changes affect?! What will happen with climatic changes? Just a few degrees difference, what will happen? 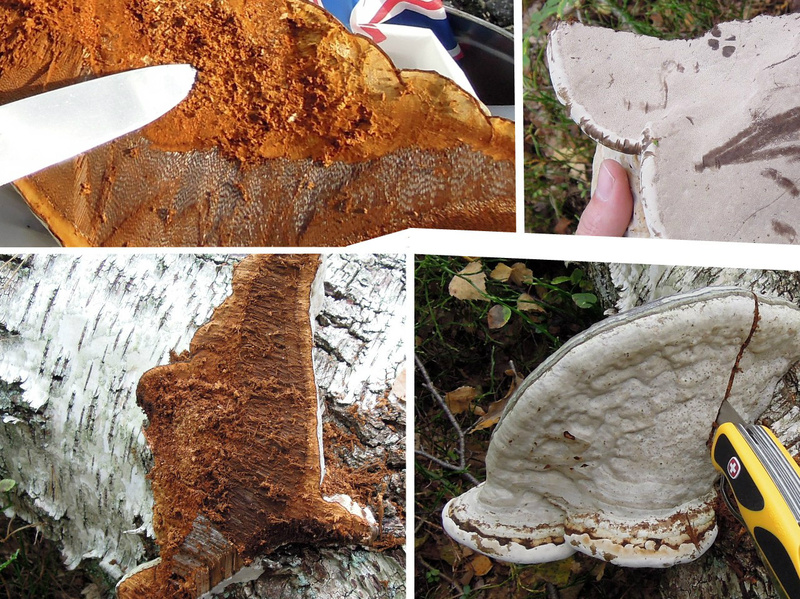 Polypores will be larger hobby and research study for many people in the nordic countries, this i am sure about. We are witnessing the climate changing and part of it if we like it or not. If you look around Sakhome.com you will see what i have been doing the last years. 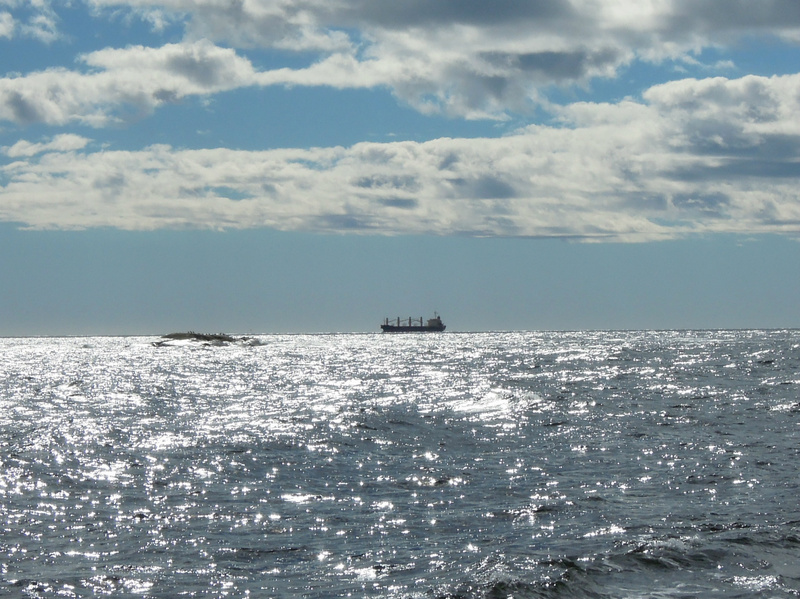 Have used the river and the sea, the islands and the nature where i live. 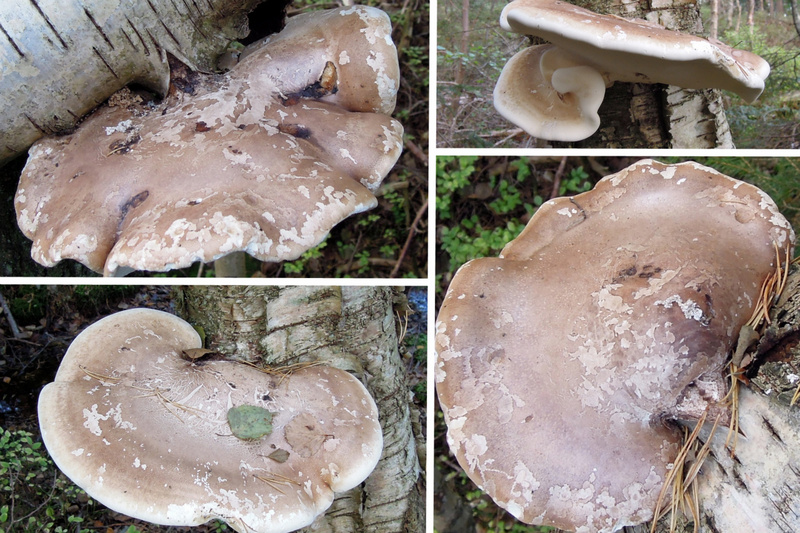 The last year the Polypore interest started again. Everything on my page is real. Before i have also been rather far north in my country. I have much knowledge about knife use. 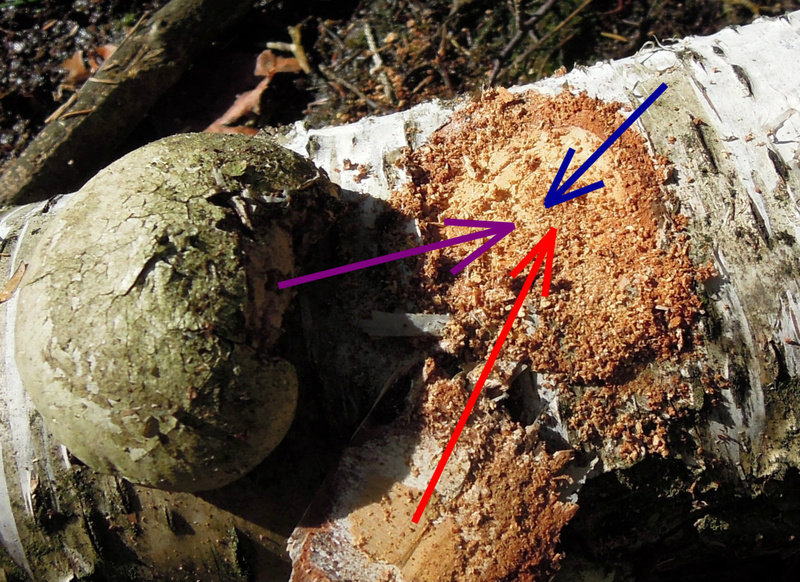 The pores can distinguish and identify Polypores. The color, scent and pressure can be used. 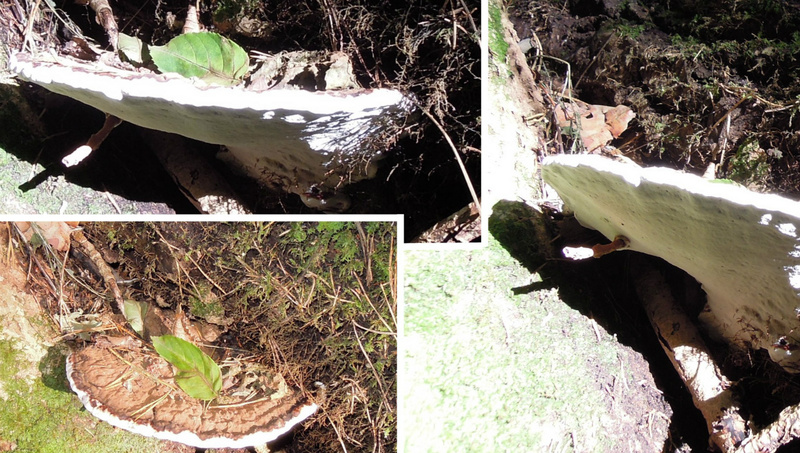 Here is a Polypore that i wonder about. It was very wet and could it be old and about to rot? It was very dark all over, the top had a few brown areas. 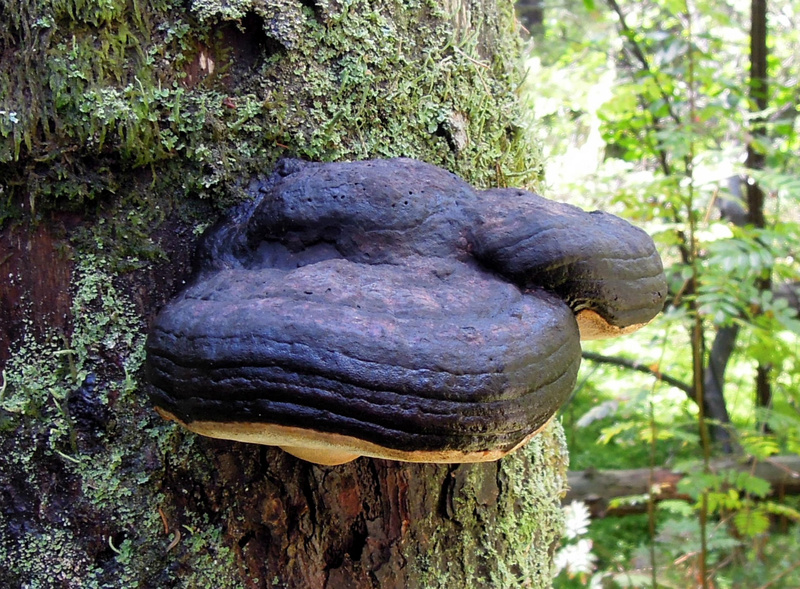 Phellinus was the first that came to mind after the first distance look that always says Fomitopsis pinicola. I can not remember any scent. The pore layer was diffcult to distinguish. 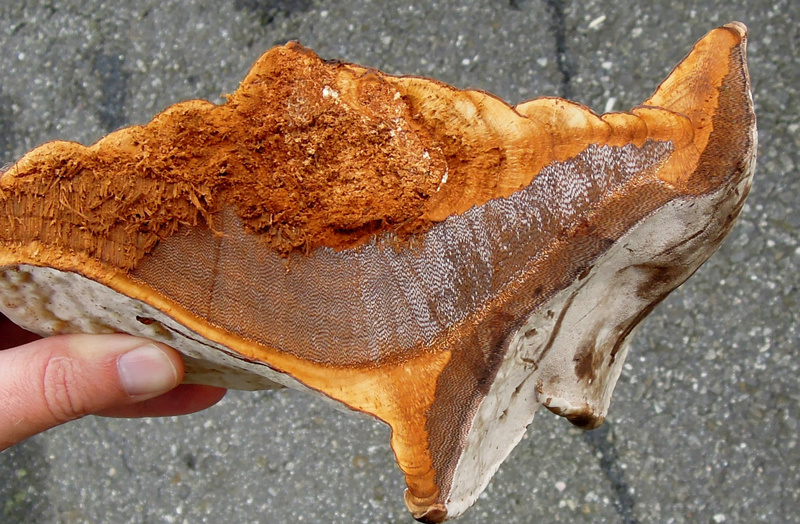 Brown rot break down cellulose. 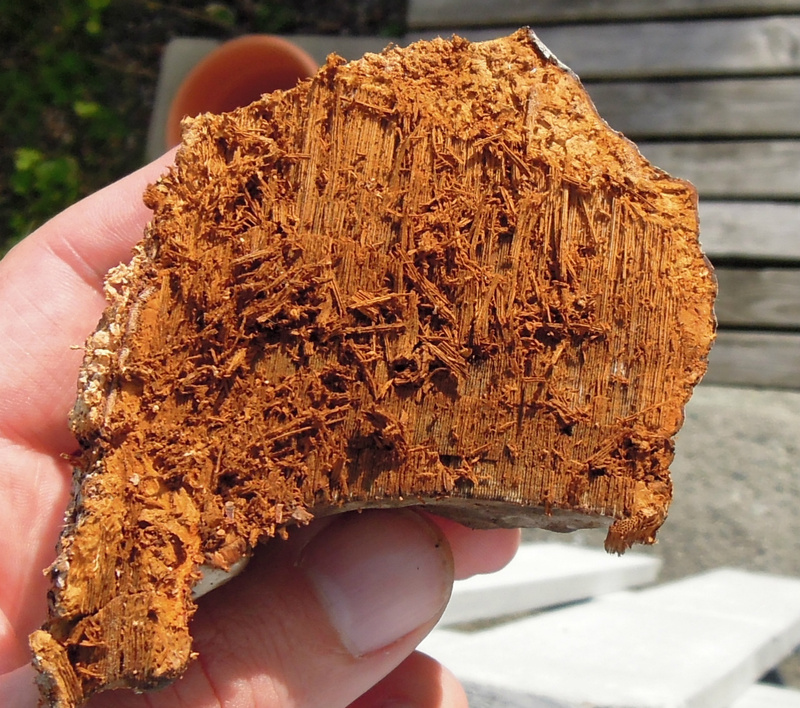 White rot break down lignin. 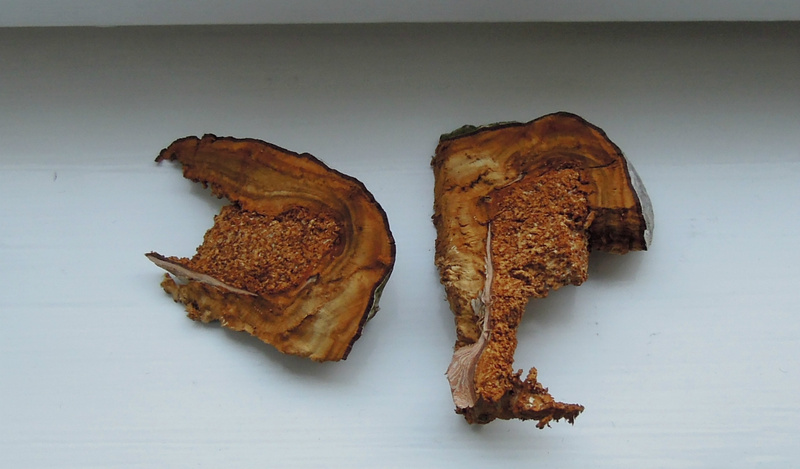 The rot processes are heat affected -sommer vs winter. 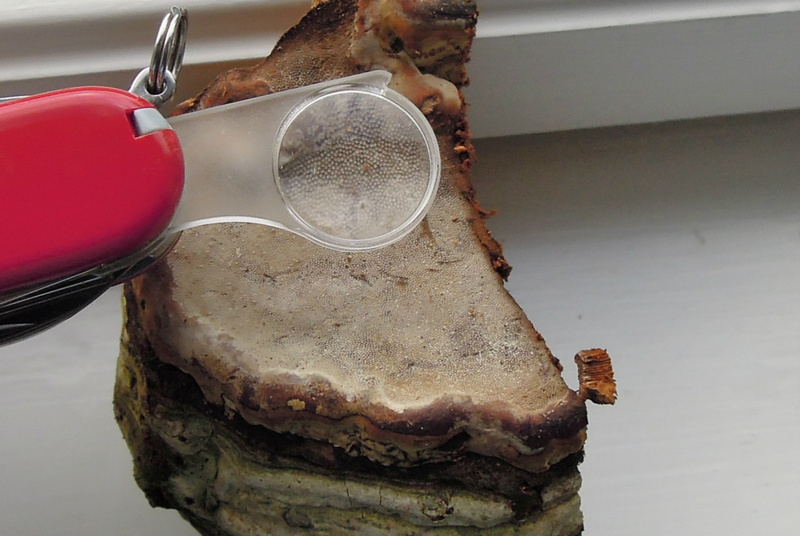 I Wonder if anyone have tried a laser heat measure on Polypores? Rot produce heat, this i have always known. Temperature, moist and heat produced are dependent. On various sources i discovered antifreeze proteins or cell protecting mechanisms. 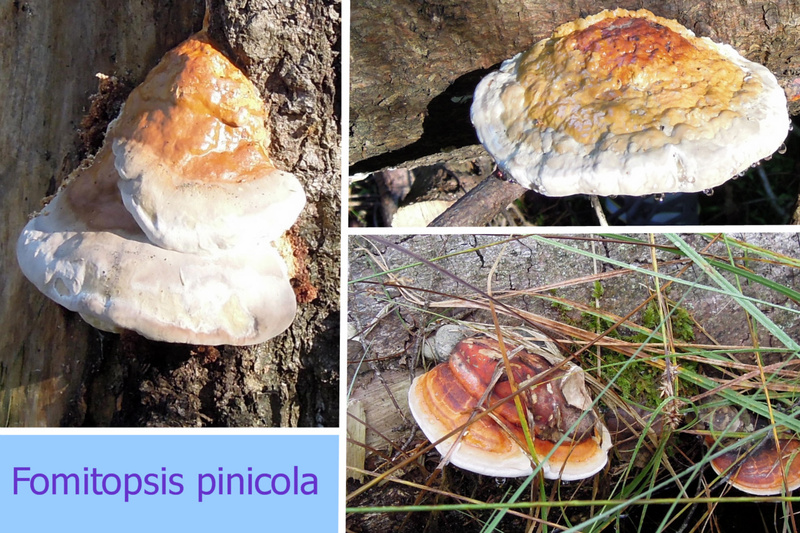 It would be interesting to research how Fomitopsis pinicola survives extreme cold. 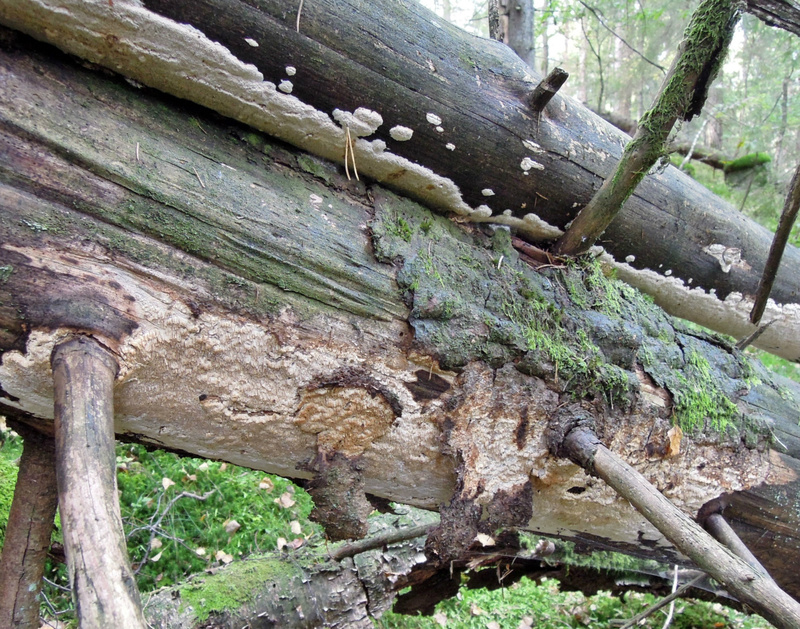 It is actually incredible because a spruce log and fungus may contain huge amount of moist and water. Still it survives! 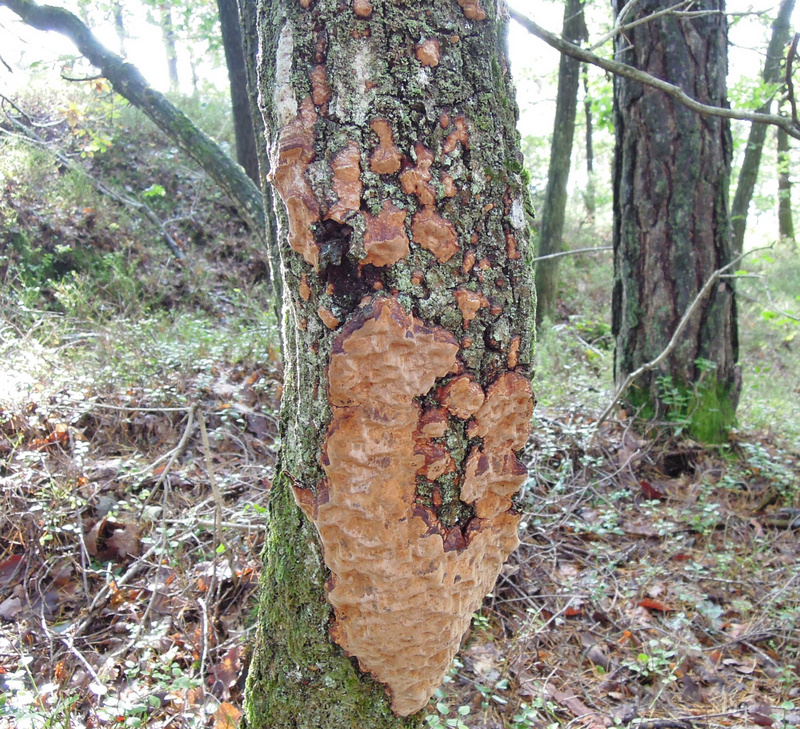 30.09.2015 This morning and it must be Ganoderma applanatum. The left one was very slim/flat. 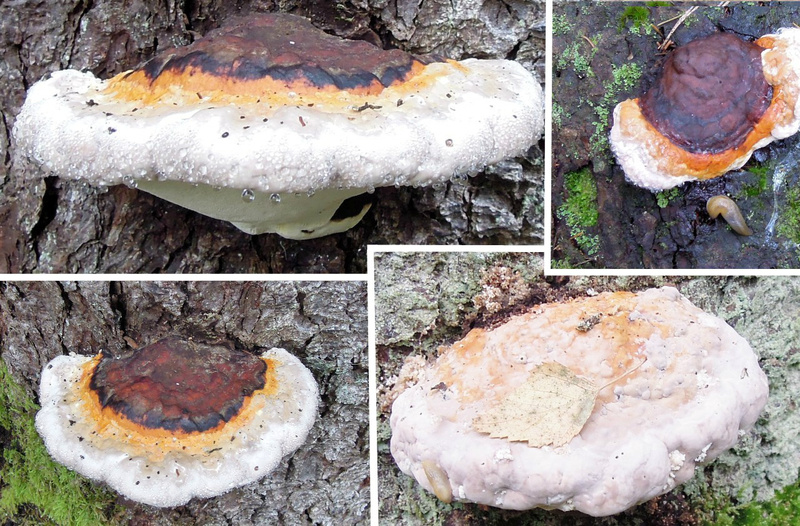 All of them covered in brown spores both under and over. Pictures with flash show the spores better. 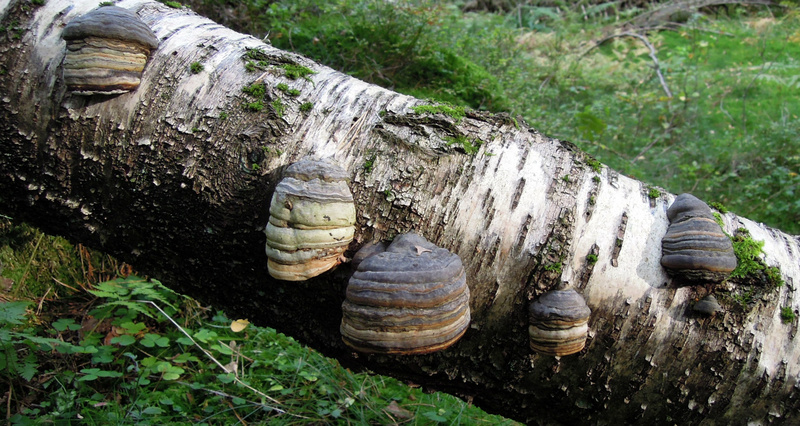 Ganoderma applanatum on birch. Also today i found this again, it is very large and i probably need more literature. 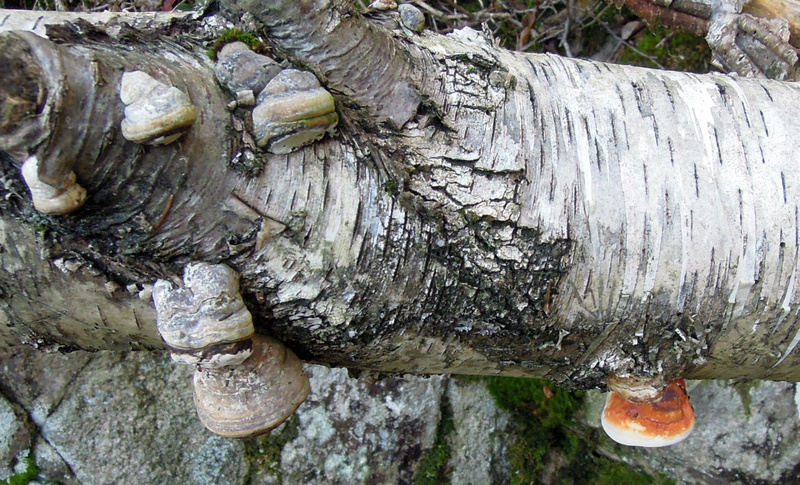 On the same birch tree. 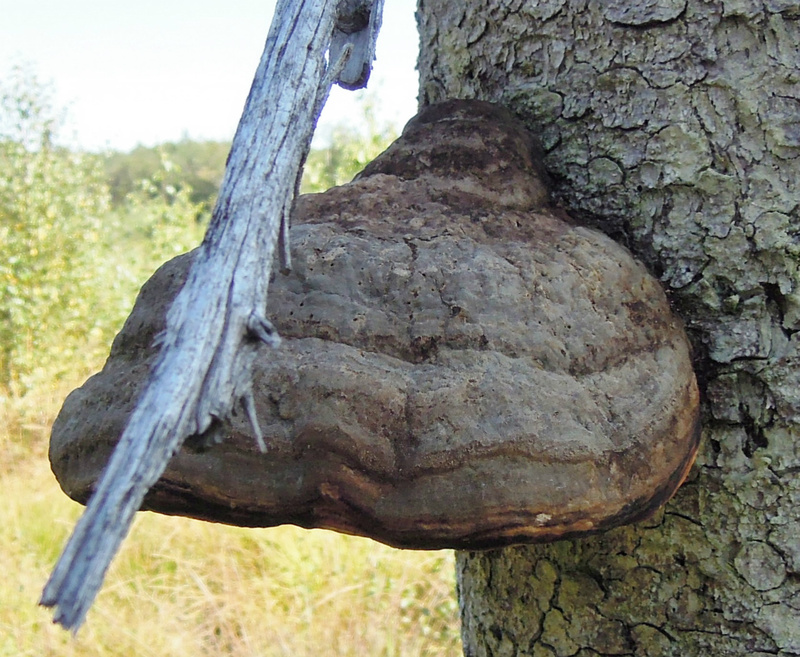 Phellinus lundellii, Phellinus laevigatus or Phellinus ferreus? 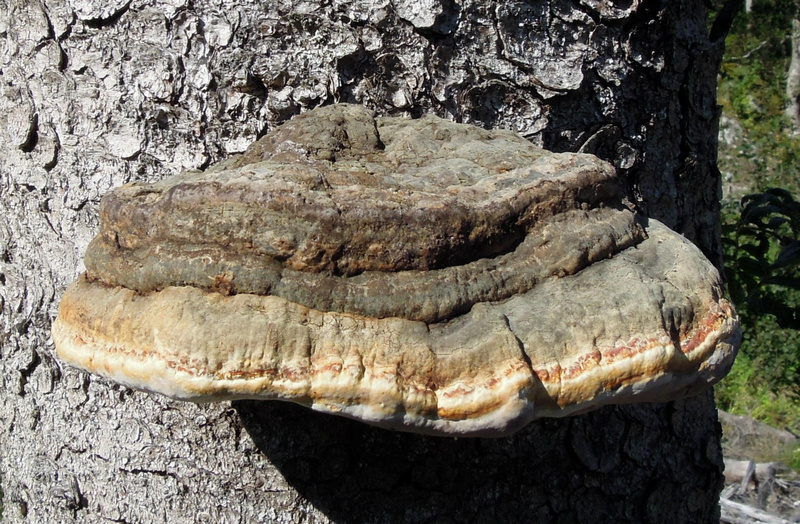 It is tricky to see and one side it had thin layer with cracks, the other side thicker and looking like Phellinus lundellii. It is fun! 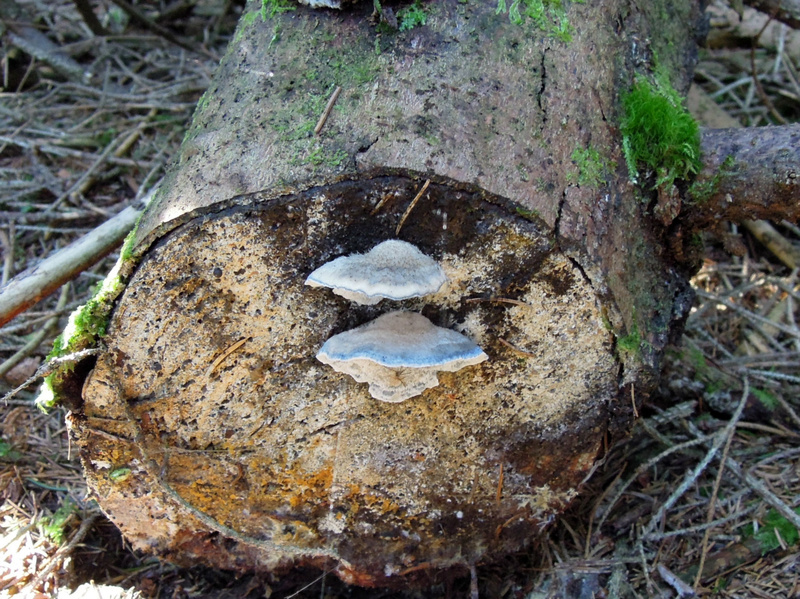 The pores, on spruce logs. 02.10.2015 This picture is a couple of days old and i just took it passing by. 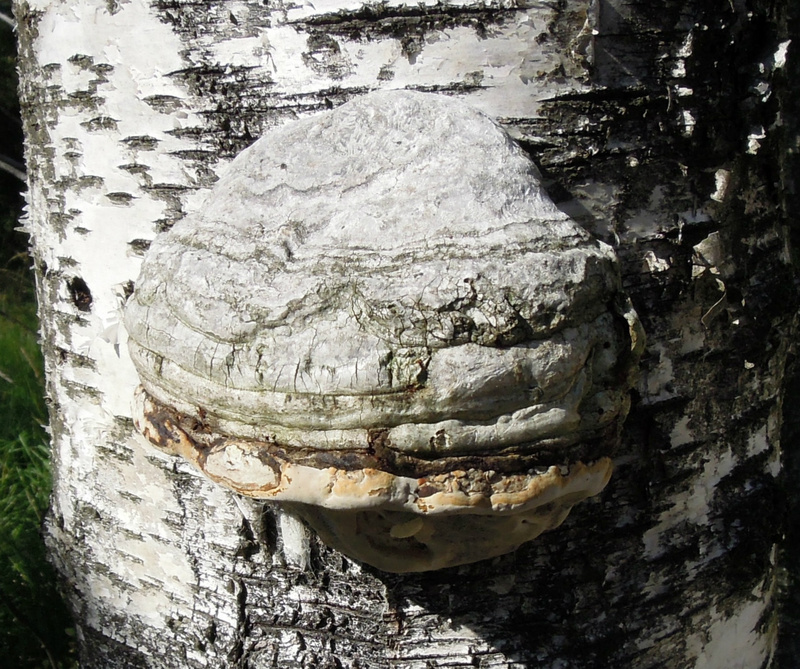 On a birch stub. If identification one must have picture under one and how it is placed. Just by my picture it could be Bjerkandera adusta. The pores on this if it is so turn black with pressure. 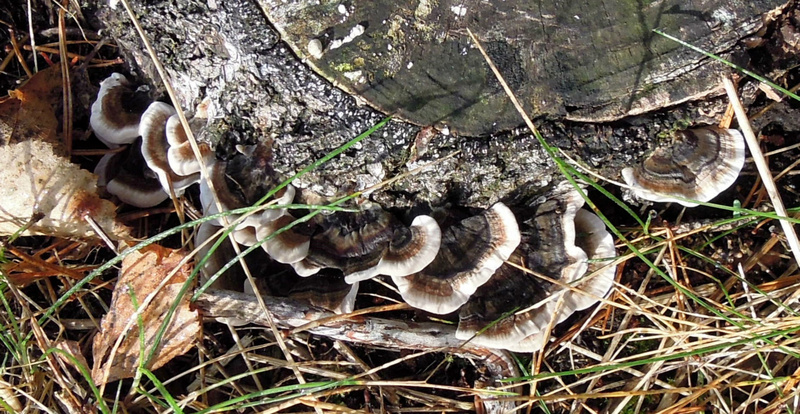 It could also be Trametes versicolor. Remember to take notes on the shape and size! I found this today already on the ground i am not sure why, could be many reasons. 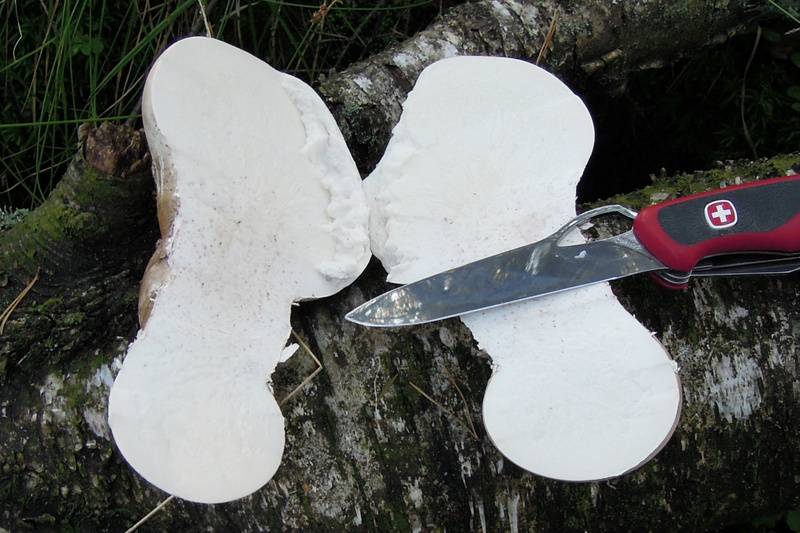 Anyhow i cut this Fomitopsis pinicola in two so you can see the new pore layer that they develop each year. When these are dry they are hard as wood so you need a good saw. This was not hard and its been on the ground for some time. When harvesting them they can sit really hard so you need a saw. The New Ranger can be used for everything. This is also passing by but i remembered to take a couple sniffs :) It was a fresh scent. 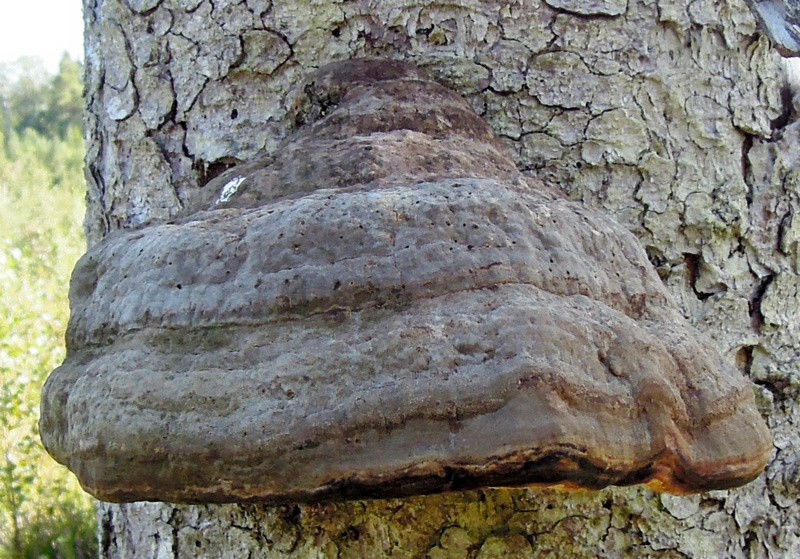 Fomes fomentarius scent. F. pinicola do not smell nice at all. 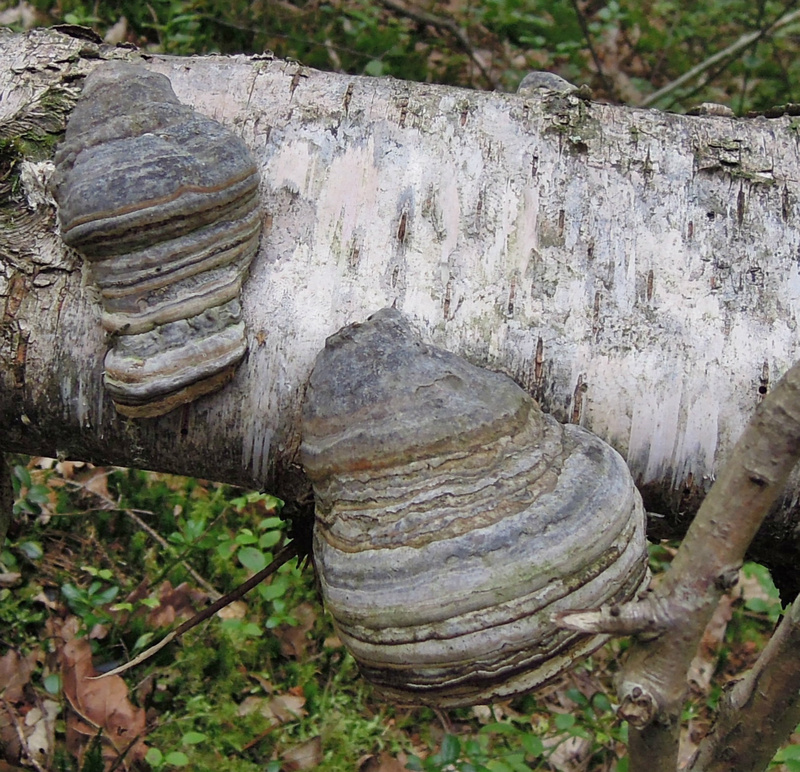 These are probably Fomes fomentarius. Still F. pinicola is a dangerous one to forget. 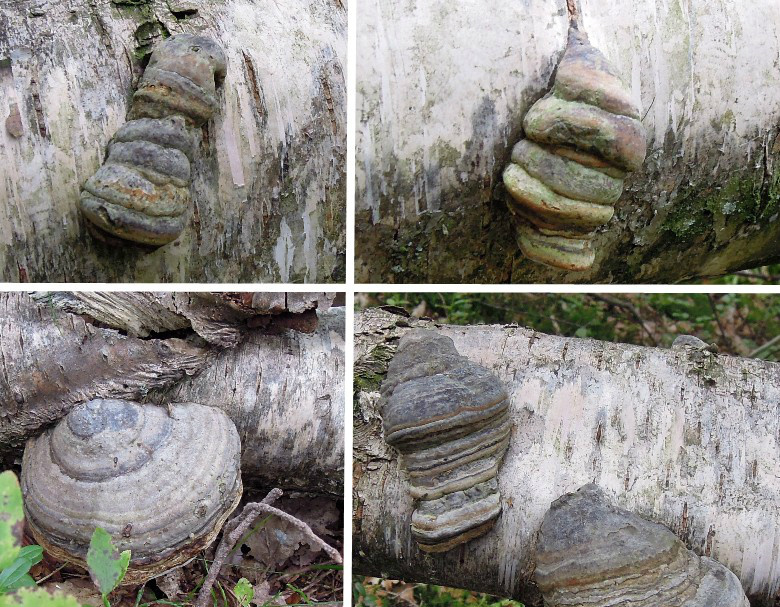 Fomes fomentarius got better tinder abilities and if you cut one in two it is easier to see what they are. 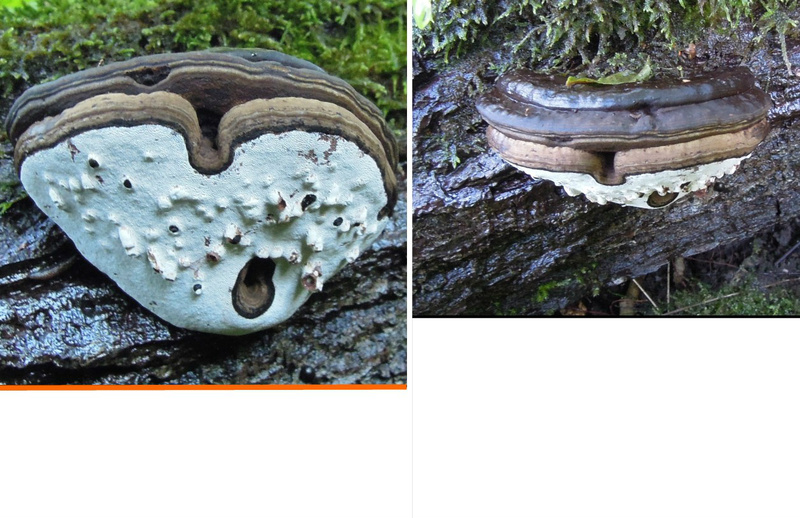 Both got tinder abilities but Fomes fomentarius is Incredible that said. F.pinicola got resin on top. Used my bike today upcountry 40 minutes and walked around for one hour for reconnaissance. 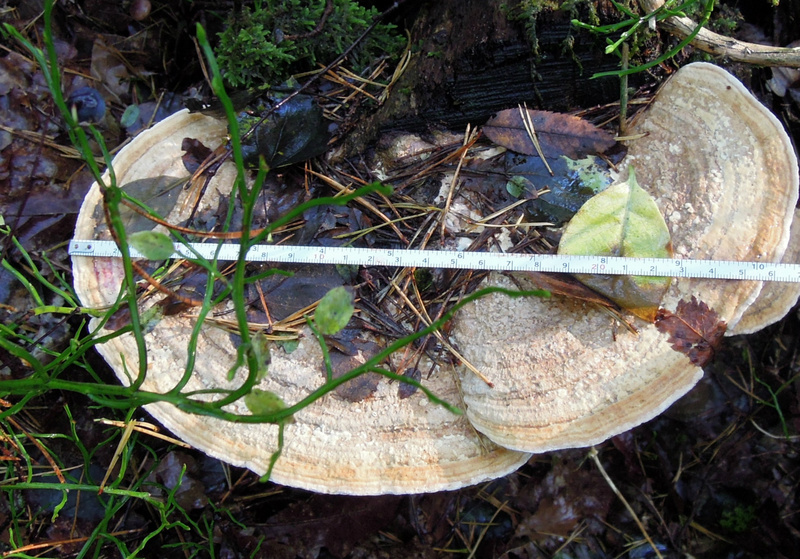 This is a Fomitopsis pinicola and rather large. 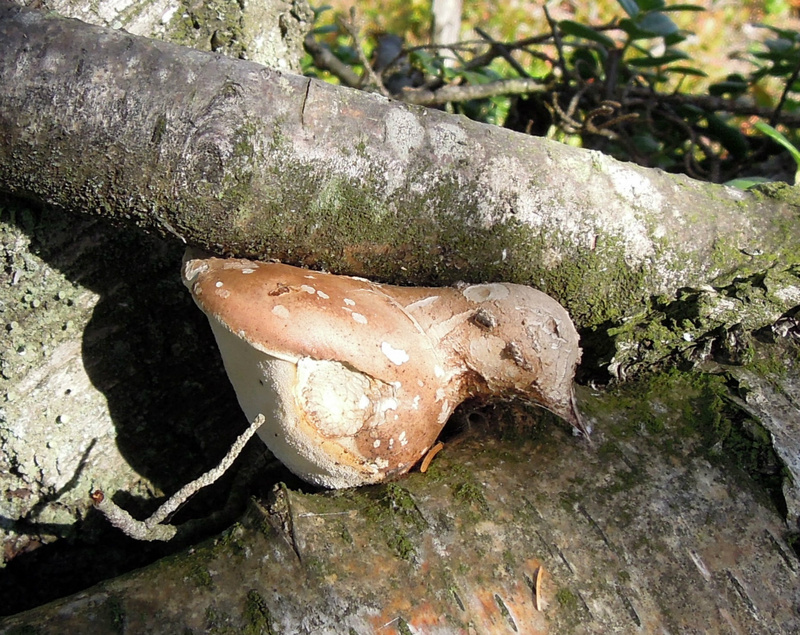 Polypore hunting is excellent for using the legs,body and mind. I feel that it is best to see all terrain with constant changing. 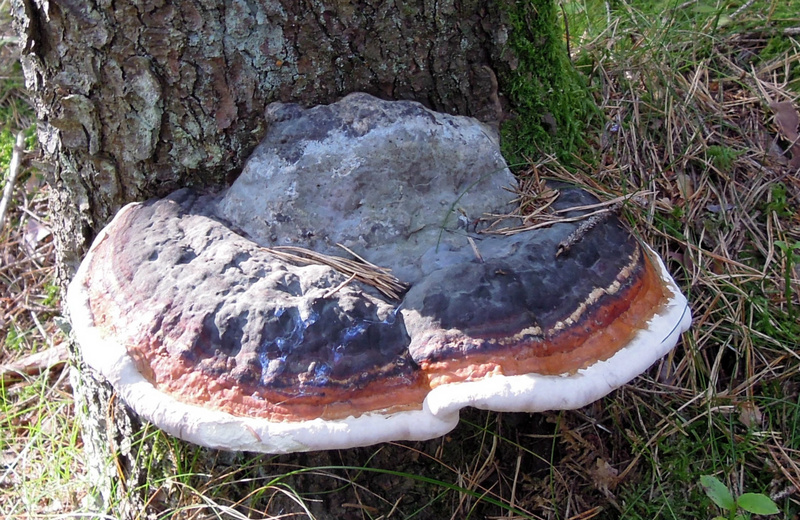 03.10.2015 One helpful thing to identify Fomes fomentarius is the porelayer. When white or light it will get darker with touch and scratching. 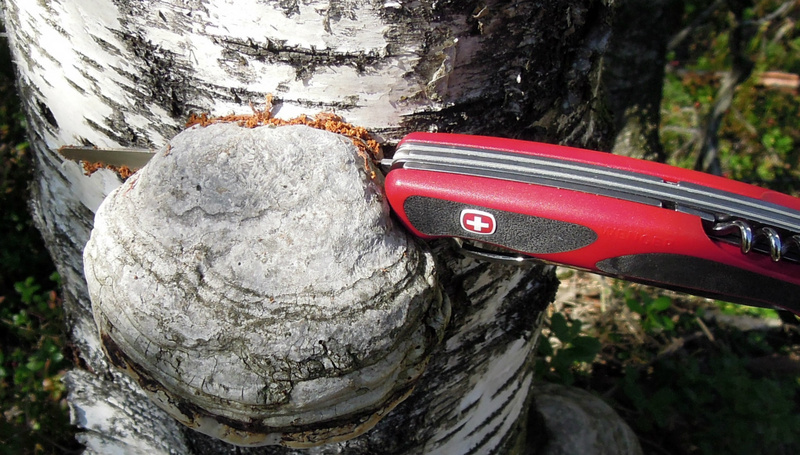 Pore layer develops each year and is white or light that develops brown in time. 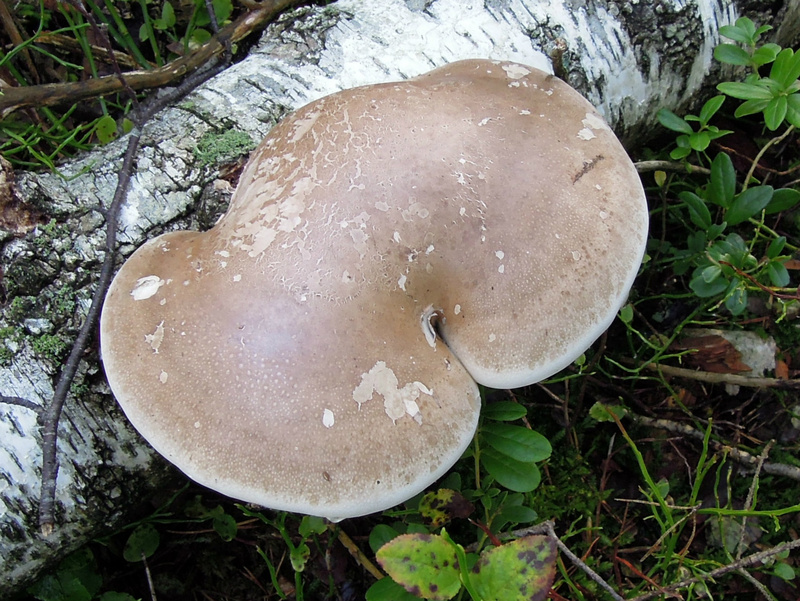 Fomitopsis pinicola will get yellowish. 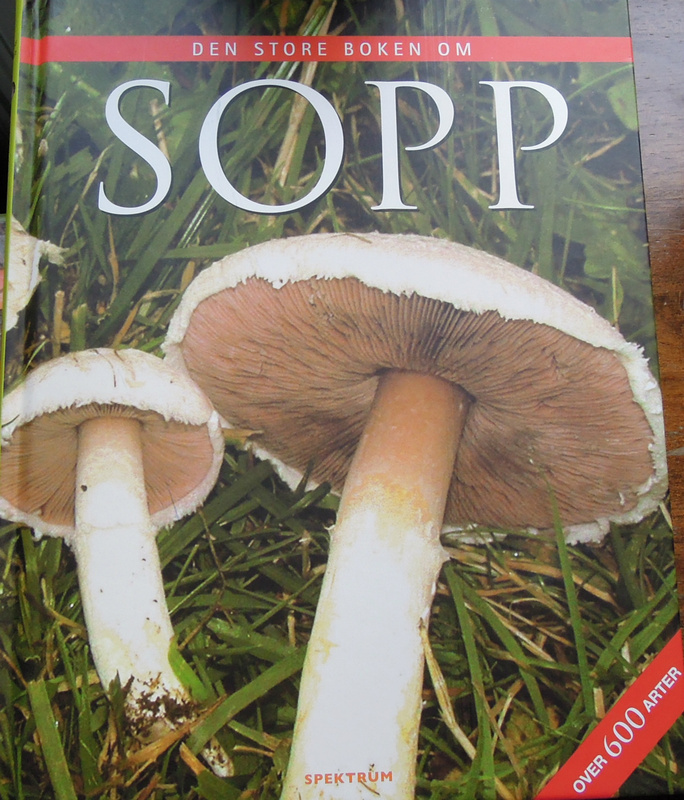 On soppognyttevekster.no i found some nice info to help me with the Polypores that alters the level. 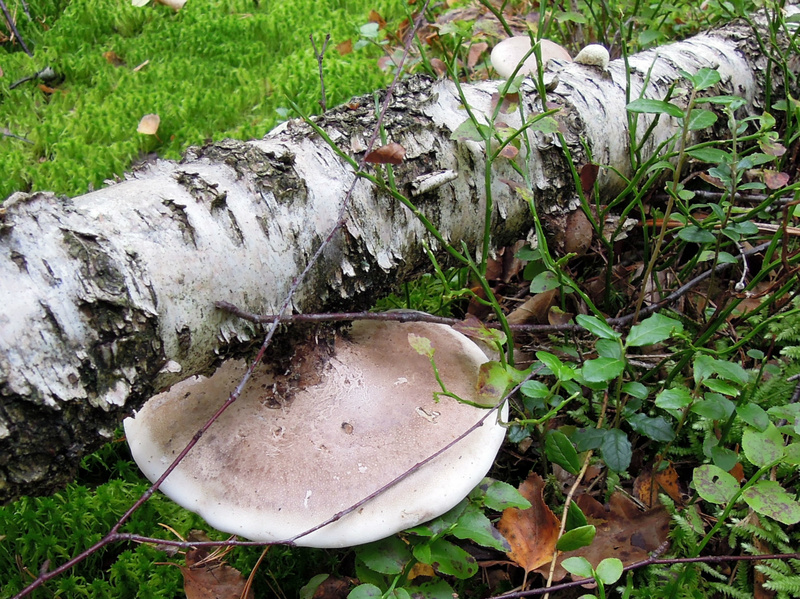 It can be secondary growth and or "geotropisk vekst". Two different things that said. By other words a mechanism. I am on it! 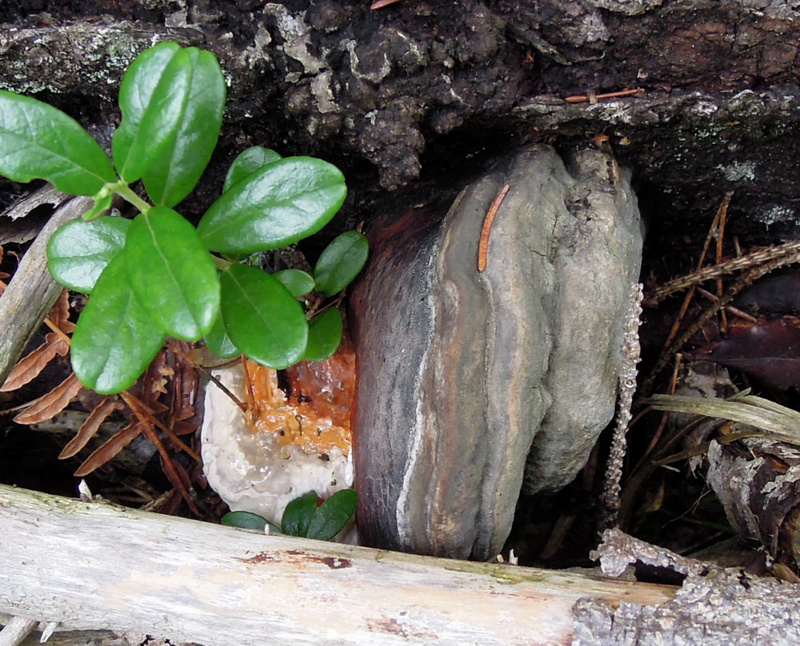 Went back and it is Fomes fomentarius. Took it home, hope i am forgiven. My first impressions correct, it is not resin what i thought but it is a shell like appearance because alternation level. 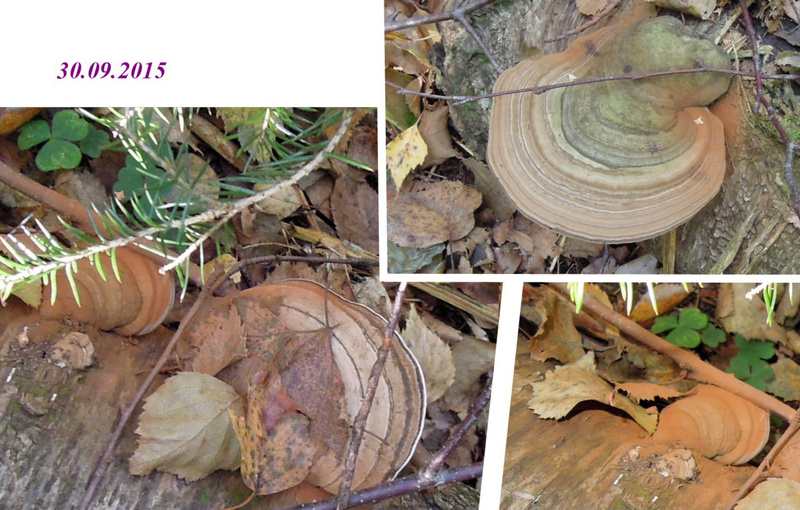 See pictures :) Scent also difficult but more F.fomentarius. Many melt tests and all burnt black, different methods. Please take the time and see my picture pages and my discussion on this and the one on the pre picture. 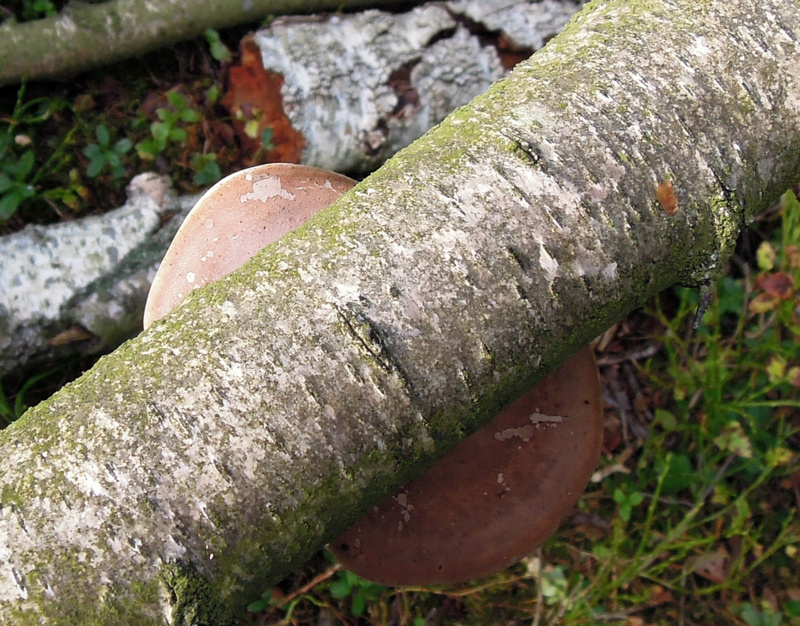 This birch fell because of white-rot. One of the grey puddings had guttation drops. 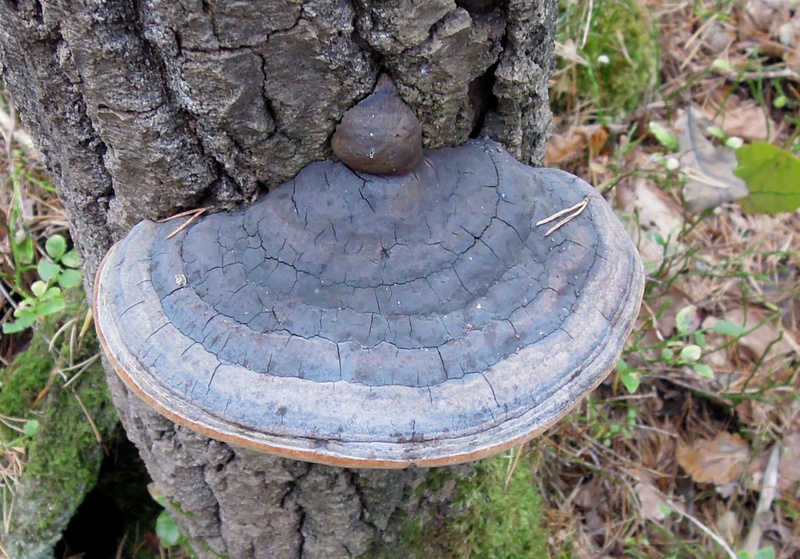 It is now a Fomes Fomentarius. 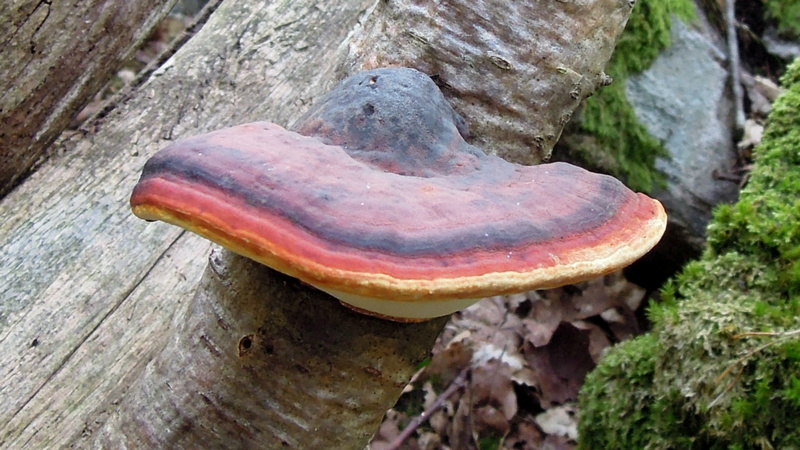 So does Fomes fomentarius have guttation drops? Because the F. fomentarius made a shell like appearance over the old pores it gave me the idea that it got a mechanism for altering the level to be horizontal again. It is why i believe it is the same one that changed and not a completely new. Let me know! It is the ability to make a new layer of pores each year that i wonder about too. 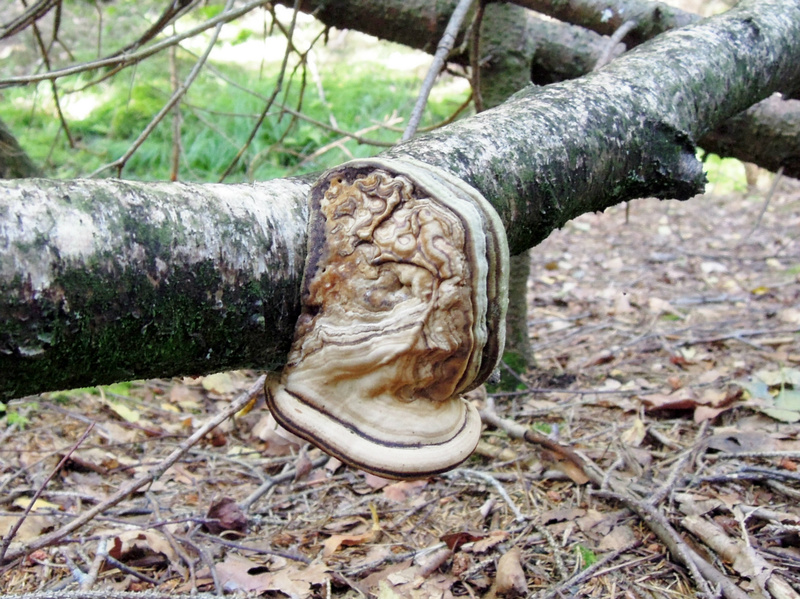 If the mechanism on a Polypore is related to stopping the development of the old bracket and change into a new level. The New layer is at correct level. The trama has grown at the old tubes and pores. It is reallly interesting! 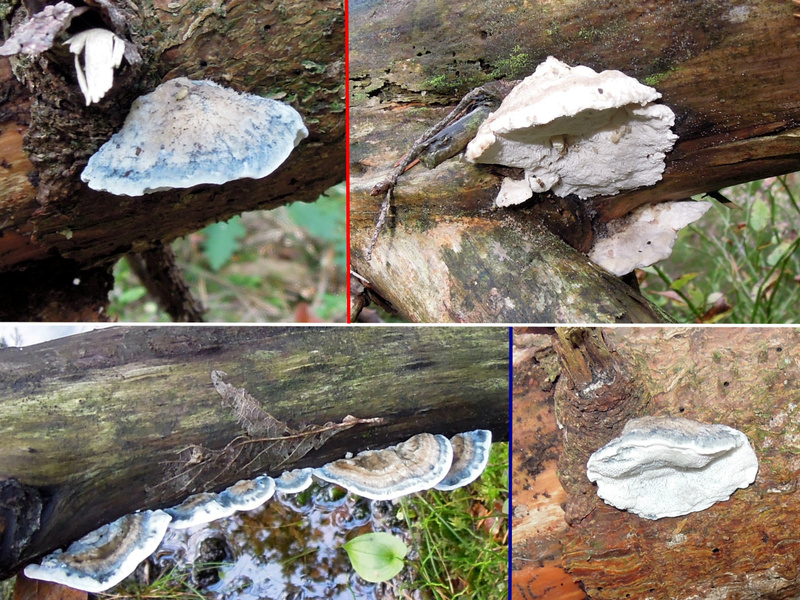 04.10.2015 Here is the picture with what i thought was resin but it not, it is only the changed appearance the Polypore did because it was alternating the level. The only conclusion i have is that it is a mechanism. It is like it knew the level was wrong. This is a picture from pictures page 13. You can follow my pictures and my impressions. How i am trying to learn and just how difficult it is. Feel free to inform or correct me. 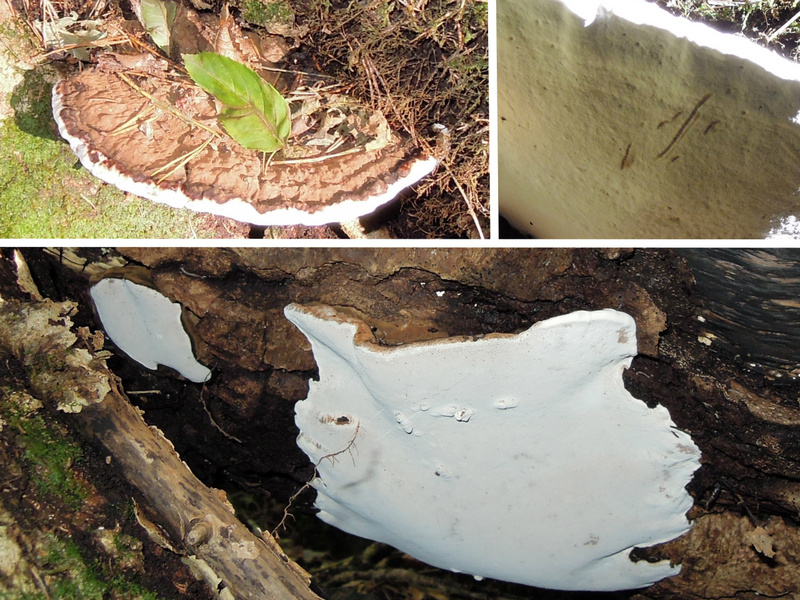 This Polypore has been very active and changed fast. It ended at my home :) I had to because it had all the features i looked for. I am not afraid of try and fail. I would say it is how it must be. If you have an interest then jump into it. Be much out, learn and have fun. The core on the picture is small, i should have cut a bit more into the log, it was possible. 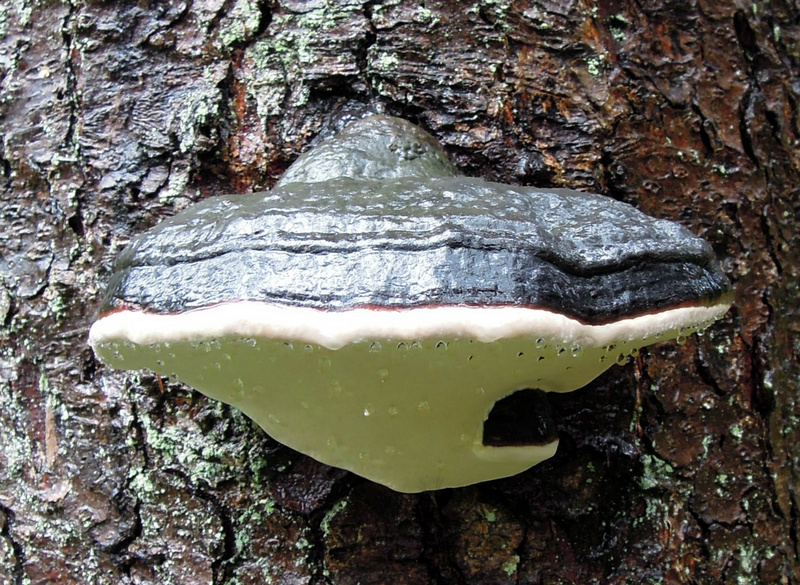 Some more about this Phellinus: i need more knowledge and i need more time. 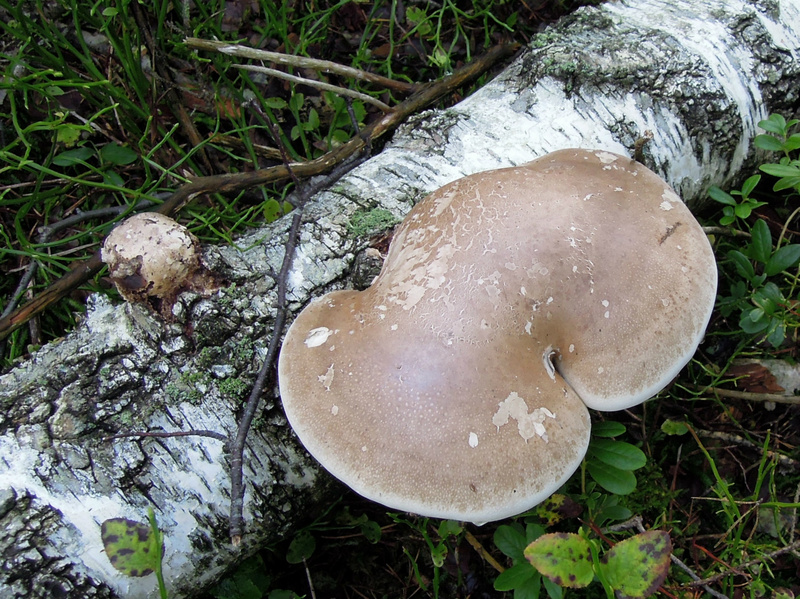 I found mentioned by Halvor Solheim Phellinus populicola and tremuliae so it may not be P. igniarius. I know where it is anyhow :) It is Incredible fun! Rock on! 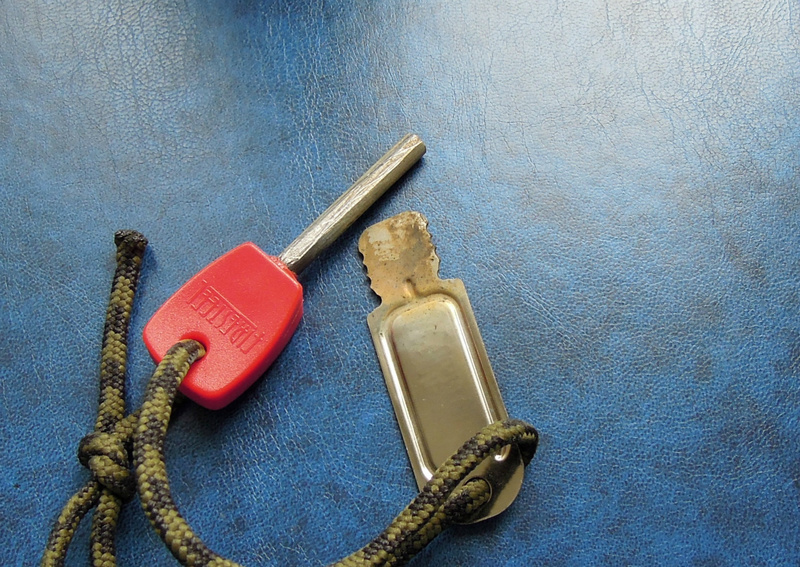 05.10.2015 Firesteel is a multi tool in itself. 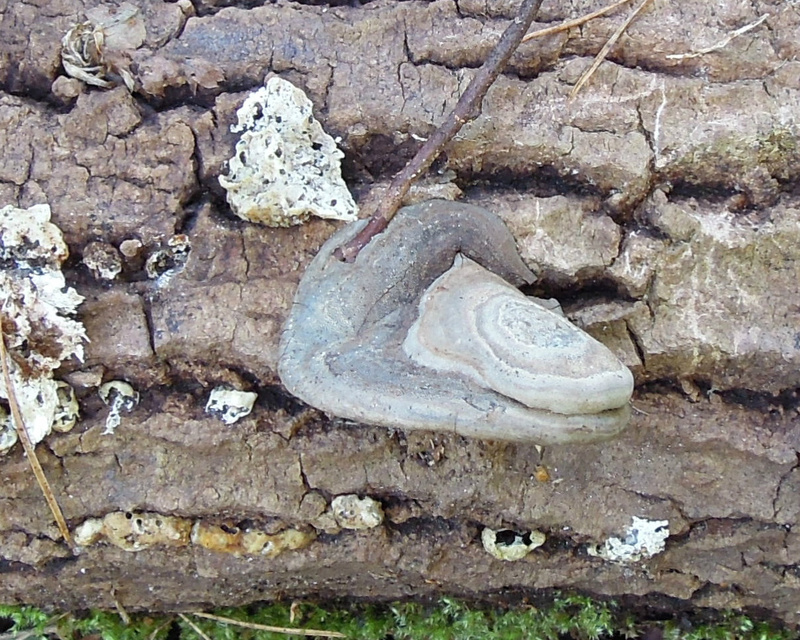 This and F. fomentarius walks hand in hand. The best is to cut the trama out and soak it then hammer it flat. All substances will mix. Dry very well and break of pieces. 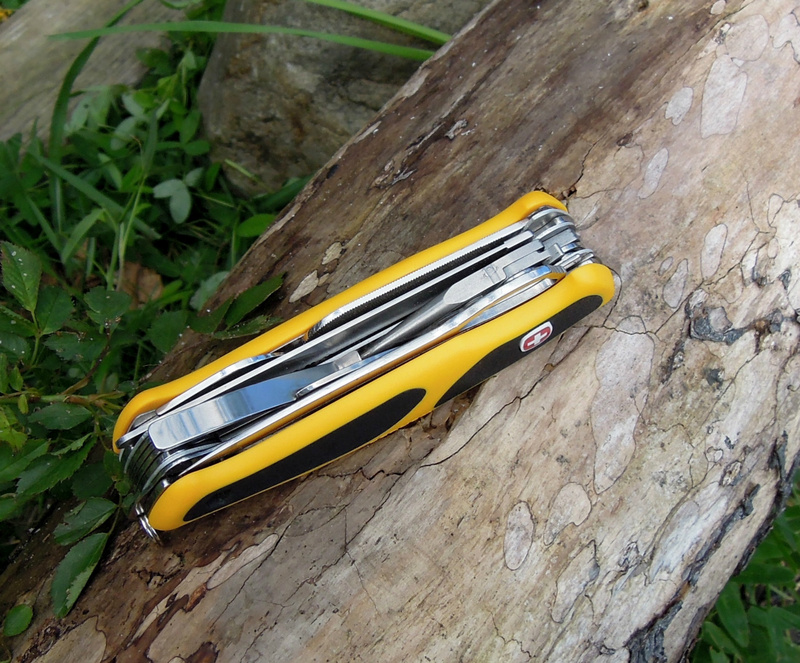 Use the knife and scratch the tinder with the edge for the spark from the firesteel. 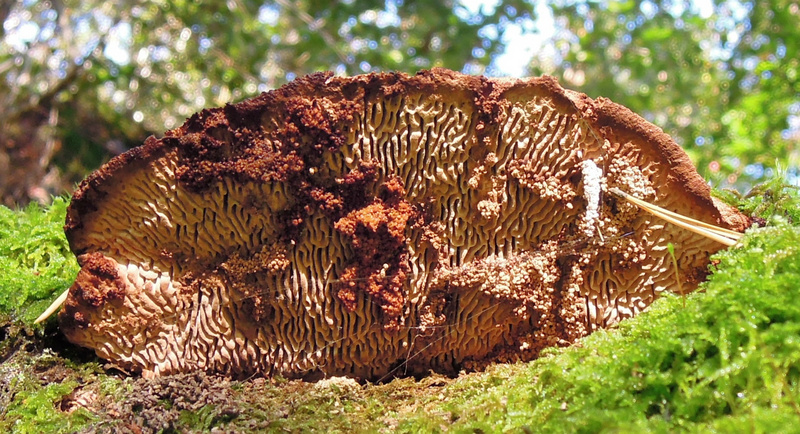 Passed by Polypores, i know where they are. Got an idea what they are. Without a doubt. This is the one you should look for and learn. 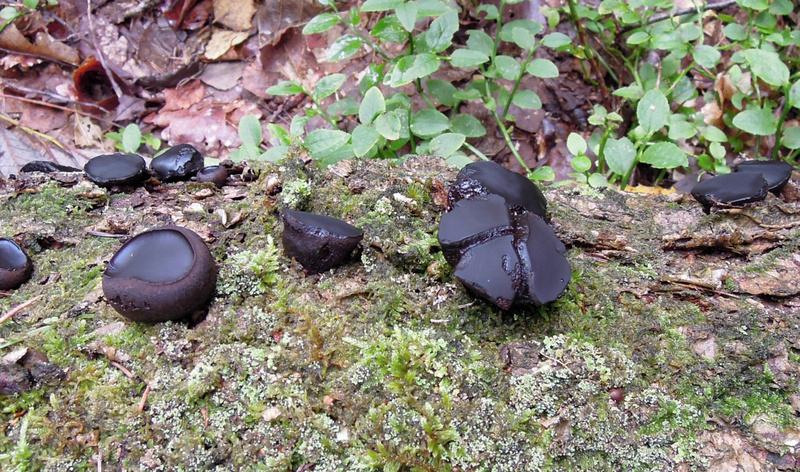 Fomitopsis pinicola. That said do not let yourself stop with this. You will understand what i mean when you start. 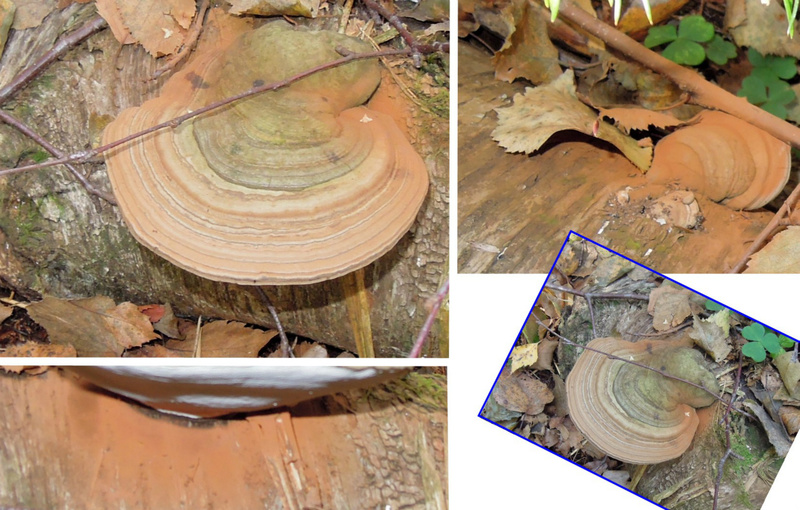 Aka Red-belted Conk..
06.10.2015 The left one is just a couple days ago. Here is a larger picture of this one. 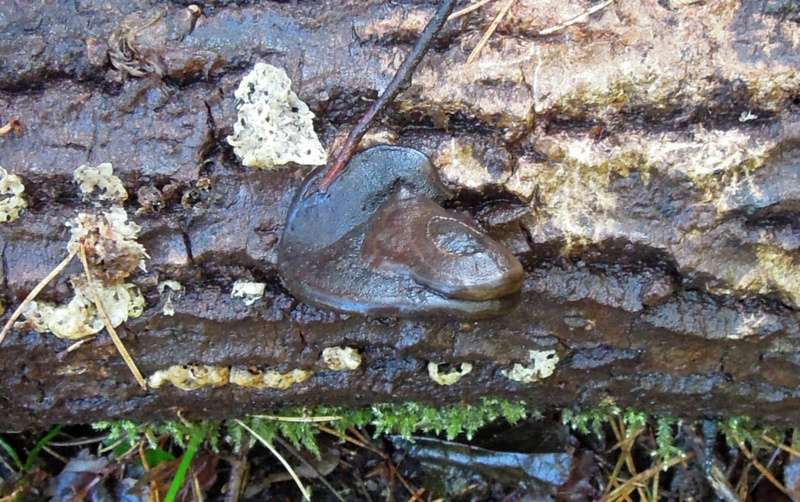 Guttation drops are common on Fomitopsis pinicola. 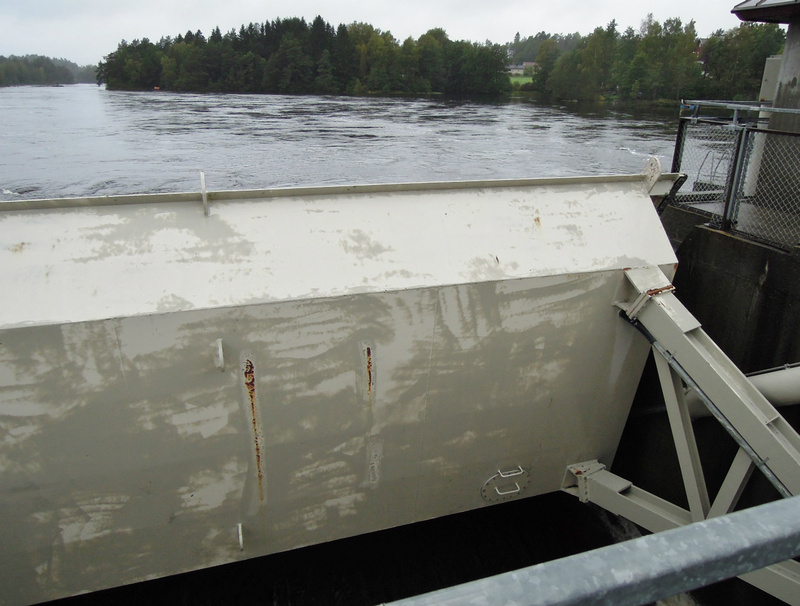 On this the guttation drops had come out on top of the rim and not only under. A bit grey weather today and windy. 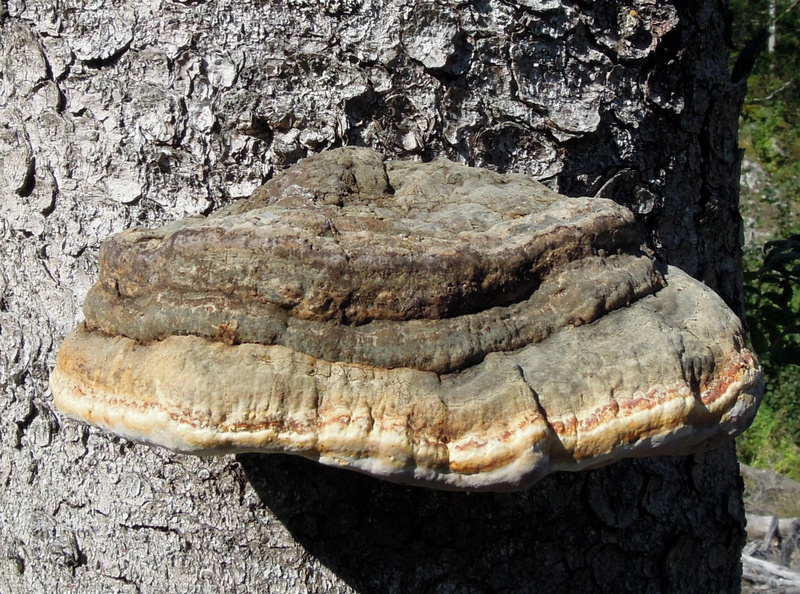 here is this Phellinus again with one of the leaves from the tree :) Should be aspen. The stem is long on them and flat on the sides.. Correct color too. 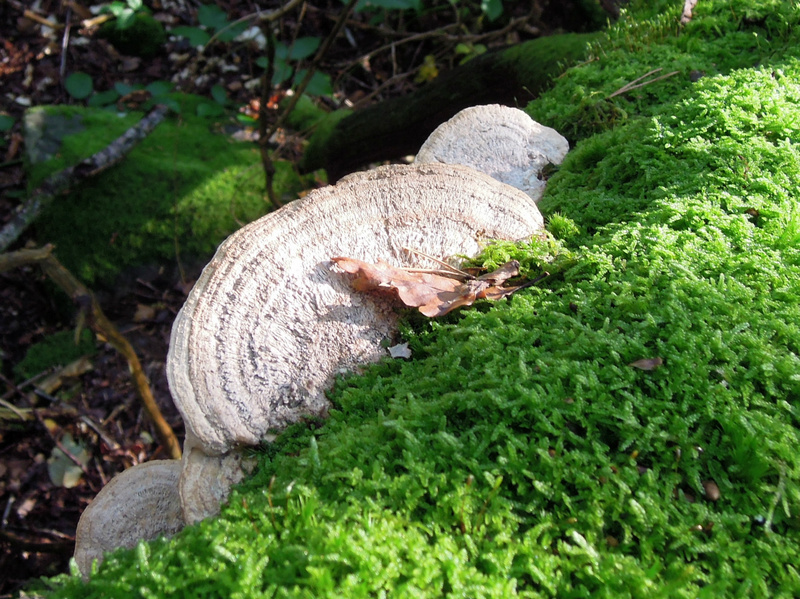 This is a polypore on a dead fallen tree. 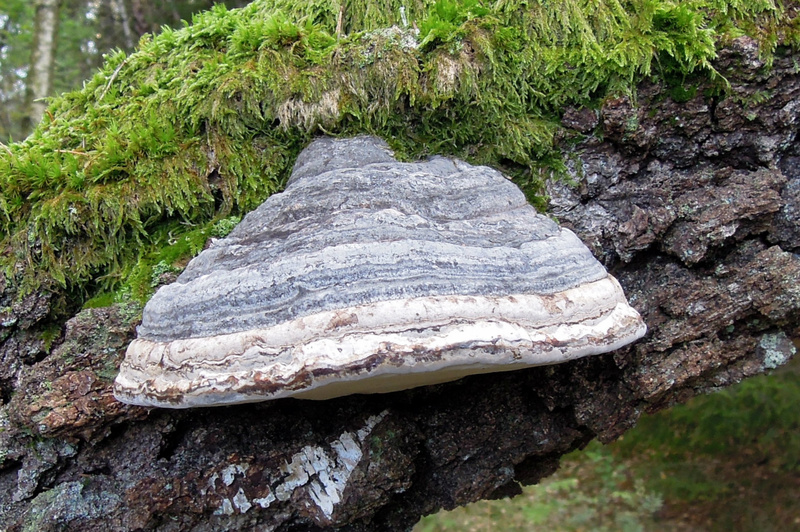 This i need to look furter on, i do believe it is a Phellinus! 10.10.2015 Today in the gray weather, really happy with these and pictures. 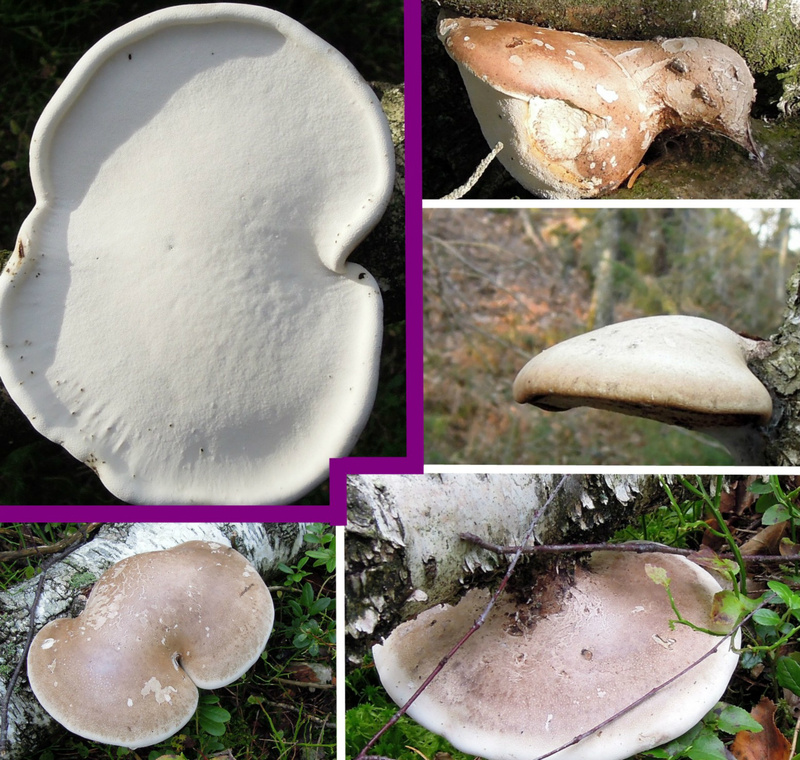 Piptoporus betulinus comes in many shapes. 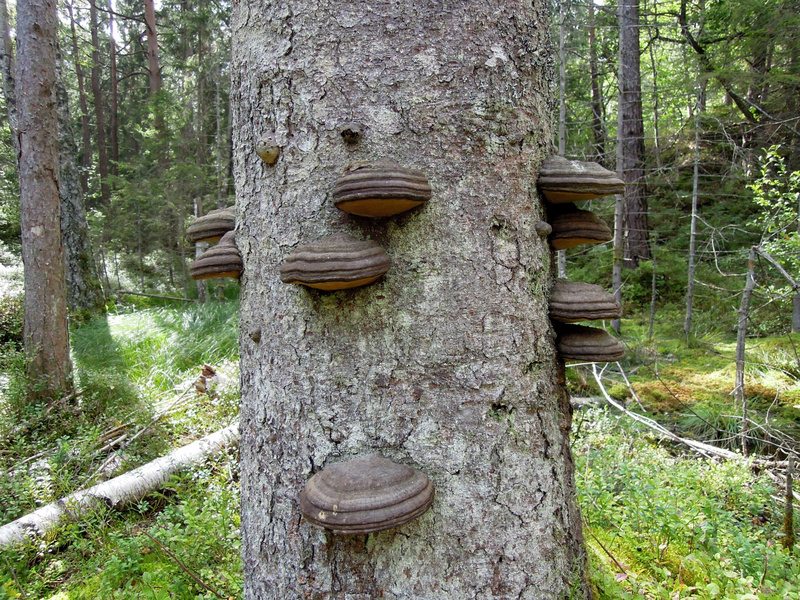 They are one of the great polypores in tradition and they look good on a picture. Also today this Fomitopsis pinicola. It not much left of this root, probably spruce. 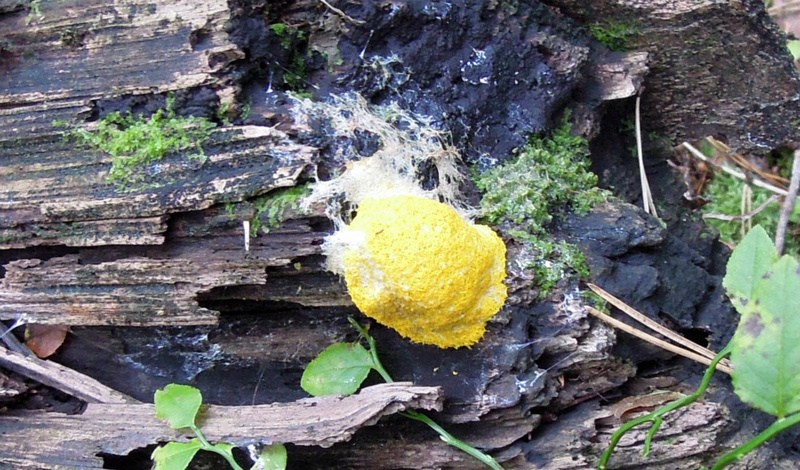 There is a certain point where the fungus is no longer able to produce a fruit. 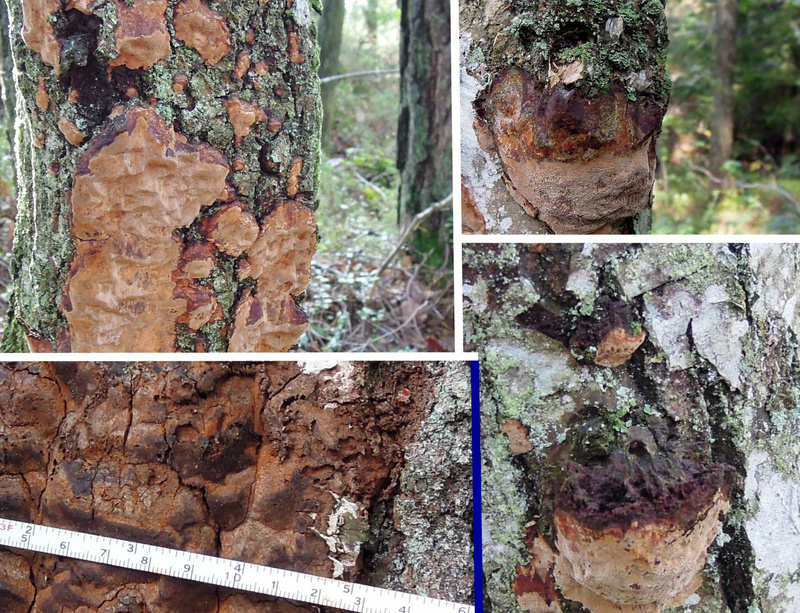 There are also parts of different tree`s that the inner part may last longer and so on. 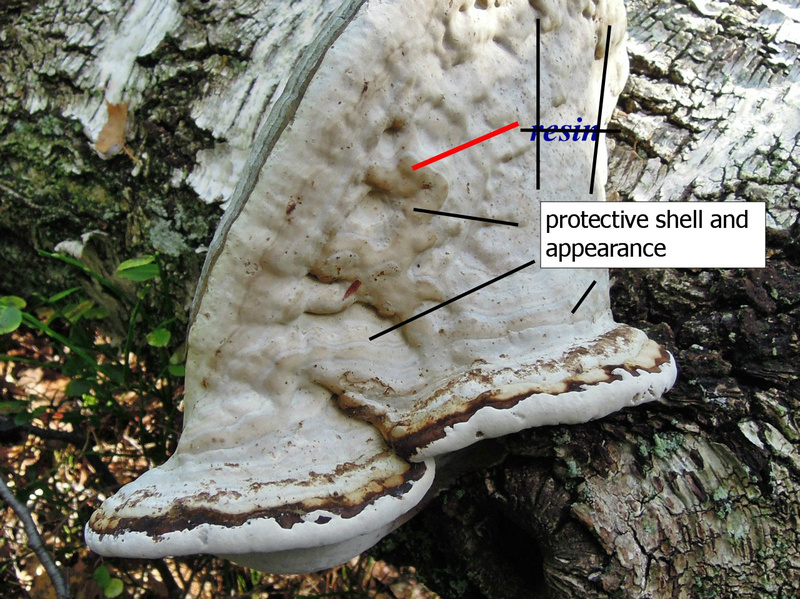 With Fomitopsis pinicola it may be difficult sometimes to use a scratch test on the pores to get the yellowish result. This may because of stages in development. 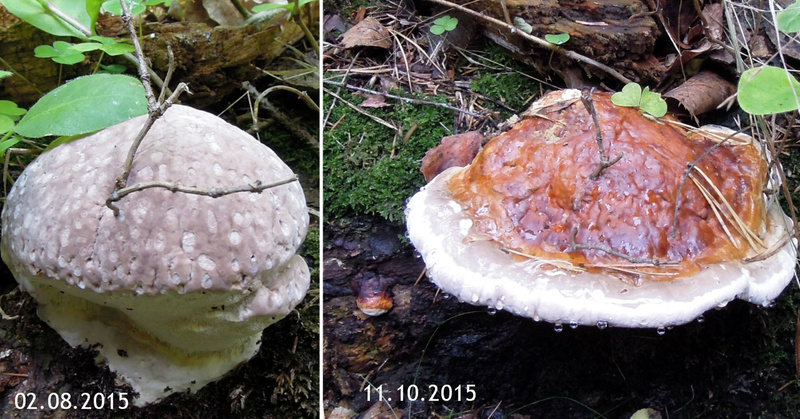 11.10.2015 Remember this that i suspected to be a jung Fomitopsis pinicola. I do believe it is correct. This is slow in development and still small. It is not much bigger but is is starting to develop a kind of shape. The rim is actually into the spruce part. It is very strange in form. It is starting to make two new shapes that i suspect will develop new rim`s. A kind of secondary growth because the rim and pores was already kind of developed wrong. 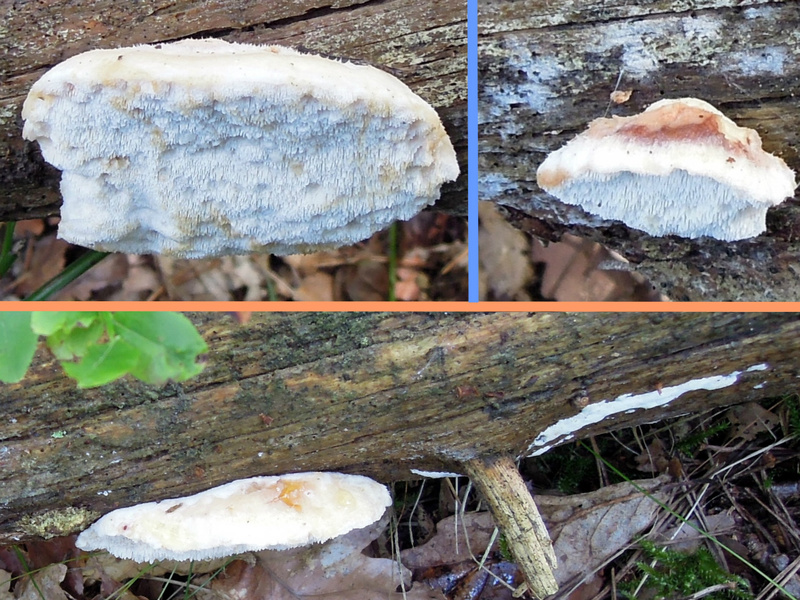 Piptoporus betulinus, the top one i found today. It is a very nice example. 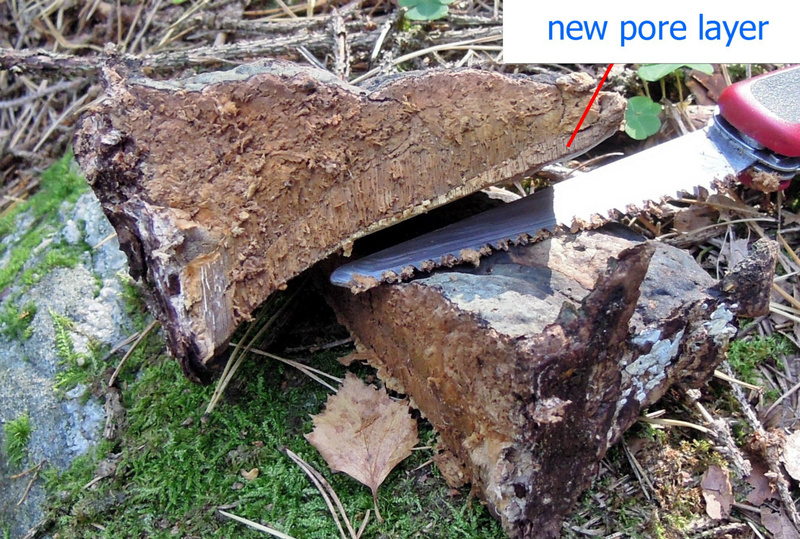 and yes the little twig may have influenced the new shape of the Polypore! Vedmusling gloeophyllum sepiarium. Notes: what seems like guttation drops or tears under it. I do not believe it is because of rain, they had color. A snail under it too. This one is interesting, not sure what it is :) It is large and covers much. On a dry long gone dead spruce standing. white/gray and bit hard, the brown stuff is also part of it. It seems to have pores. Grey weather and suddenly it started to rain much so i went home, very fun anyhow! 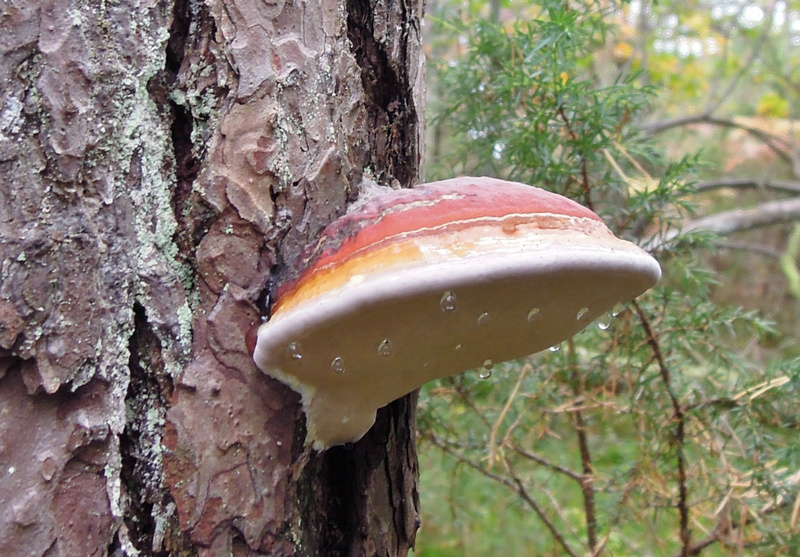 A bit earlier i got this picture when the sun looked like it was going to shine through, a beautiful Fomitopsis pinicola on pine. This pine is also dead and standing but more intact with bark and branches on. 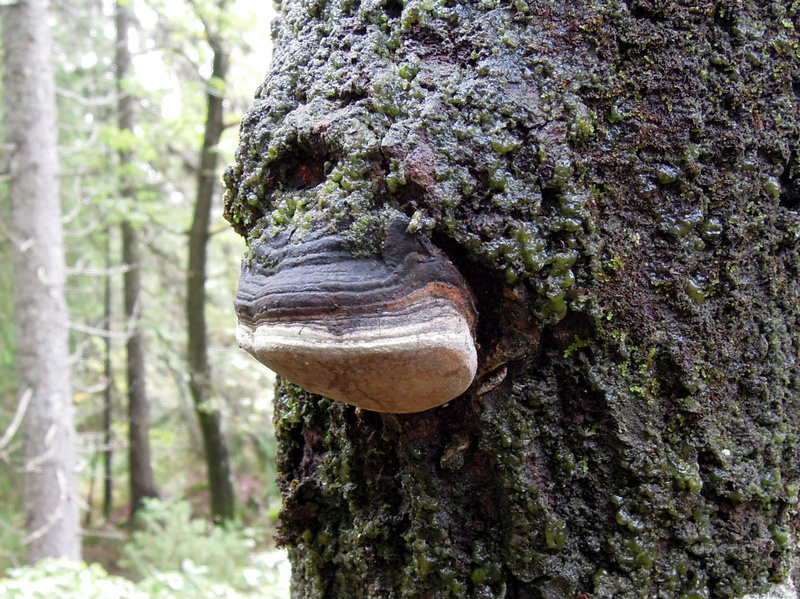 I guess this tree will be covered in Fomitopsis pinicola in time. If you look up on my Pictures page 15 then you see the Flekk-kjuke Postia fragilis that i got good pictures on the pores. My idea on type on the today find suggests Postia fragilis. How ever i am not sure and i am saving these ones. Left them safe and sound. Ps they are not low on the pine. Jung examples on the log or not developed. Observations: hard top, rather hard or corked pores. Color on top may be pale and with variations and shades. 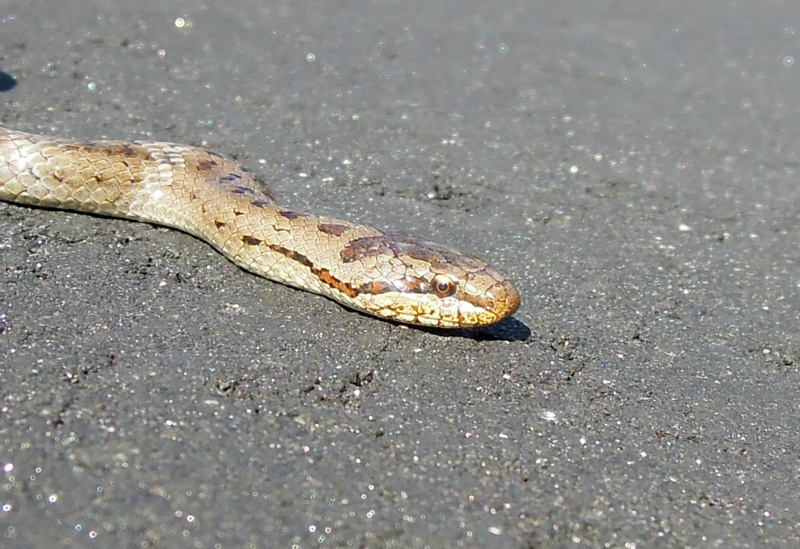 Pores are light grey to brownish when active. 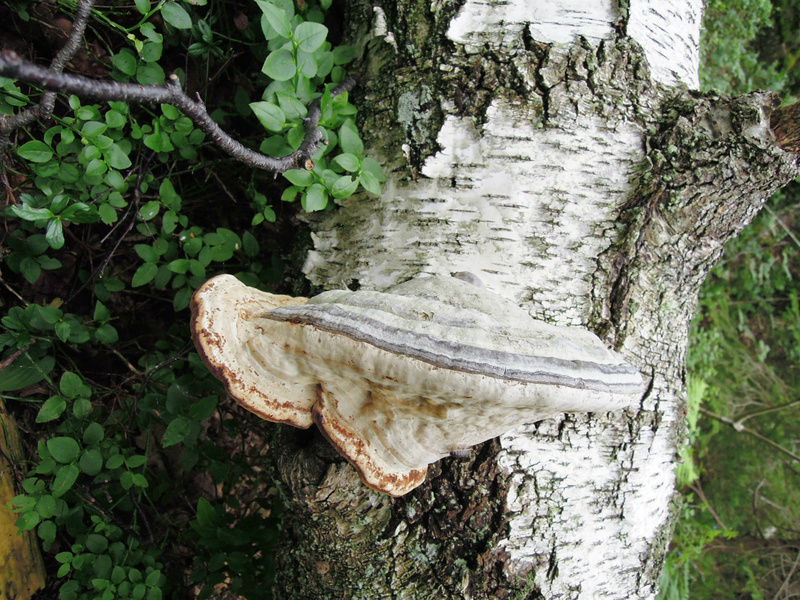 It is a several year polypore. Top got variations and some are knobbly. They vary in half disc shape and they are rather thick. Pores got light labyrinthal design. 15.10.2015 The substrate is most likely oak, standing half tree long gone. 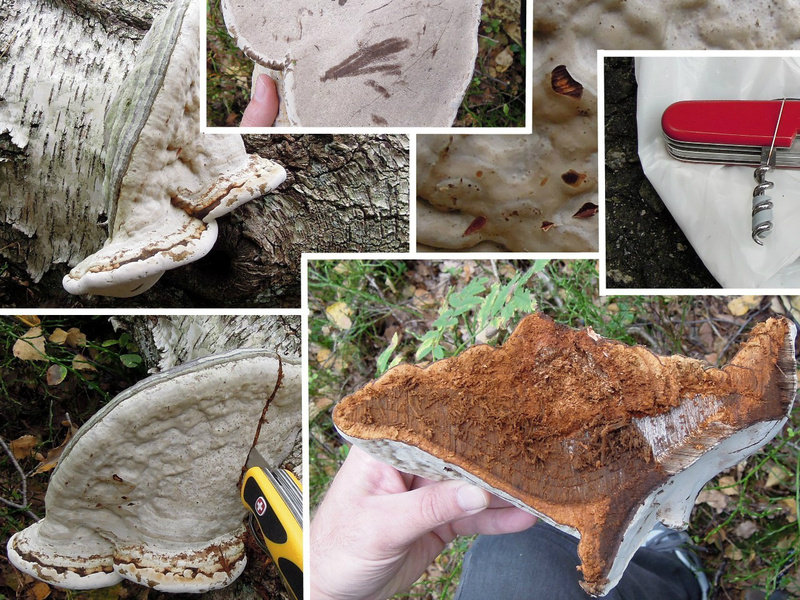 The polypore is tricky and many must be under a microscope. 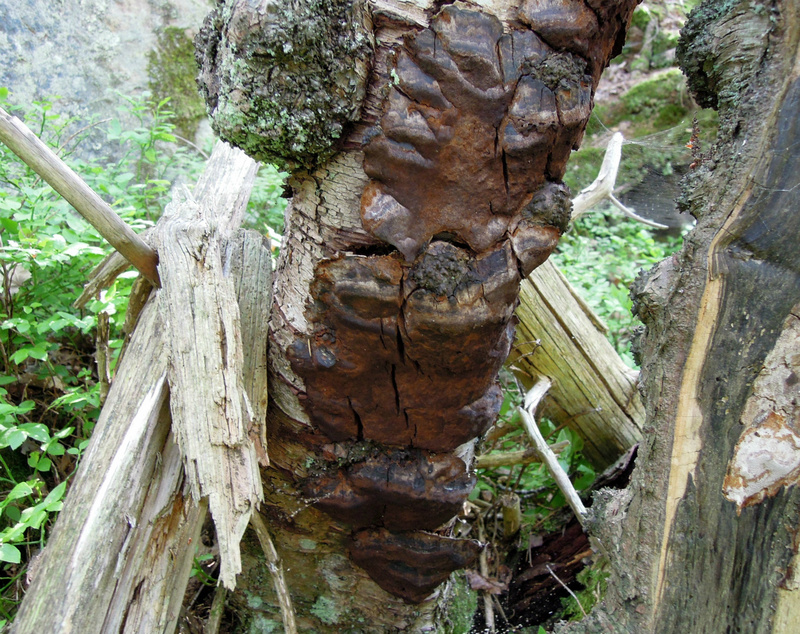 This i have a feeling is Kystrustkjuke Phellinus ferreus. I know where it is anyhow. Feel free to correct me on any details. they are very picture nice. First i wondered if it could be Daedalina quercina but i do not recall ever seeing it with hairs? 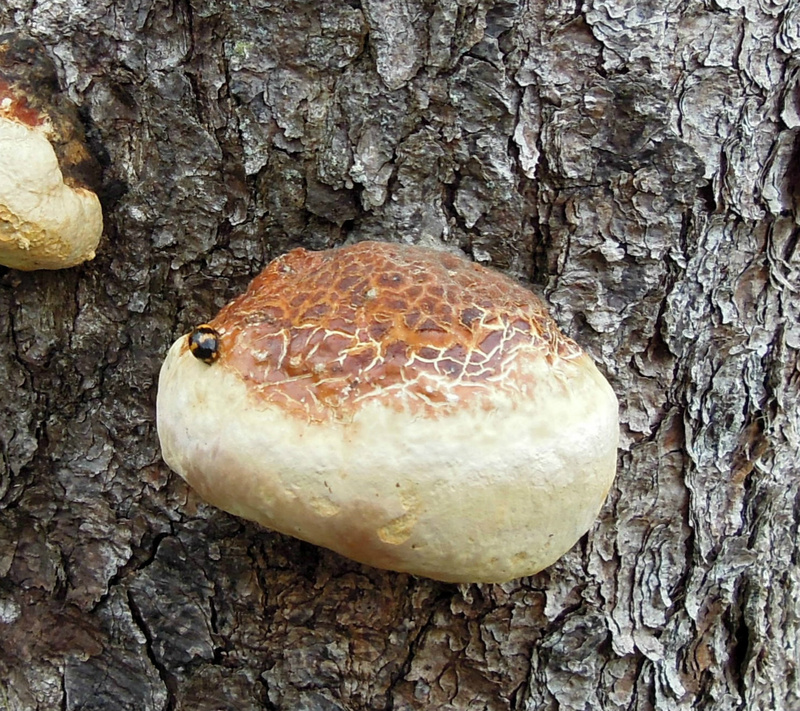 Piptoporus betulinus, the one on the right is interesting. Clearly something has been eating on it. 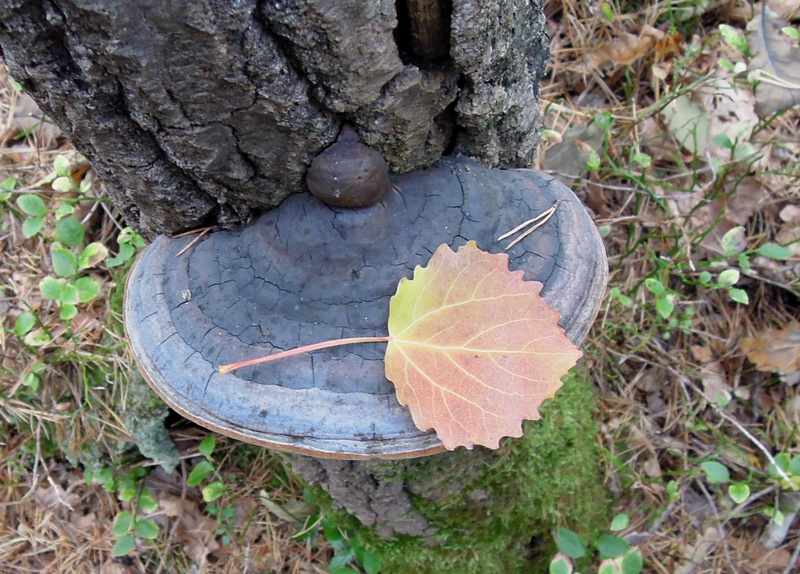 I know that siphoning fungus can live on them. In this case i am not sure what, if it is insects or an animal. The top covered in some kind of substance.